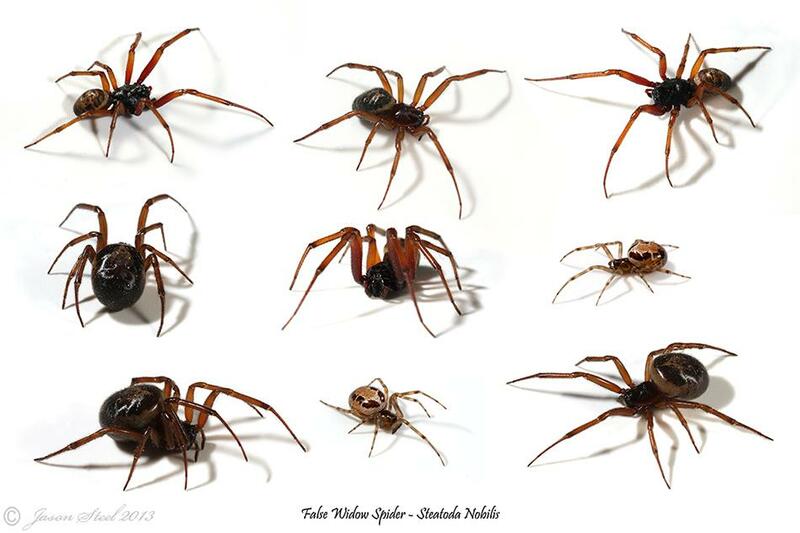 There are around 650 - 700 known species of spider in the UK. Many of these are so similar in appearance that they can only be accurately identified under a microscope. At least 14 species have been confirmed by the NHM to bite humans if handled roughly, laid / sat on or threaten. None of which are considered to be aggressive or dangerous to Humans though. 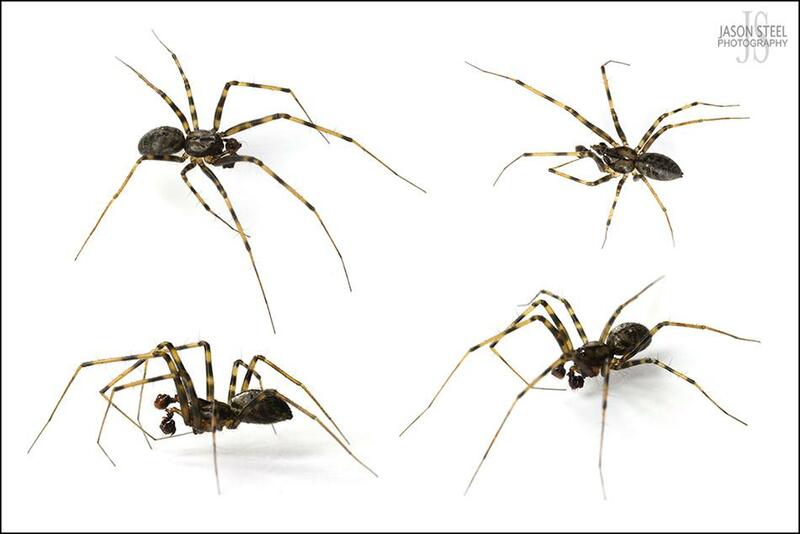 Spiders play a vital role in stabilising the numbers of other insects that are a nuisance to Humans, including gnats, mosquitoes, wasps and flies. 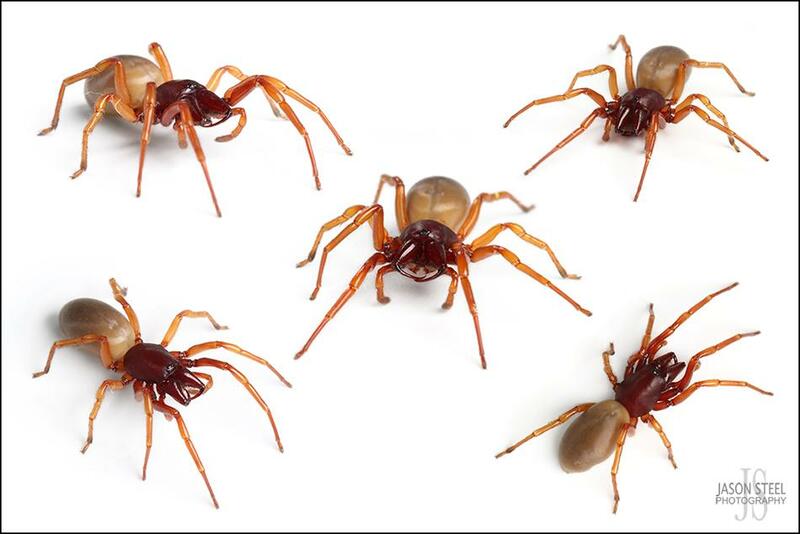 Despite being in the UK for over 100 years the Noble False Widow Spider has recently gained an undeserved reputation which has been generated by sensationalized stories in the media such as these during 2014. These stories are usually completely exaggerated and based on little fact. Rarely has the accused spider been caught for a positive identification and severe reactions from bites are nearly always caused by infection (usually introduced by scratching the bite with dirty hands) and not from the spider itself. "False Widow Spider ate my leg!" "False Widow Spider bites teen in cinema" "Flesh-eating monsters are still here" "False Widow Spider ate my foot"
"False Widow Spiders are eating Dad alive" "False Widow Spider bite could kill" "Killer spiders ate my leg" "False Widow Spider made my leg explode"
"False Widow Spiders attacked my little girl" "50 False Widow Spiders invade home" "Killer Spiders invade Britain" "False Widow Spiders close school"
Sub-adult male Noble False Widow Spider that still has its striped legs and doesn't yet have the black cephalothorax (upper body / head). False widow webs are a messy tangled scaffold of silky threads. 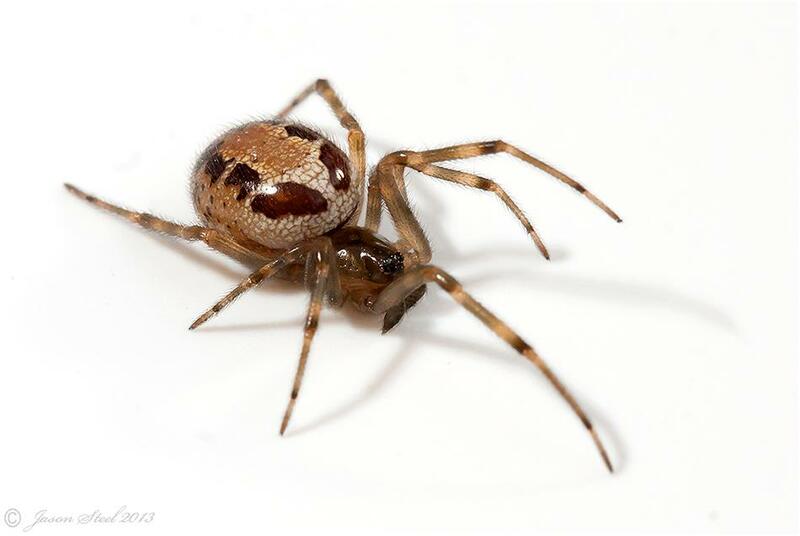 The Noble False Widow Spider is primarily a nocturnal species and at night can often be spotted hanging upside down in its messy hammock style web. 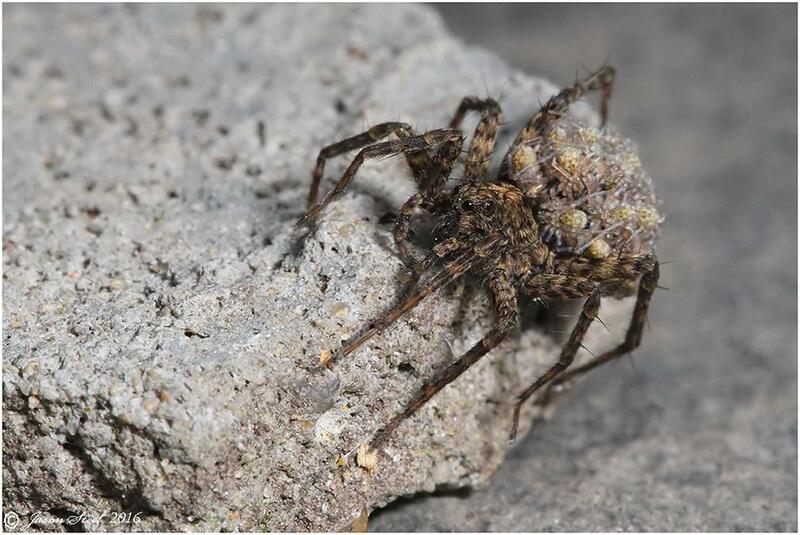 During the day the spider usually hides away in a crack or crevice in the adjoining wall. 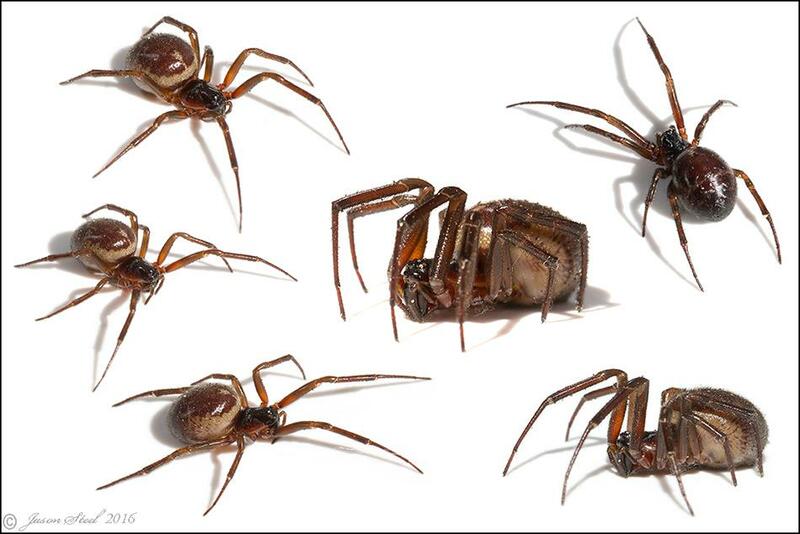 False widow spider bites are rare. In most cases a bite is often considered to be no more painful than a bee or wasp sting. Symptoms can include pain, swelling and reddening surrounding the bite area. Sometimes this can be accompanied by nausea and breathing issues depending on the victim's sensitivity to the venom. Most severe cases that include severe swelling and ulceration are caused by infection to the wound. Usually symptoms disappear within 3 days. If symptoms are severe then you should seek medical assistance. In all cases wounds should be cleaned and a disinfectant applied to reduce the risk of infection. Antibiotics should only be taken in the case of infection otherwise they are not needed. An ice pack may be applied to reduce swelling and pain. Avoid scratching or rubbing the bite area as again this could increase the risk of infection. 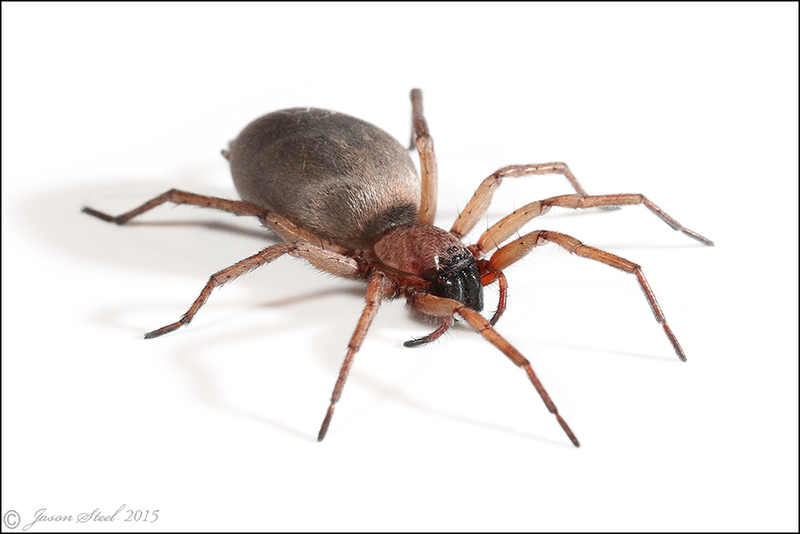 Another of the False Widow species sometimes found in the UK, with a body-length of around 15mm and a leg-span of up to 35mm. Steatoda paykulliana is a new species from the Mediterranean that sometimes finds its way to the UK in amongst grapes and other fruit. At the moment this species has only been found living wild in areas around Plymouth and Tilbury Docks in Essex. This female specimen is unusually skinny due to it having just produced and egg-sac, which it was guarding when I found it under a large rock (not in the UK). 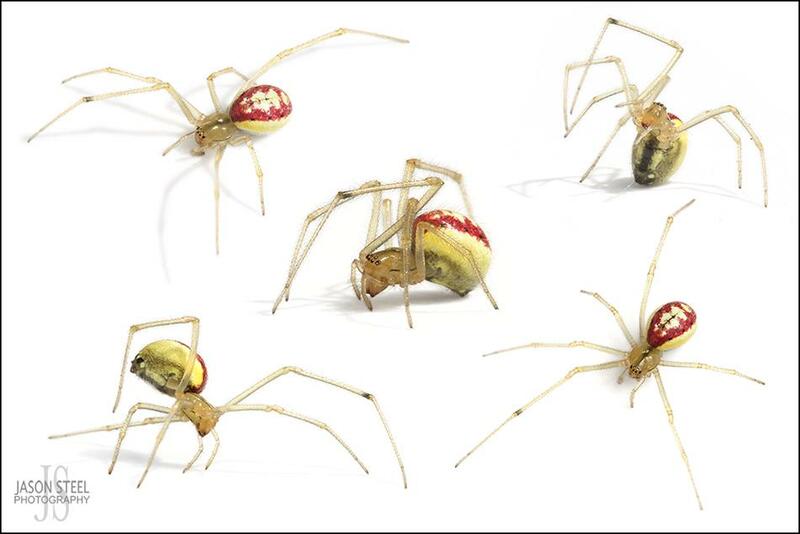 These spiders can have a red, yellow or white band around the abdomen. 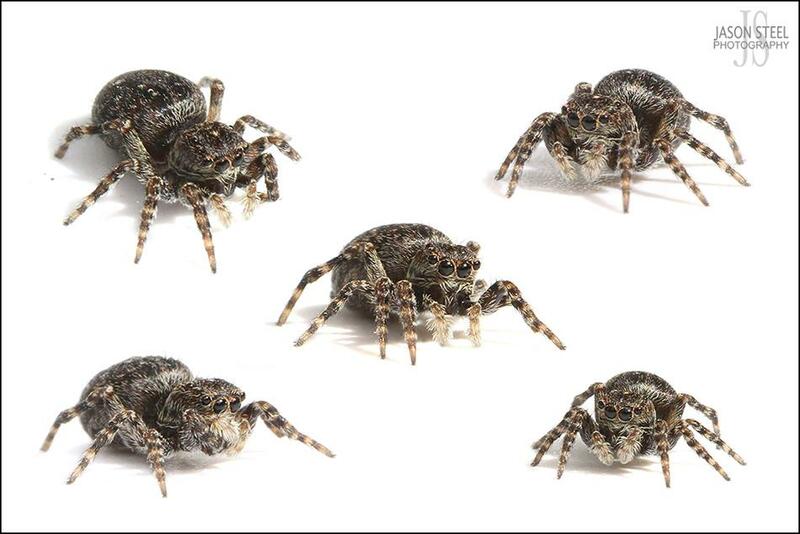 There are nearly 40 species of Jumping Spider in the UK. They are recognised by their square-fronted carapaces and large forward-facing eyes. They can use this ability to 'jump' to catch prey or evade predators. 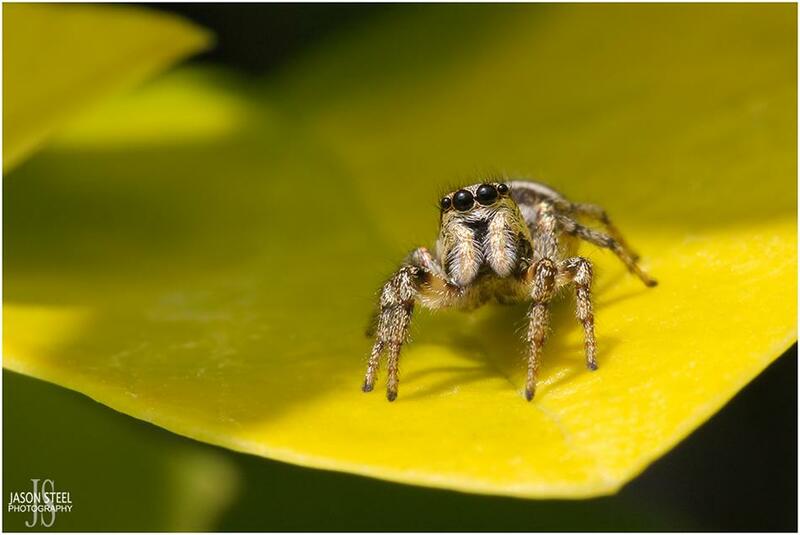 Most Jumping Spider species in the UK are diurnal and prefer dry sunny locations. They can often be readily identified by their short jerky movements when walking. 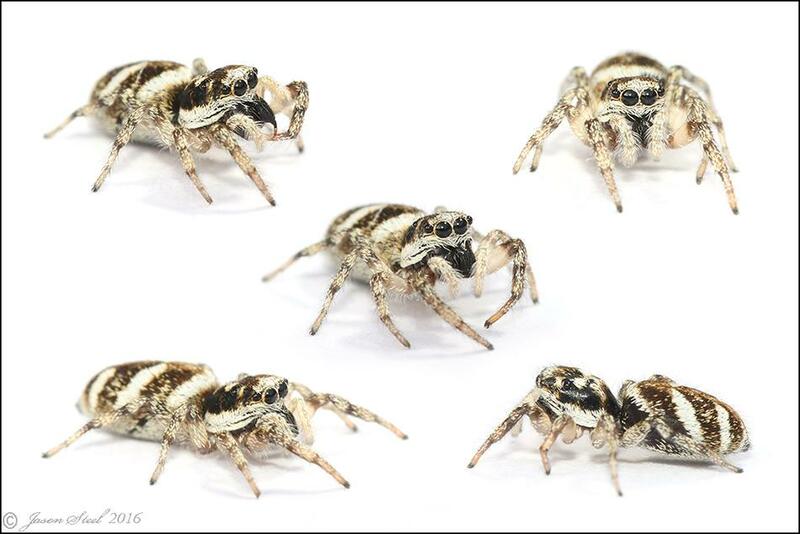 The Zebra Jumping Spider is a common jumping spider found across the UK, often in urban and suburban areas. They can also been found on heathland and farmland sites too. They are often seen sunning themselves on walls, rocks, tree-trunks or fences. Jumping Spiders do not make webs. Instead they jump onto their prey with great accuracy and quickly inflict a lethal venomous bite to their unsuspecting victims. They are reported to jump up to 10cm, but I have observed one jumping almost twice that distance in a downward direction landing directly on a fly which was killed instantly with an immediate bite. Males can be distinguished from females by the possession of huge jaws which they use for wrestling with each other to compete for mating rights to a female. 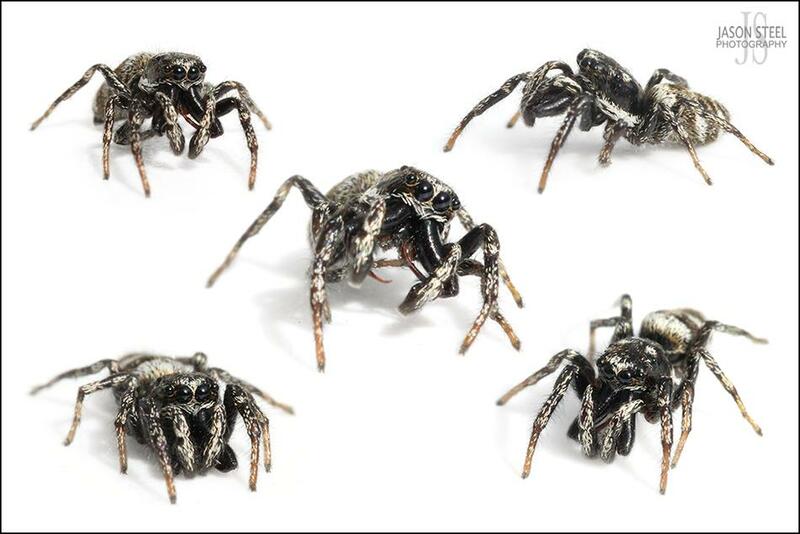 Another widespread jumping spider found across England, usually in residential areas. They have an average body-length of 4-6mm. 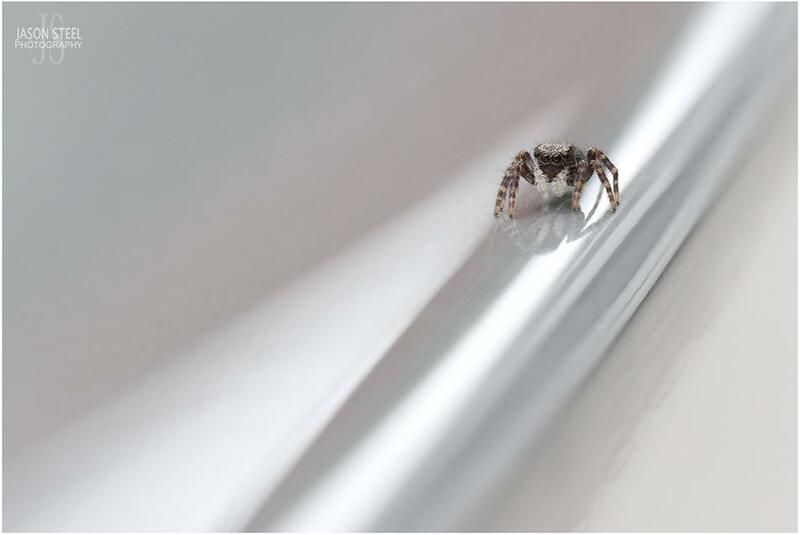 A small Jumping Spider with a maximum body-length of around 5mm. The palps and legs are a lemon-yellow colour contrasting against the dark body. This species is usually found on shrubs and other low / medium height vegetation or low branches of trees, with a preference to sunny spots. 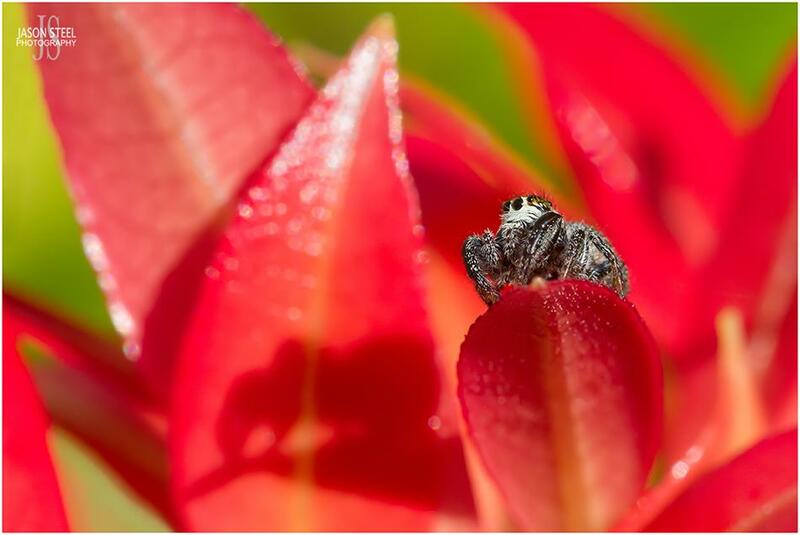 A small Jumping Spider with a maximum body-length of around 4.5 - 5.5mm for females and 3 - 4mm for males. The body is usually dark brown and fairly flat, and the legs are light brown / orange. Light brown specimens do also occur. Found mostly in the SE of England but scattered sightings are recorded across England and Wales. Favours woodland habitat especially Oak. It spins a silky retreat on the upper side of bushes and small trees. 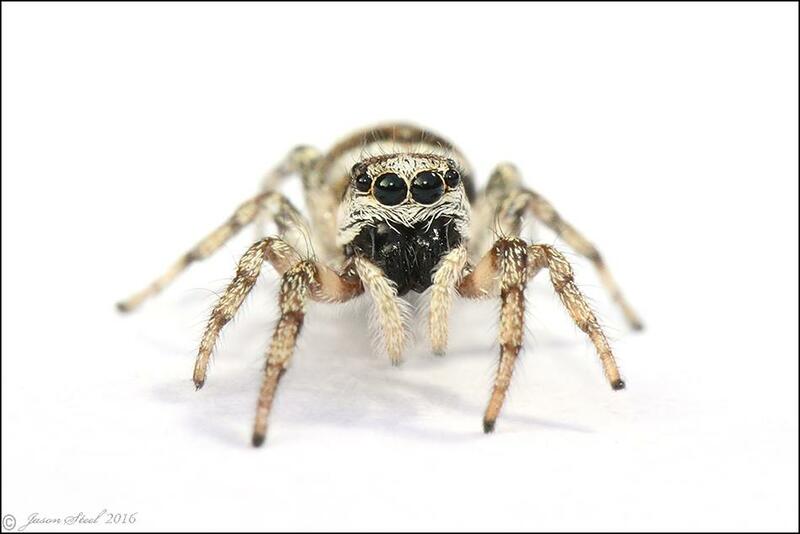 This Mediterranean Jumping Spider has been recorded at several sites in the SE of England. This one was photographed in my garden in SE London in April 2019. Previously found on Pine Trees, Gorse, Privet and Hawthorn. 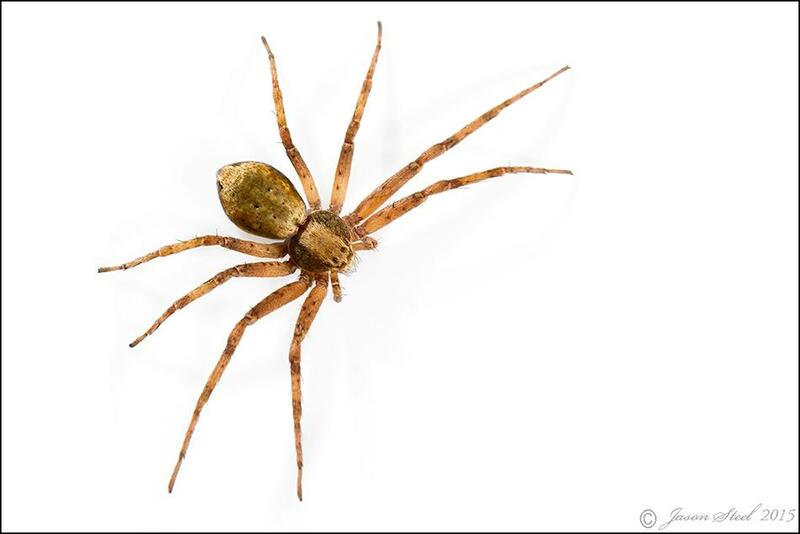 This spider has a maximum body-length of around 5 - 7mm for females and 4 - 6mm for males. Pseudeuophrys lanigera or the Fleecy Jumper as it is sometimes known, is a very small species of Jumping Spider with a maximum body-length of 3-4mm. They are often found on the tops of sunny high walls and roofs of buildings. They also often turn up inside buildings on ceilings, especially once the weather gets colder. This species is scarce in the north of the UK but becomes more common in the south. This Fleecy Jumper has class. It was found living under the rear light of my Porsche Cayman S, and photographed "in-situ" as is wandered along my car's rear bumper. 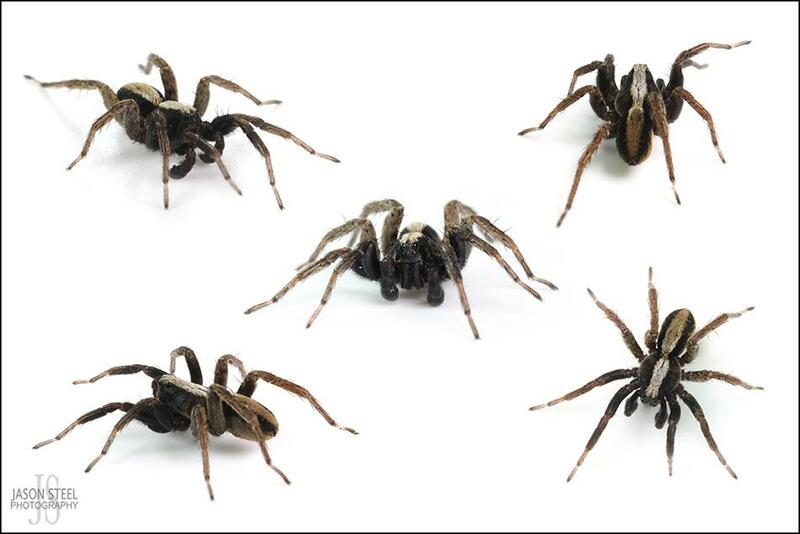 The Spotted Wolf Spider is a member of the Lycosidae family which has over 2400 species. 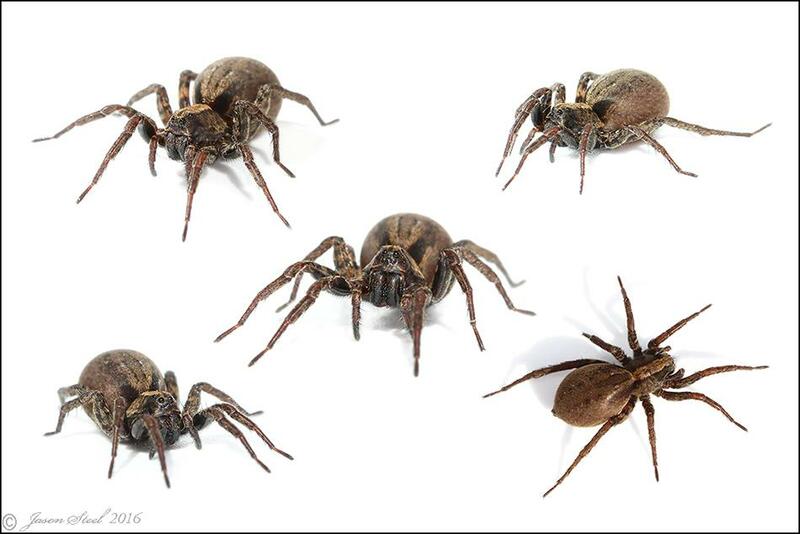 Several of these species of Wolf Spider live in the UK and they are very difficult to tell apart. 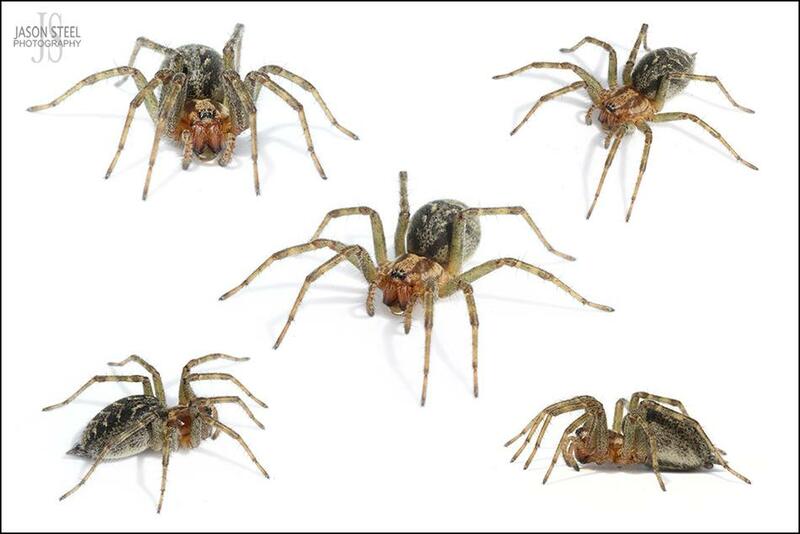 Wolf Spiders get there name because they actively hunt down their prey rather using webs. 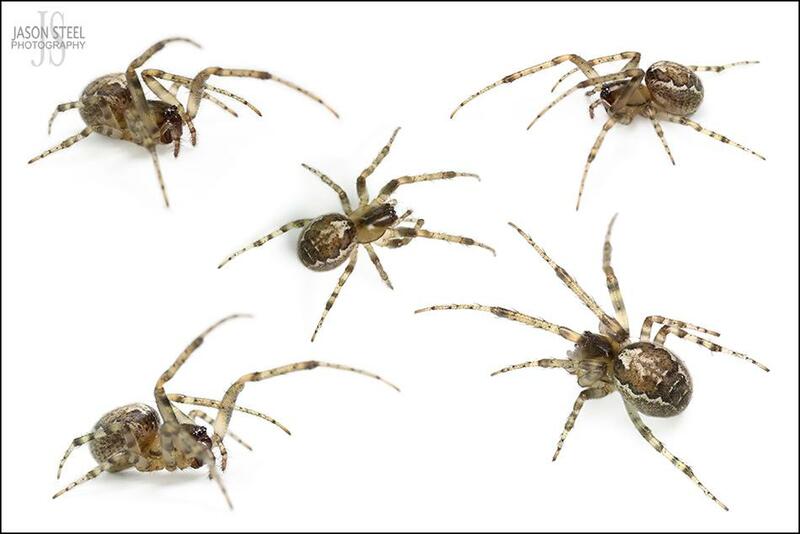 Spotted Wolf Spiders are very fast runners enabling them to chase and catch their prey. 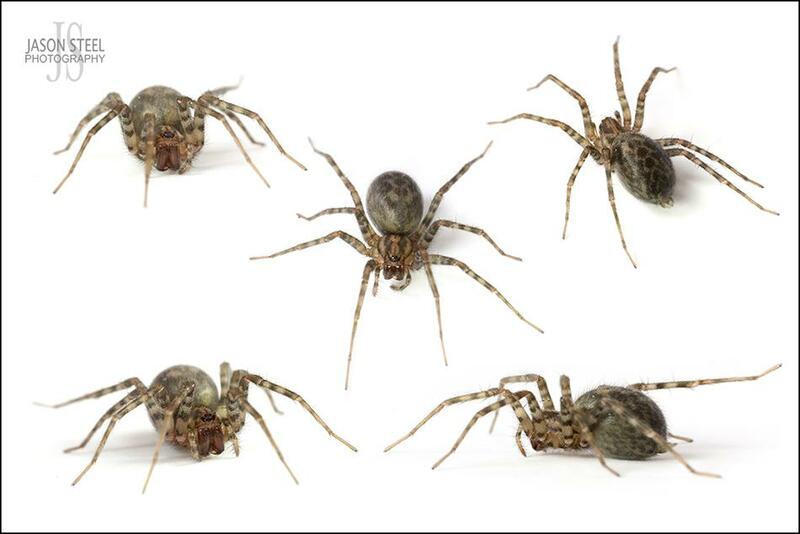 Females carry their egg-sac at the base of their abdomen held on by the spinnerets. 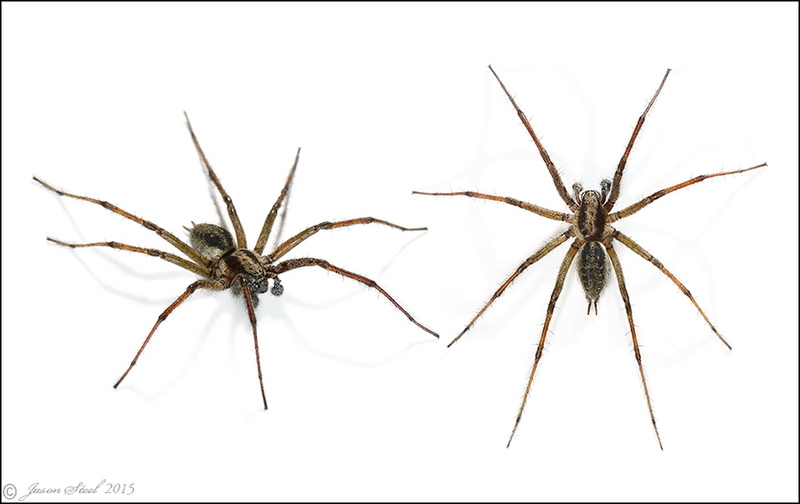 Two of the eyes of a Wolf Spider are considerably larger than their other eyes and these spiders have excellent eye-sight. 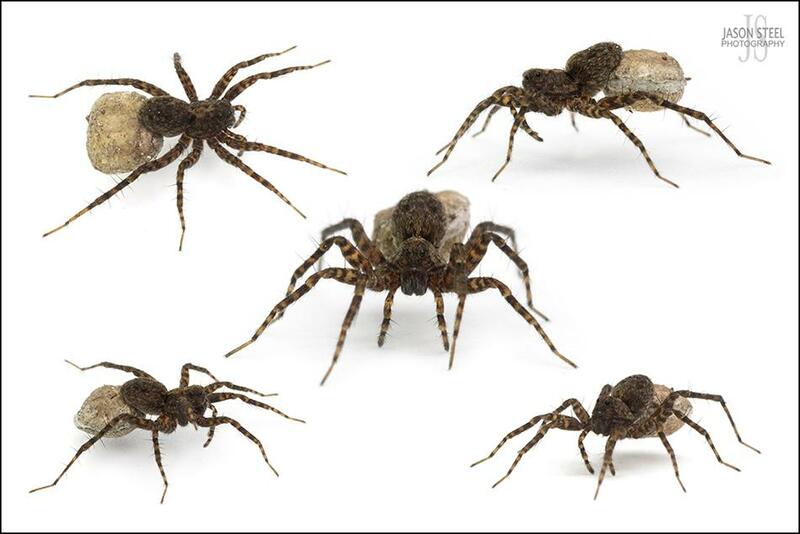 When the egg-sac hatches, the female Wolf Spider carries dozens of tiny spiderlings on her back and under her abdomen for several days. The Common Fox Spider is a another Wolf Spider from the Lycosidae family which has over 2400 species. 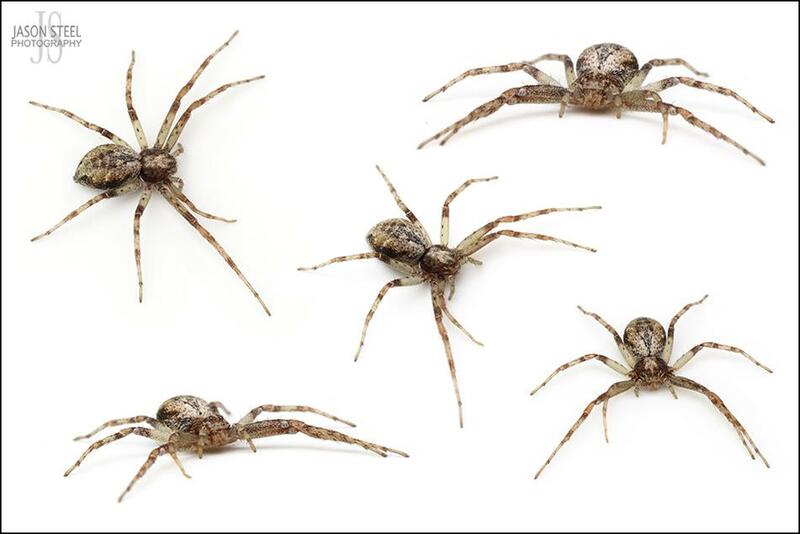 This is one of the most common Wolf Spiders found across the UK and is usually encountered in May or June, but can be seen anywhere from spring to autumn. Many other species from the Alopecosa family can look identical without very close examination. 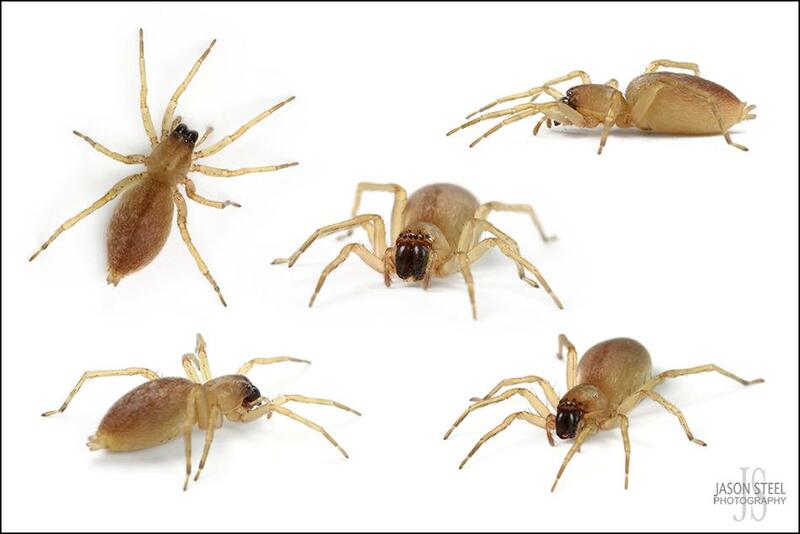 They are fairly small spiders with a body length of 5-10mm, and a leg-span of 10-20mm. 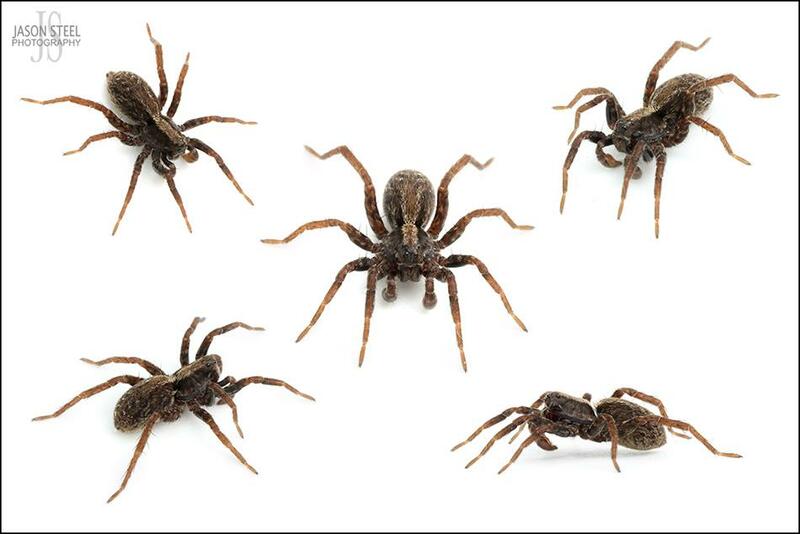 Like many Wolf Spiders that chase down their prey, these are very fast runners for their size. 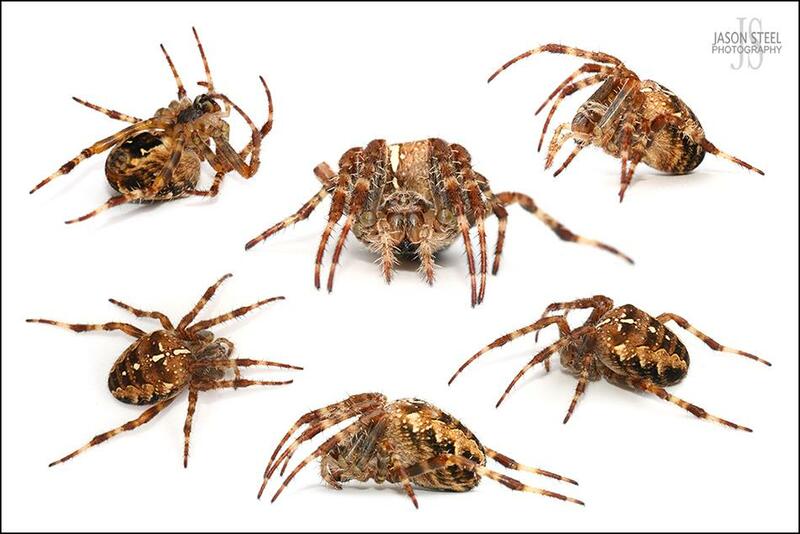 The Easter Fox Spider is a another British Wolf Spider. A small spider with a body length of around 4mm for males and 6-7.5mm for females. Found in a variety of habitats but most frequently encountered in grassland, and forest edges. They are also a regular sighting in gardens under logs and stones, and in meadows beneath overhanging grass tussocks. Most are found at ground level but some are seen on taller vegetation too. 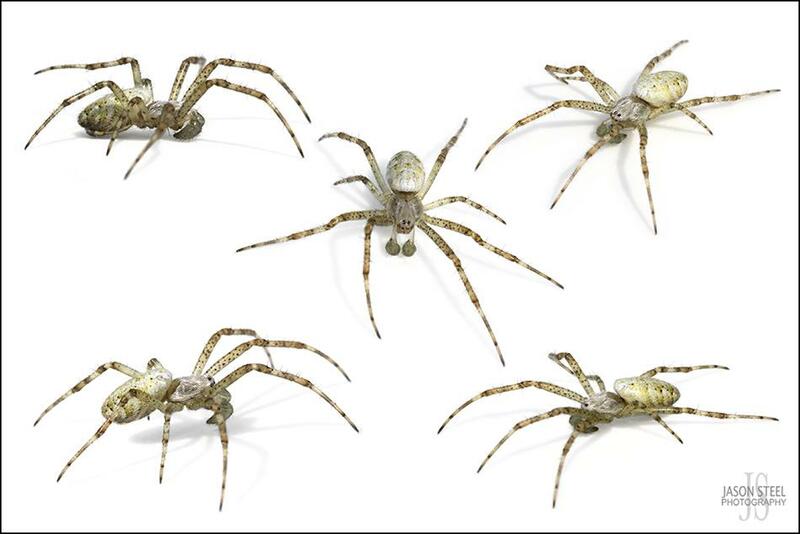 These spiders can be found all year round but are most regularly seen between April and May, and then peak in October. The Common Hammock-Weaver is a widespread member of the Linyphiidae family. It's a small spider with a body length of around 6mm and a leg-span of up to 20mm. The males are slightly smaller. These spiders build a small horizontal web in bushes and low vegetation where they are usually seen hanging upside down in the centre during the day in late summer and autumn. One identifying feature is the tuning-fork-shaped mark on the carapace behind the eyes. 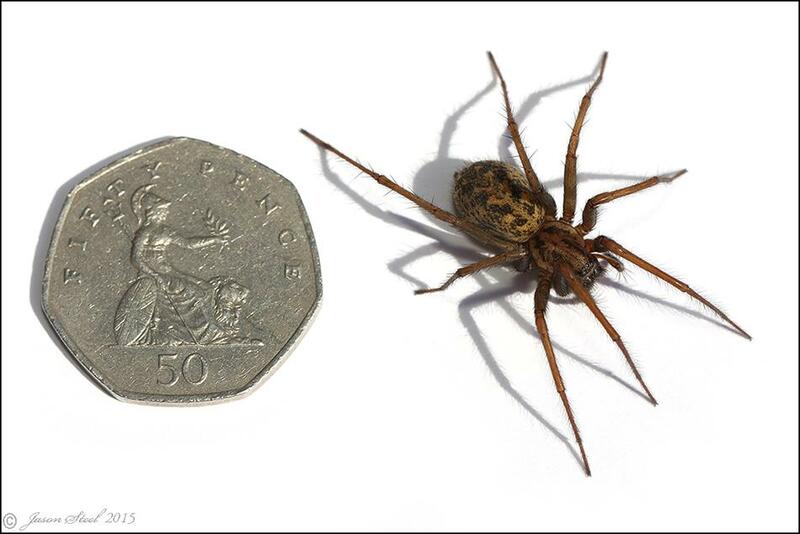 A small spider found across the UK in damp shady places in gardens, woodlands, grassland, trees and logs. Adult body-length ranges from 4 - 6.5mm. A small sheetweb weaving spider, with a maximum bodylength of 4mm for males and 4.5mm for females, and a leg-span of around 12mm. Widespread cross England and often found in cooler and damper areas of buildings such as cellars or outhouses. Also found in farms and gardens under logs and stones. 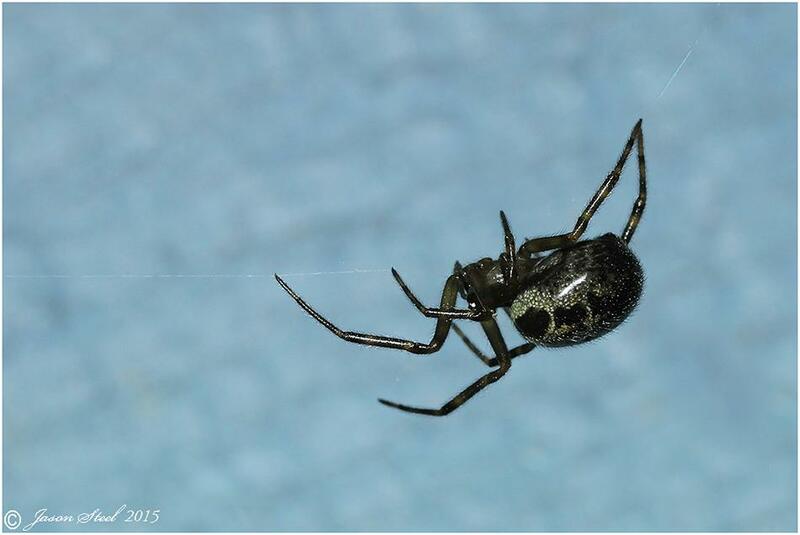 A small orb weaving spider, with a maximum bodylength of 11mm for females and 7mm for females. Widespread across the UK especially in the SE of England. Often found in warmer areas on the outside of buildings and window frames. Adult Missing Sector Orb Weavers build an orb web with two of the upper sectors missing connecting threads. Between these two bare sectors is the signal thread which leads to the spider's hideout. These spiders sit in the middle of their web during the evening and night time, and web repairs are done in the early hours of the morning. Both species of Missing Sector Orb Weaver can only be distinguished under a microscope. 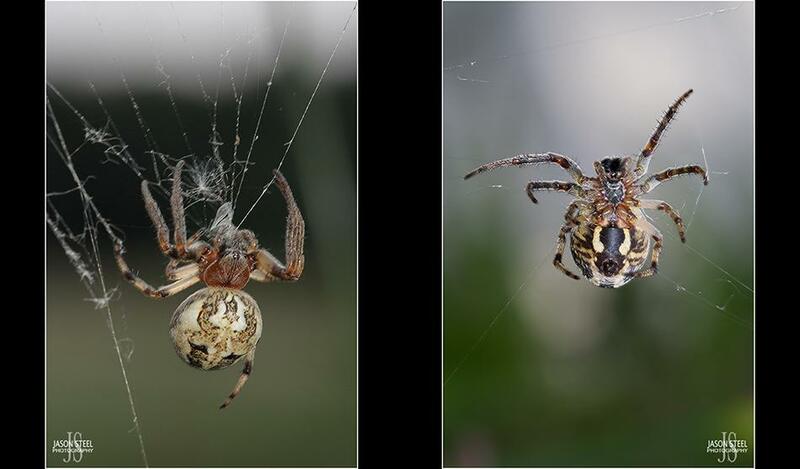 Both Zygiella x-notata and Zygiella atrica Missing Sector Orb Weavers can be difficult to tell apart. 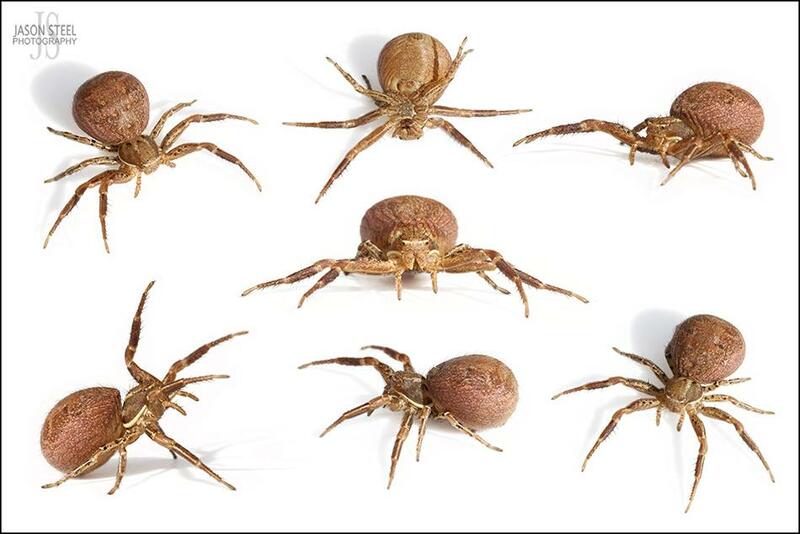 However, if a specimen has dark grey patches at the front of the abdomen either side of the midline, then the spider is likely to be Zygiella x-notata. If the dark patches are pinkish red then the spider is likely to be Zygiella atrica. 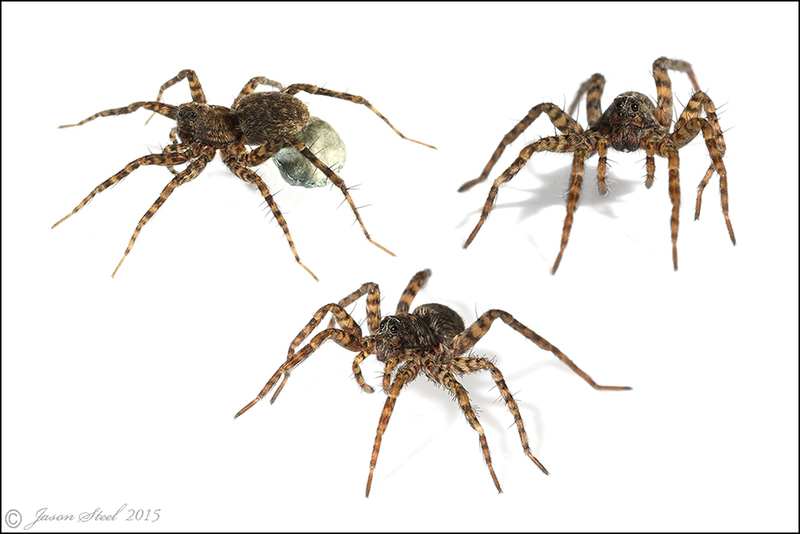 The abdomen of this species is highly variable in colour as the three images above demonstrate. They can range from grey, silver, gold, brown or red. But all have the leaf shaped pattern on the top of the abdomen. The two very similar Bark Sac Spiders (Clubiona comta and Clubiona corticalis) prefer to hide themselves away beneath cracks and loose edges of tree bark, especially conifers. Sac Spiders produce a silken sac to hide away in. At night they actively hunt down their prey. Adults grow to 7-10mm in body-length. 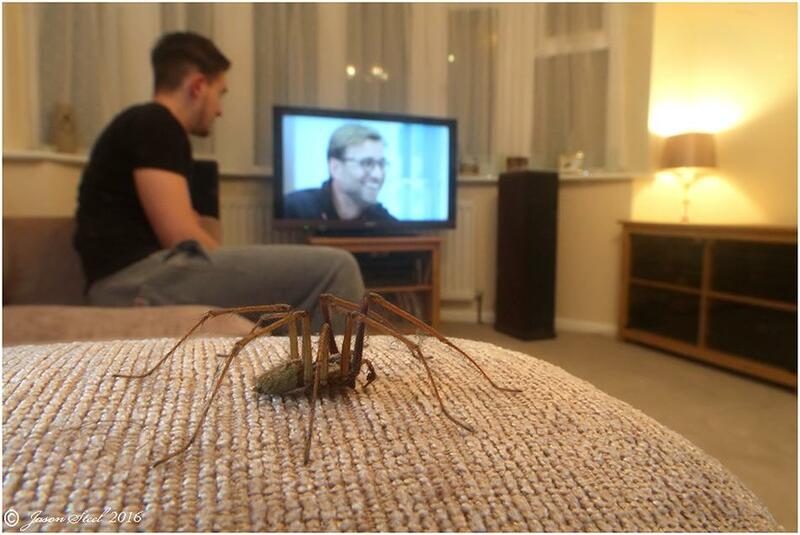 Occasionally these spiders do find their way into homes and although small these spiders have been known to bite humans. When photographing this spider it repeatedly jumped into the air by an inch or two whenever I approached it with my camera. This jumping behaviour is typical of this species and is used as a form of defence. 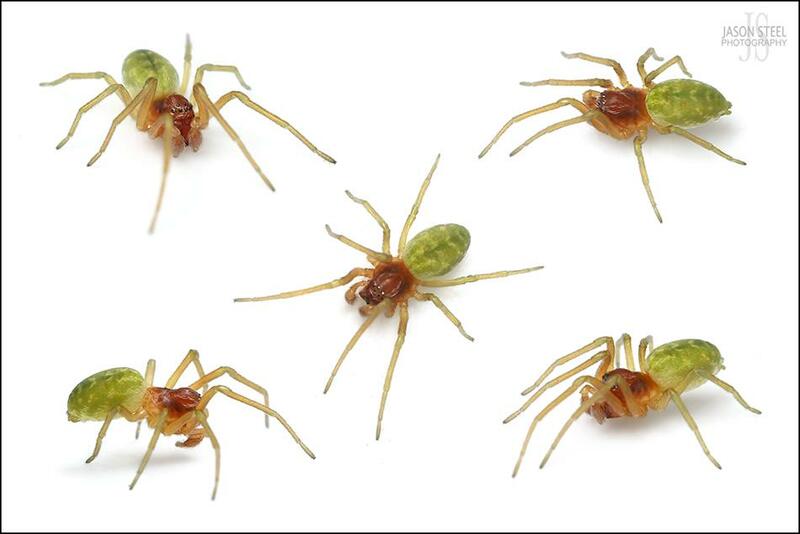 Females can look similar to young Stone Spiders (Drassodes Sp.) however the Stone Spider's upper two eyes are much closer together, and the spinnerets are more splayed apart. 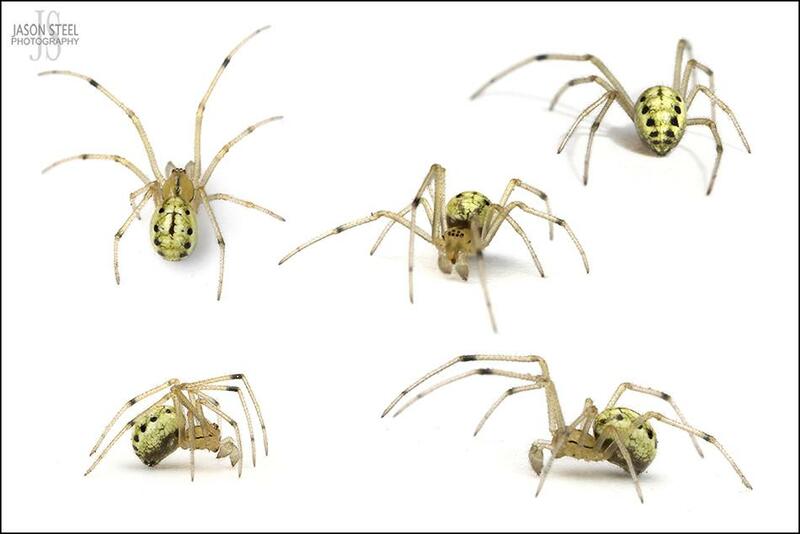 There are two very similar species of Green Orb-Weaver Spider in the UK that can only be identified with a microscope. 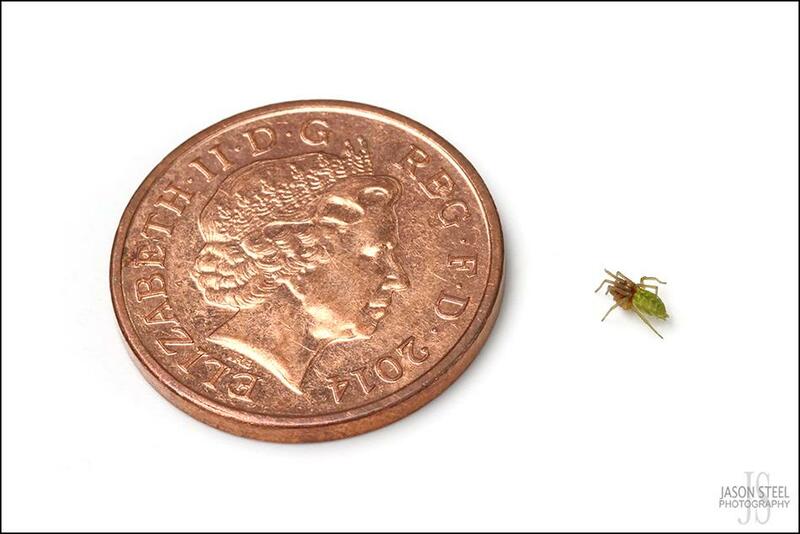 The Green Orb-Weaver Spider is very small with a body length of only 4-6mm. 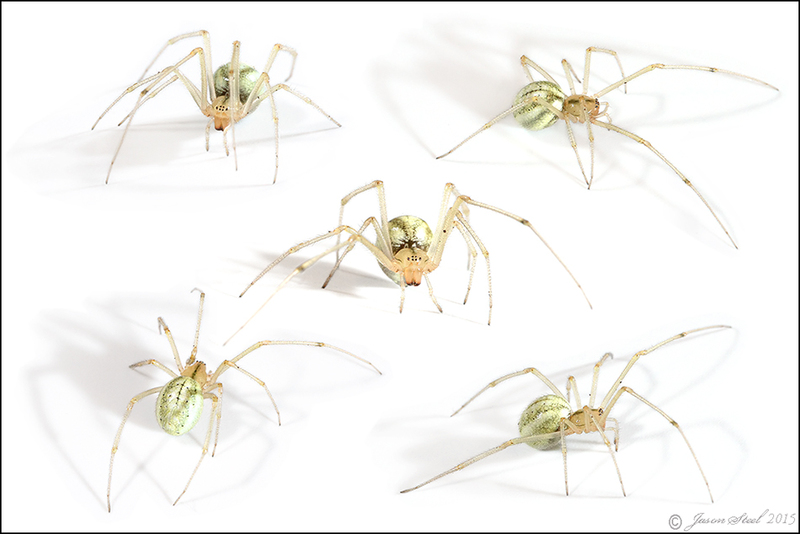 Green Orb-Weaver Spiders are a common native species that can be found throughout the UK and northern Europe. 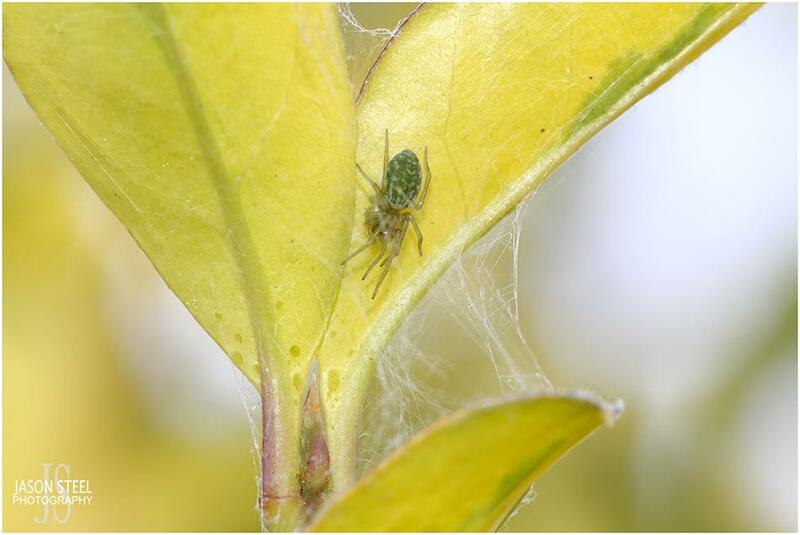 Despite their bright and almost fluorescent green colour theses tiny spiders can hide well camouflaged amongst bushes, plants and hedgerows. They usually go completely unnoticed until they stray from their usual habitat onto white uPVC windows or door frames in residential areas. 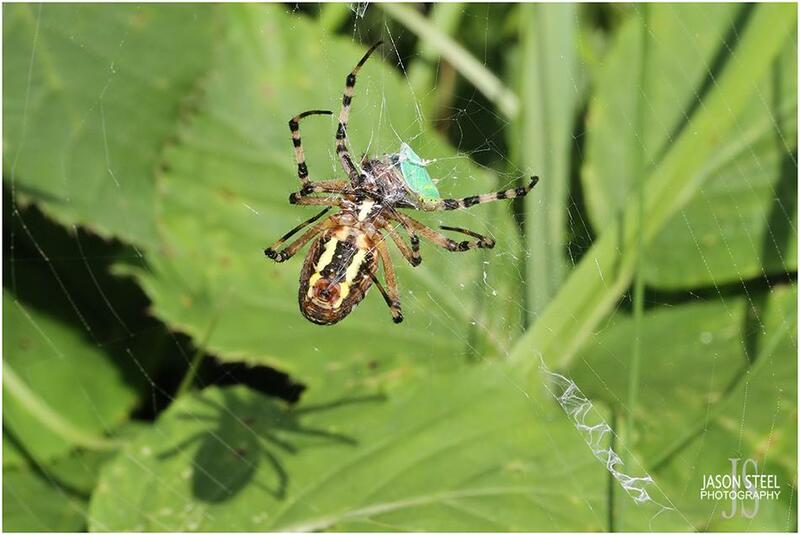 The abdomen is bright green / yellow with small black dots. The underside of the abdomen also has a red spot, but this can fade in mature specimens. Young spiders may have a red spot on their head as well. Newly hatched spiderlings are red but their colour changes to brown before the autumn arrives. 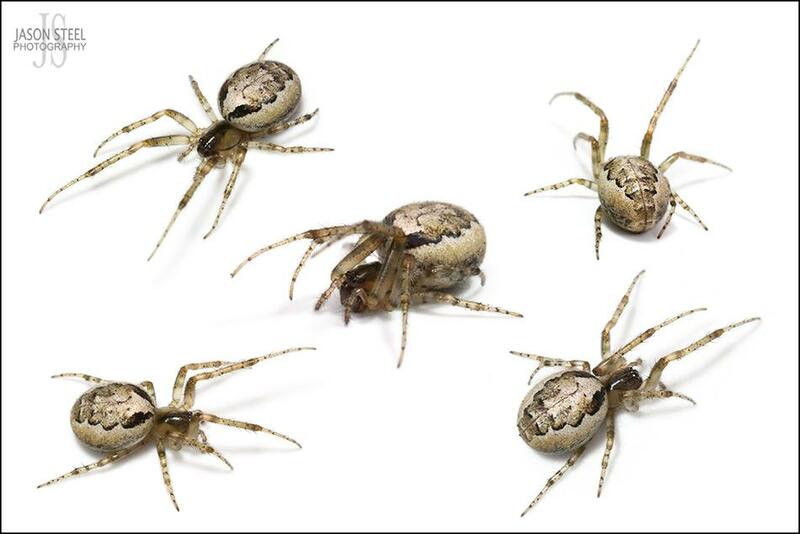 The Candy Stripe Spider is a member of the Comb-Footed Spider family. 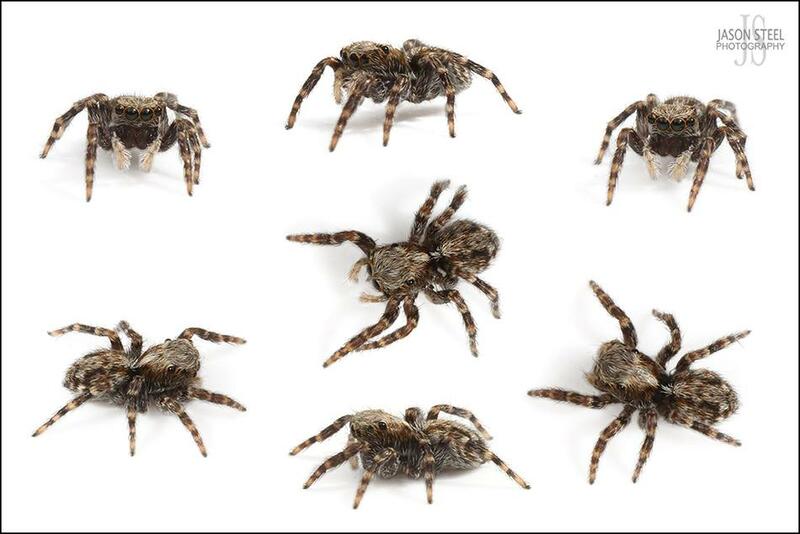 This small spider is common throughout the UK and resides in low vegetation habitat such as grassland, hedgerows and bushes. The female pictured above grows to a maximum body length of 6mm with a leg-span of 16mm whilst the smaller males only reach 4mm in body length. 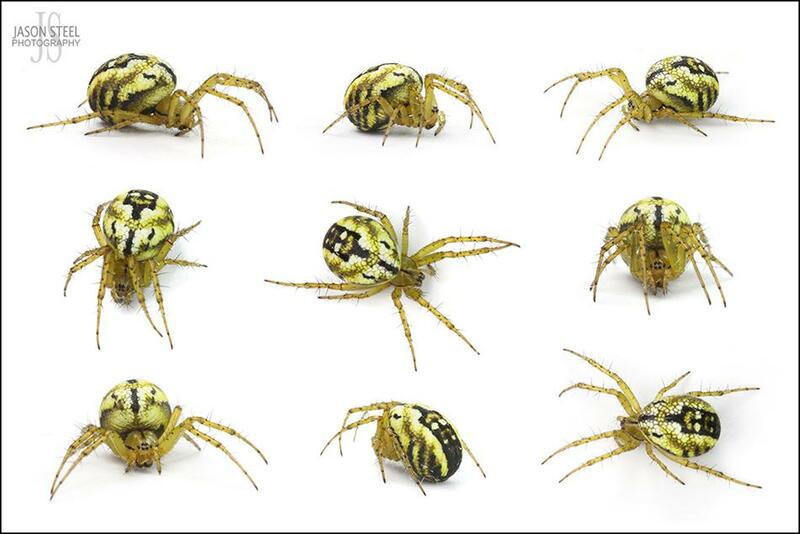 Both sexes are similar in appearance and come in several different colour morphs, The abdomens can be either pale green (or white) sometimes accompanied with green stripes and black spots, or yellow, or pale with two red stripes and black spots or pale with one bold red stripe and black spots. Legs are semi-translucent in all colour morphs. The Candy Stripe Spider often builds a scrappy cob-web style web (a loose disorganised mess of threads) on low-lying plants. This red morph of the Candy Striped Spider was photographed in late June wandering in my garden on low vegetation. Despite only having six legs, this specimen was coping just fine with its missing limbs. 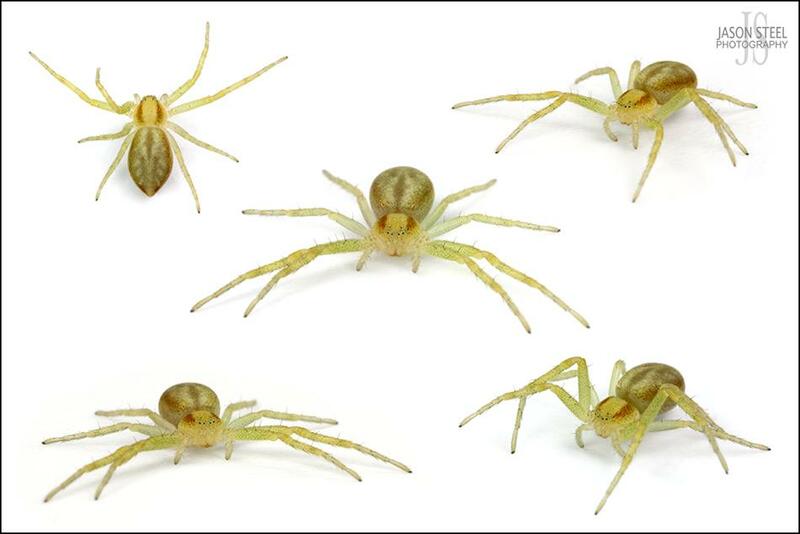 Specimens with a single red / pink stripe are nearly always Enoplognatha latimana as opose to Enoplognatha ovata. 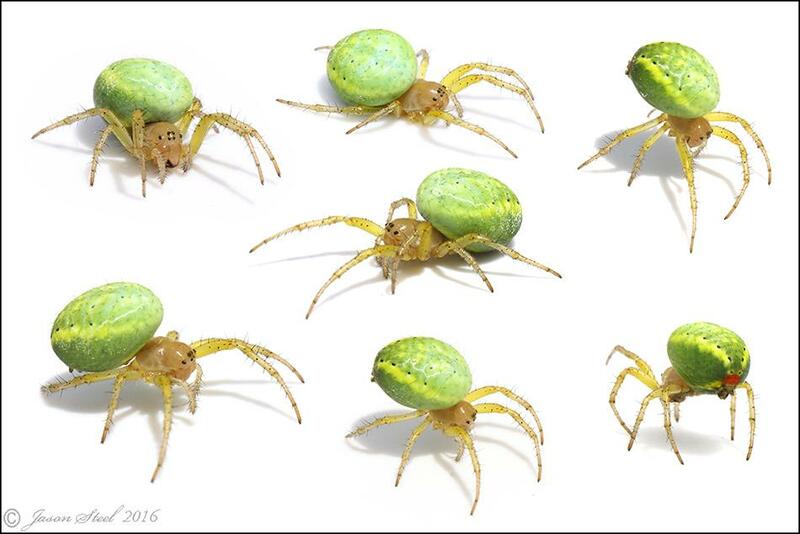 The Green Leaf Web Spider has a maximum body & head length of 5mm. The specimen above had a total legspan of just 7mm. They are usually only seen in London and the surrounding area but occasional sightings have come from as far north as Staffordshire. They can be found from May to November, although August to October is when most are seen. It is believed that this spider may have been introduced accidentally by Kew Gardens as early as 1880. Females are entirely green but males have a brown head. These tiny spiders build a silky web across the surface of leaves to catch their prey. They are frequently found on Lilac although the specimen above was found on a Privet bush. 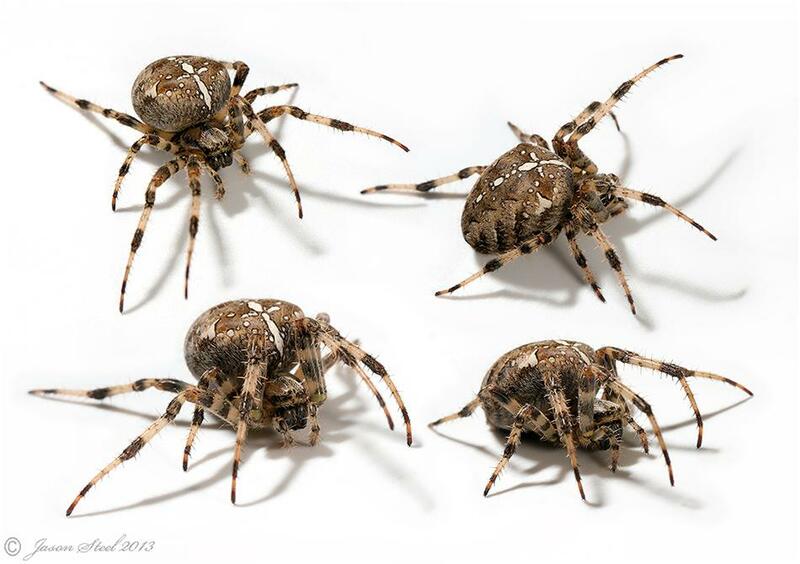 These spiders are common in Southern Europe. Male Green Leaf Web Spider next to a 1p coin to show how incredibly small these spiders are. Female Green Leaf Web Spider at the top of a Privet Bush. A commonly found orb-weaver spider in most types of habitats including gardens. They are a small spider with a body-length of 7-8mm. The abdomen can vary in colour from orange, yellow and red to dull light brown. Males are usually darker. 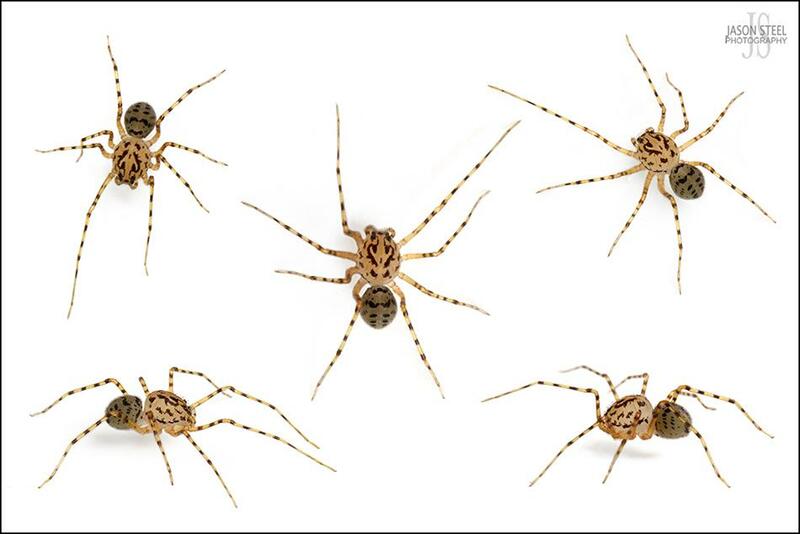 When disturbed these spiders can lay with their legs fully stretched out in-font and behind them, giving rise to the name "Stretch Spider". When stretched out like this they can have a leg-span of up to an inch in length. 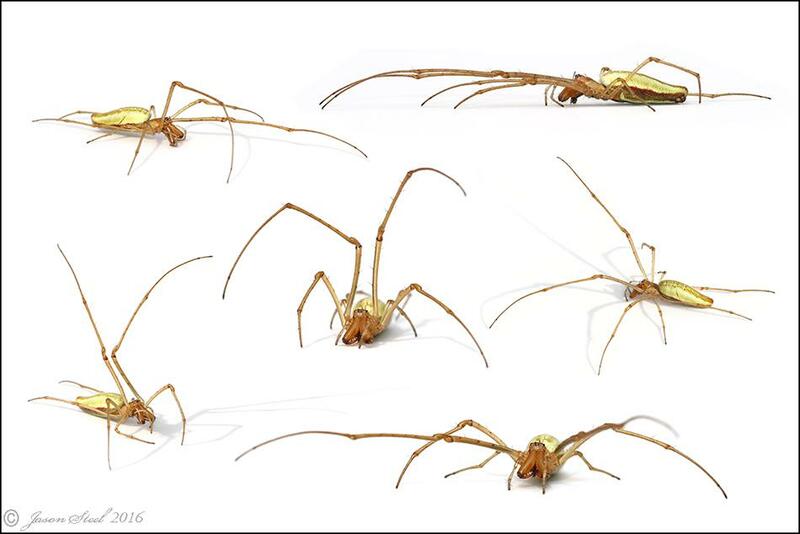 These spiders belong to the Tetragnathidae family. 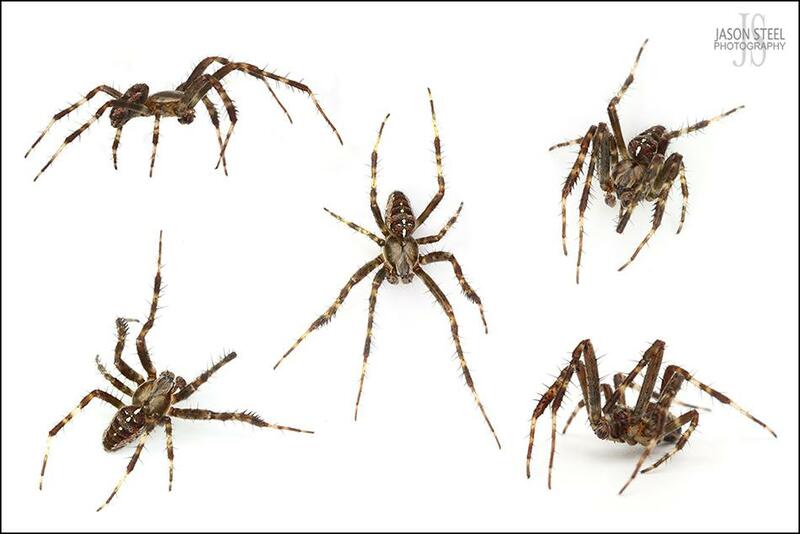 Nursery Web Spiders are a group of spiders belonging to the family Pisauridae. 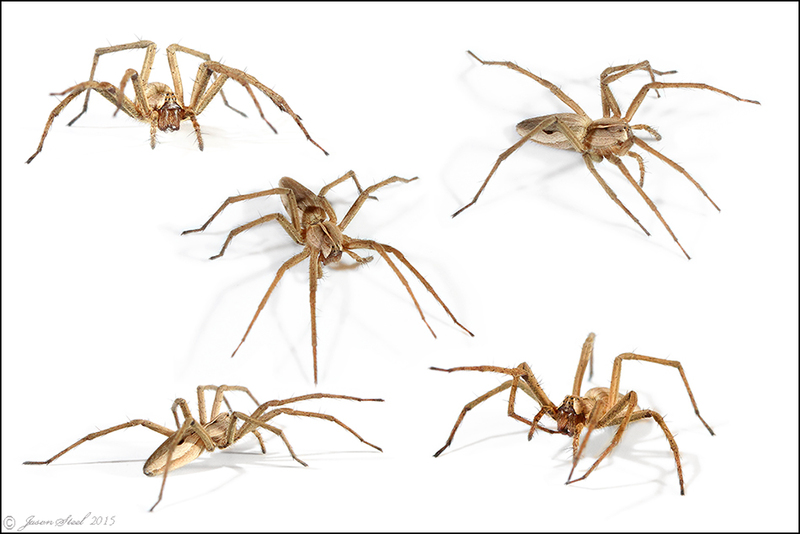 However this term is usually used to describe the European species Pisaura mirabilis. 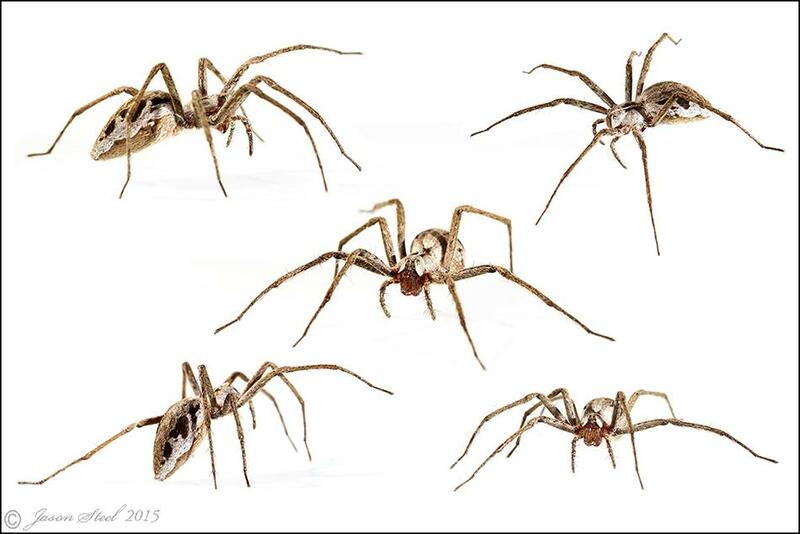 These spiders are grey or brown and are similar to Wolf Spiders. 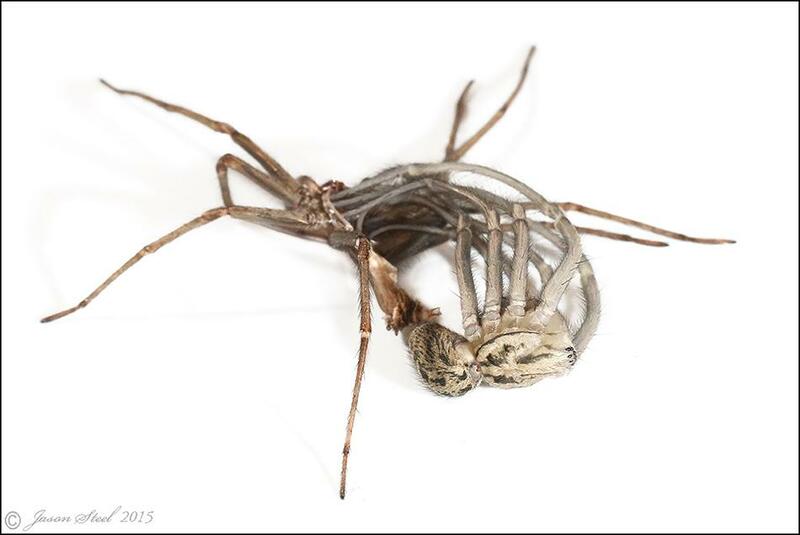 However unlike the Wolf Spiders which carry their egg-sac attached to their spinnerets at the rear of their body, the Nursery Web Spider uses its jaws and pedipalps to carry the egg-sac beneath its body. The Nursery Web Spider gets its name from its watchful guarding of its young. When the egg is due to hatch it is fixed to a plant and then covered in a silken tent. 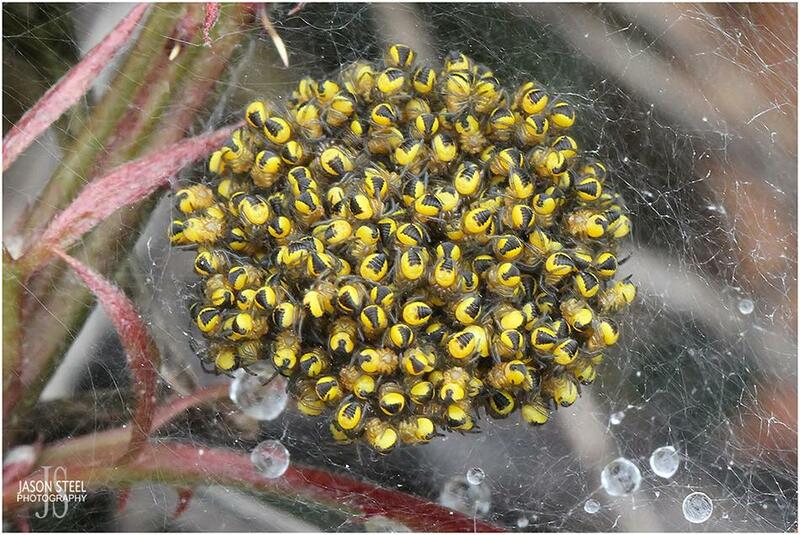 The adult spider then stands guard over the spiderlings until they have all dispersed from the tent. 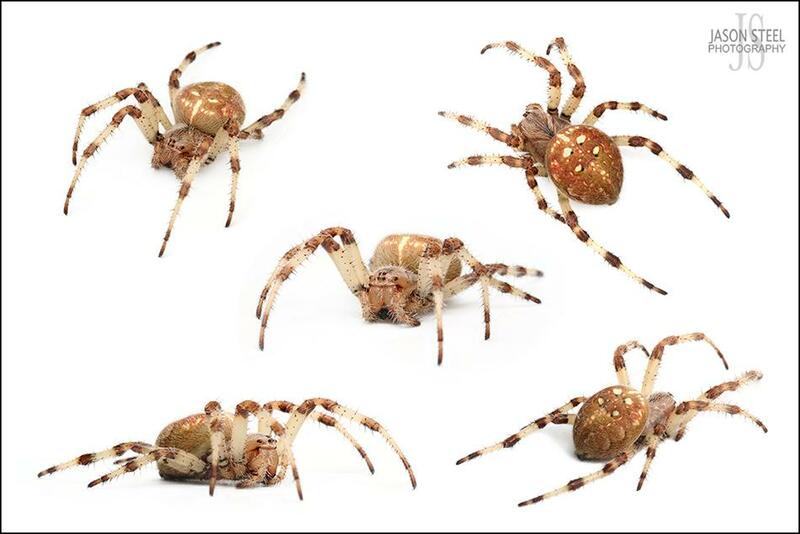 These spiders do not spin a web to catch their prey. 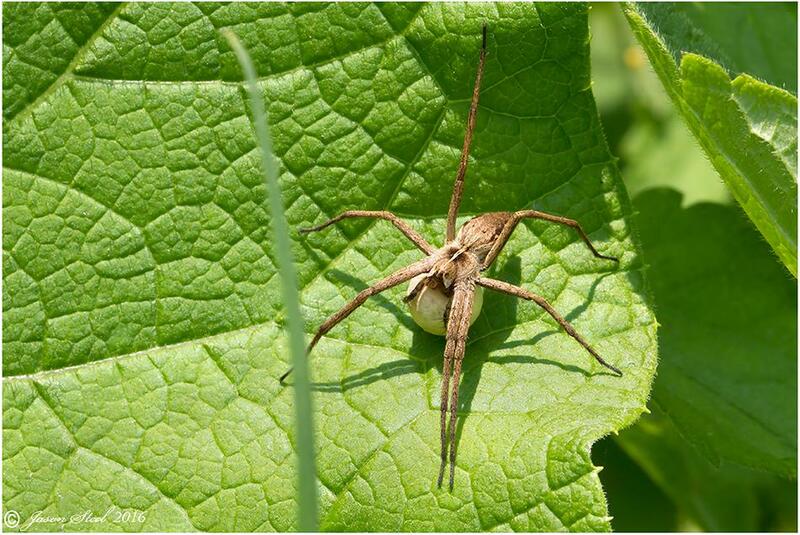 Female Nursery Web Spider basking in the sunshine with egg. The Stone Spider is fairly common across the UK. 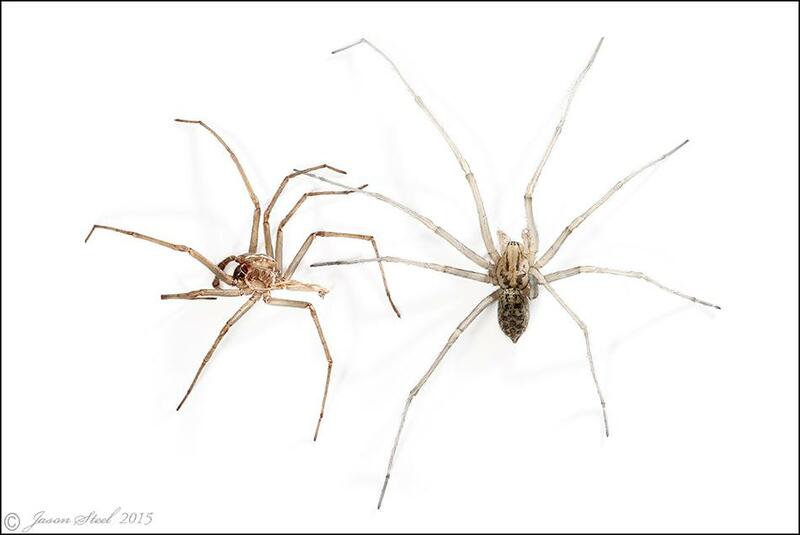 The females grow to a usual body length of around 18mm with a 30 - 40mm leg-span. They are normally light brown / grey in colour with an elongated abdomen, light brown legs, large black jaws and a velvety appearance. 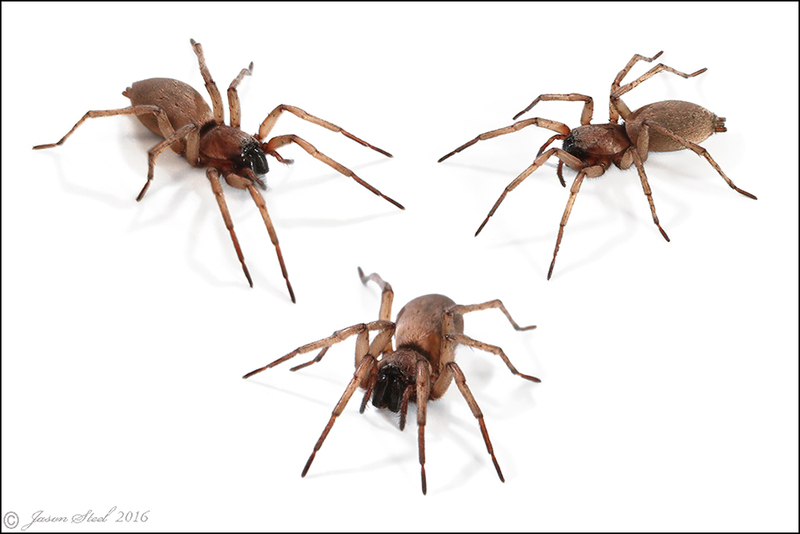 The four long tubular spinnerets at the back of the abdomen are helpful in identifying these species. 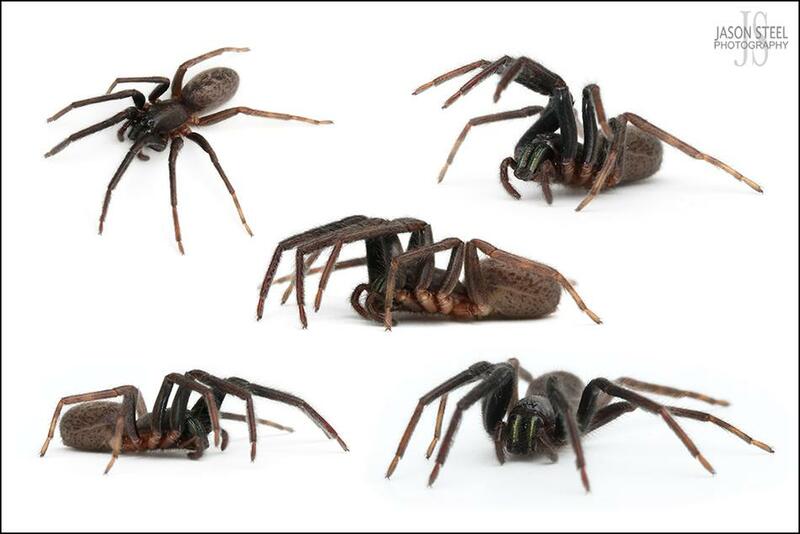 These spiders are nocturnal hunters. They do not make a web but during the day they do hide themselves in a web-based silky sac. Account of Stone Spider bite. 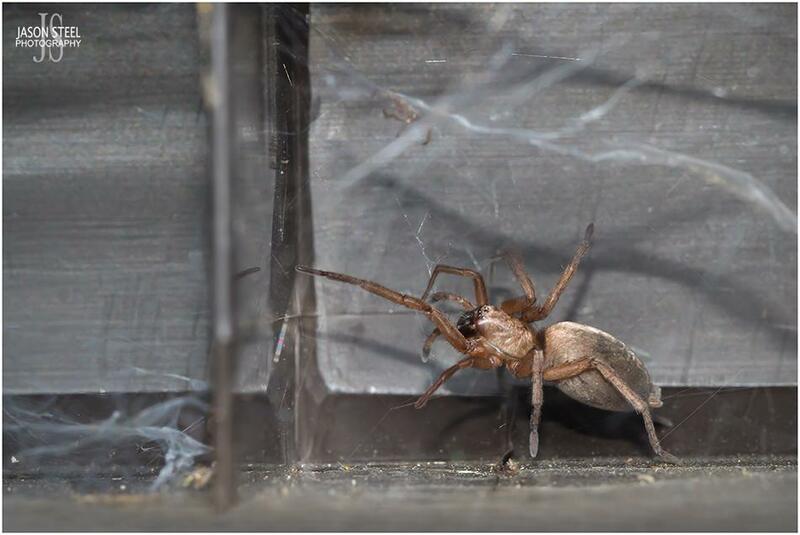 Female Stone Spider living in my garden shed in SE London / North Kent. This was an unusually large female Stone Spider specimen which was very pale in colouration and had a body length of 19mm. Various body parts of a spider, illustrated on a Stone Spider. 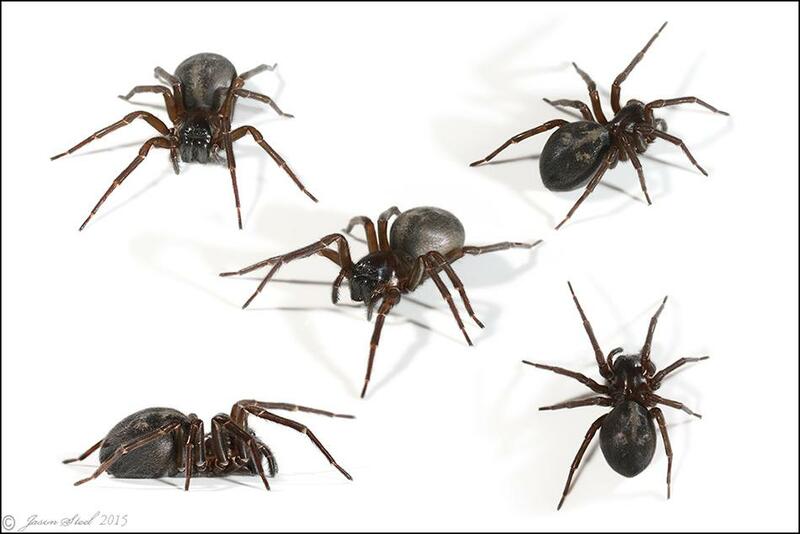 Feeding mainly on Woodlice, the Woodlouse Spider has very powerful jaws capable of piercing Woodlice shells without difficulty. 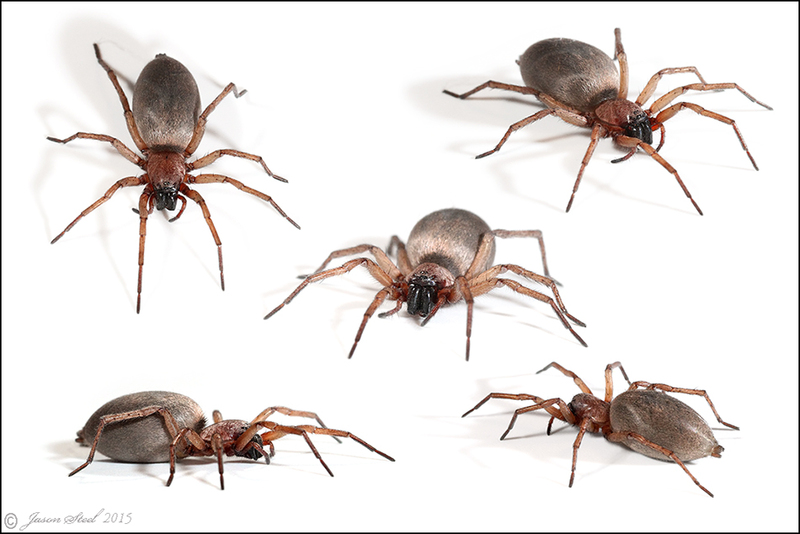 Woodlouse Spiders are usually found in dark ,damp places such as under logs or rocks, or anywhere else you might find Woodlice. This is a fairly common species across the UK with the SE of England having the strongest concentration of the species. They are a regular find by both gardeners and builders due to their habitat preferences. 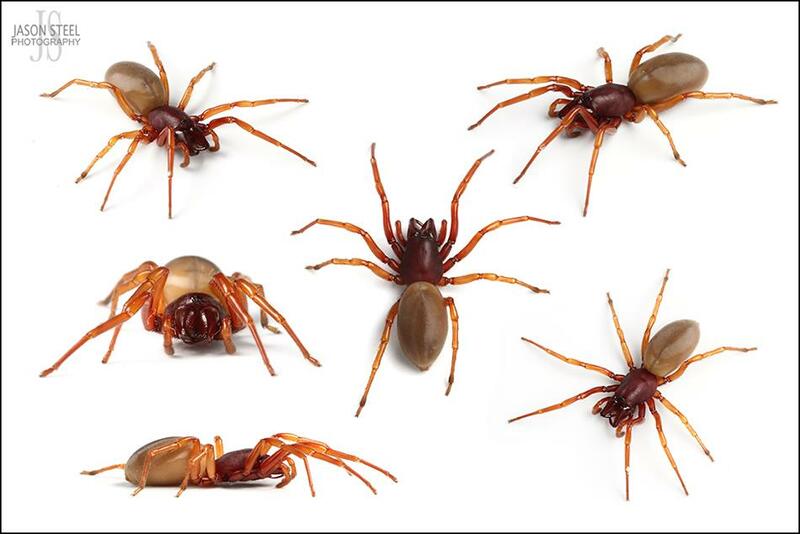 Woodlouse Spiders have six eyes with females having a body-length of up to 15mm and the males 10mm. 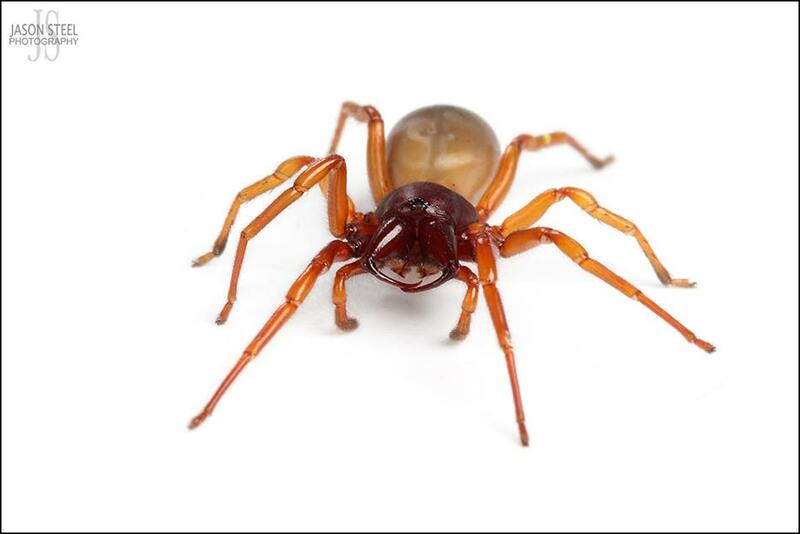 This species is sometimes referred to as the "Baked Bean Spider" because of the shape and colour of the abdomen. Other common names include Pillbug Hunter, Stiletto Spider and Slater Spider. This spider is often dominant in its habitat due to its strength and large, powerful jaws. Besides Woodlice it will also feed on other insects including millipedes, small beetles, earwigs, and even centipedes and other spiders. A very similar but far rarer species Dysdera erythrina looks almost identical but is found in more natural habitats away from human habitation. Woodlice Spiders have been known to bite humans on occasion. The bite is an initially painful sharp prick, due largely to the deep penetration of the skin caused by the size of the jaws, but the venom is ineffective against humans and results in mild itchiness usually lasting less than an hour if not scratched. This species is a nocturnal hunter and hides away in a silken retreat during the day. 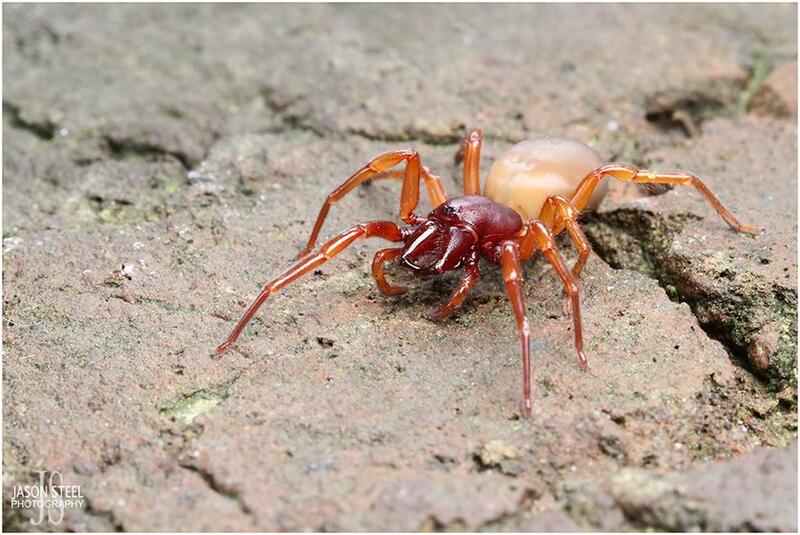 Large adult female Woodlouse Spider (Dysdera crocata), missing a leg. 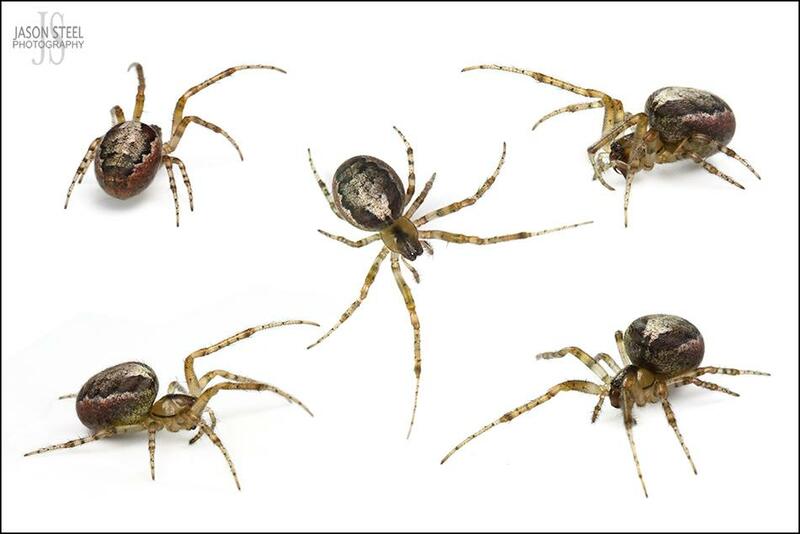 There are around eight species of Wide-Jawed Orb Weaver species in northern Europe. 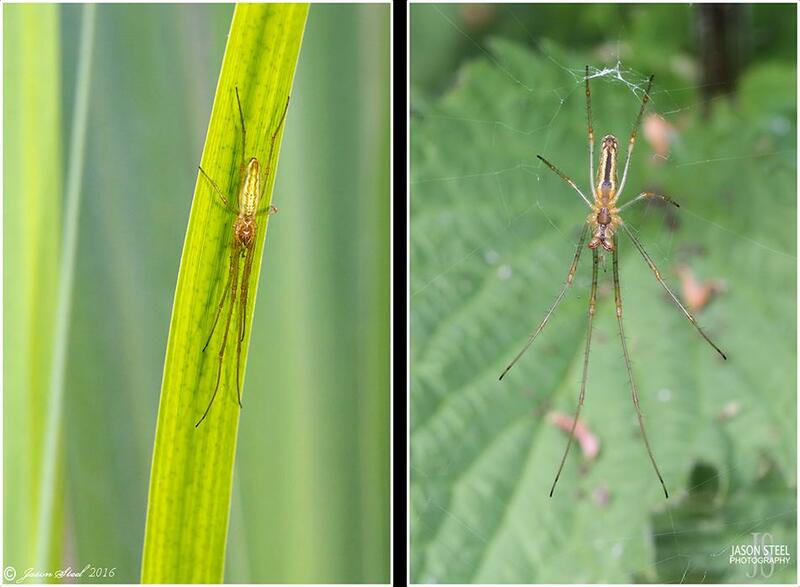 The two most commonly encountered in the UK are Tetragnatha extensa & Tetragnatha montana. Wide-Jawed Orb Weavers have a body-length of 5-15mm and are commonly found around or near to water in low vegetation, but can also be found on occasion on bushes or trees. Colour can vary from pale yellow - light green - light brown. They have extremely long jaws (chelicerae), especially the males, with the fangs at the tips. 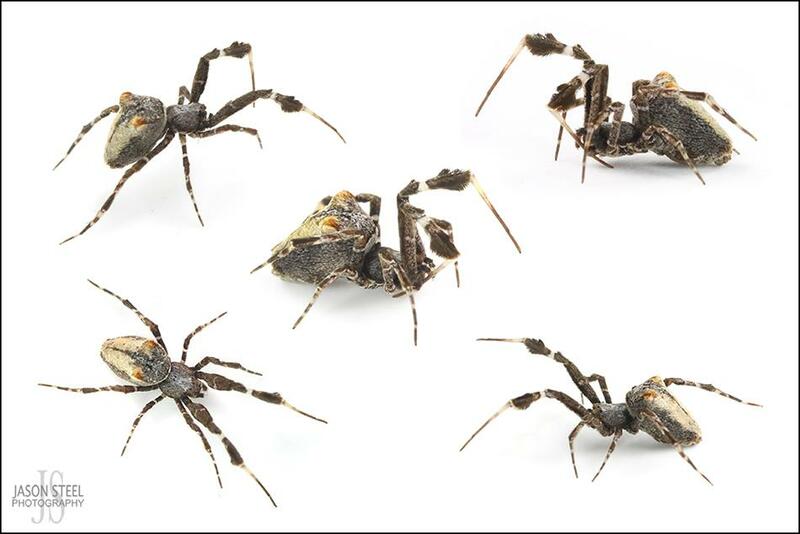 When disturbed these spiders can adopt a defensive posture with their legs fully stretched out in-font and behind them, giving rise to the name "Stretch Spider". This enables them to hide behind thin vegetation. The orb-webs are loosely formed with an open centre and few radii. Wide-Jawed Orb Weavers are usually found between May and August in the UK with some still around in September. Identifying specific species can be very difficult without close inspection. Female Wide-Jawed Orb Weaver Spider - Tetragnatha extensa. 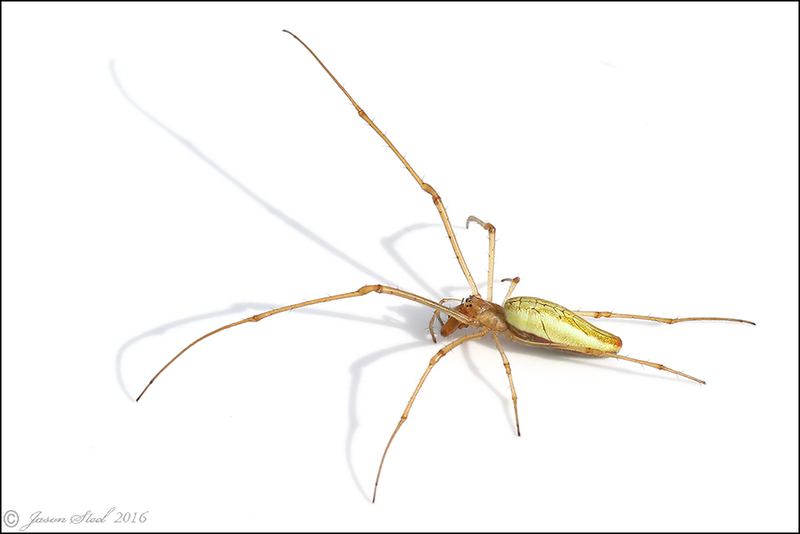 Female Long / Wide-Jawed Orb Weaver Spider - Tetragnatha extensa. Female - 5-11mm body-length. Male - 5-9mm. A common species found across Western Europe and the American continent. Female Long / Wide-Jawed Orb Weaver Spider - Tetragnatha montana. Female 7-13mm body-length. Male - 6-8mm. 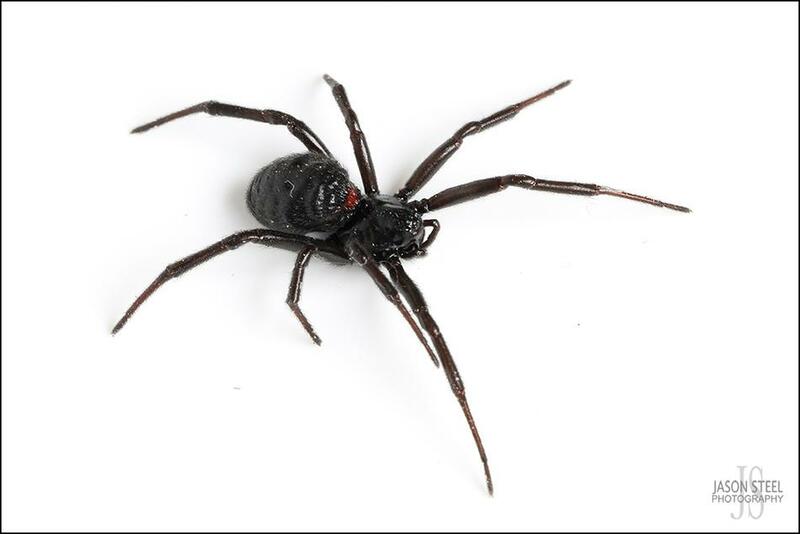 The female Black Lace Weaver Spider has a substantial body size of 16mm and a legspan of around 30mm. The males are slightly smaller with a maximum body size of 12.5mm. 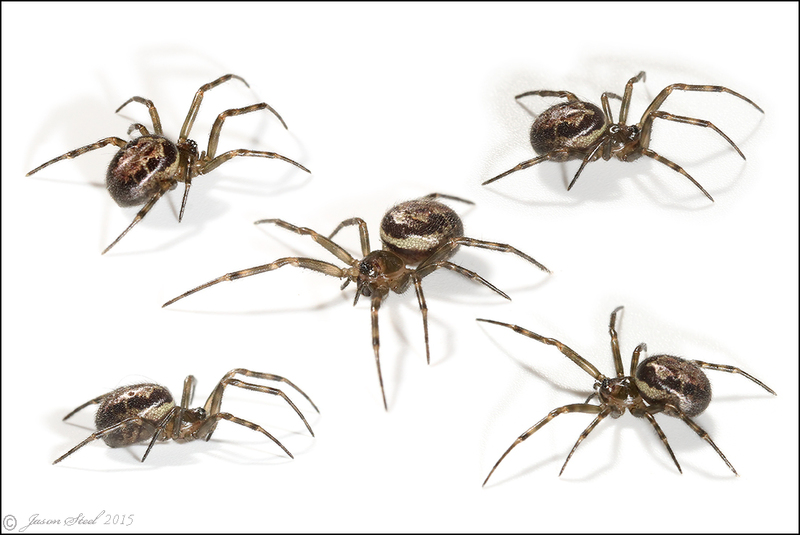 These spiders are often found under logs, rocks, tree bark and in cellars, garages, gardens and woodland across Europe and N. America. The Greek word "Amaurobius" means "living in the dark" and the Latin word "ferox" can mean "the fierce or ferocious one" - The ferocious one from the dark! 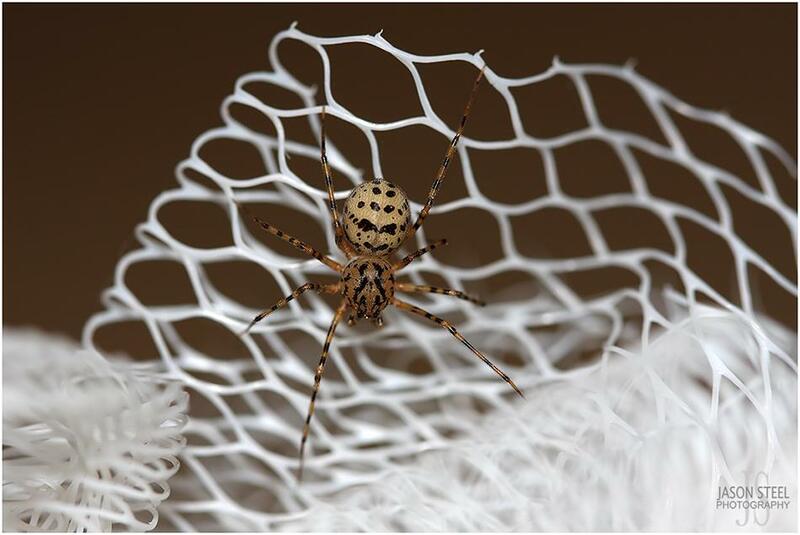 The females never leave their silken web which consists of a lace-like web around a funnel. Males can be found wandering around at night looking for females to mate with. Usually during their second year the female will give birth to 60-180 eggs in a silky woven sack. 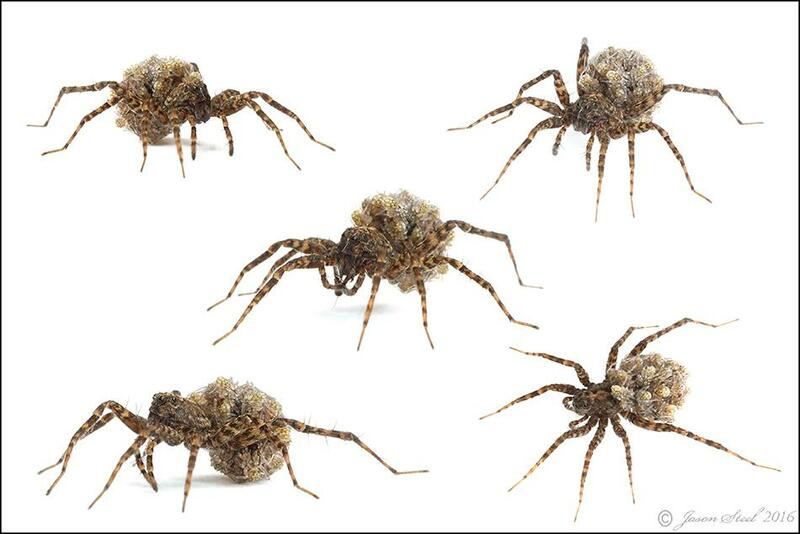 The spiderlings will eventually eat their mother before leaving the nest. This process is known as matriphagy. 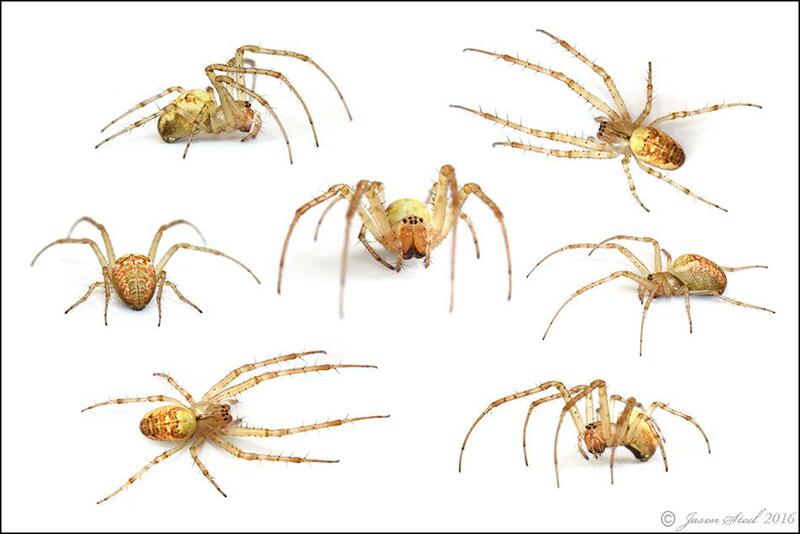 These spiders are not usually aggressive but females are known to bite if disturbed from their web. I have been bitten by these spiders twice myself on my hand when turning over logs and rocks. After an initial sharp pin-prick my hand felt slightly swollen with a strong sensation of heat and tingling and I felt slightly light-headed and nauseated. These symptoms were minor and passed within a couple of hours although others report symptoms of nausea, pain, reddening and swelling lasting for up to three days. 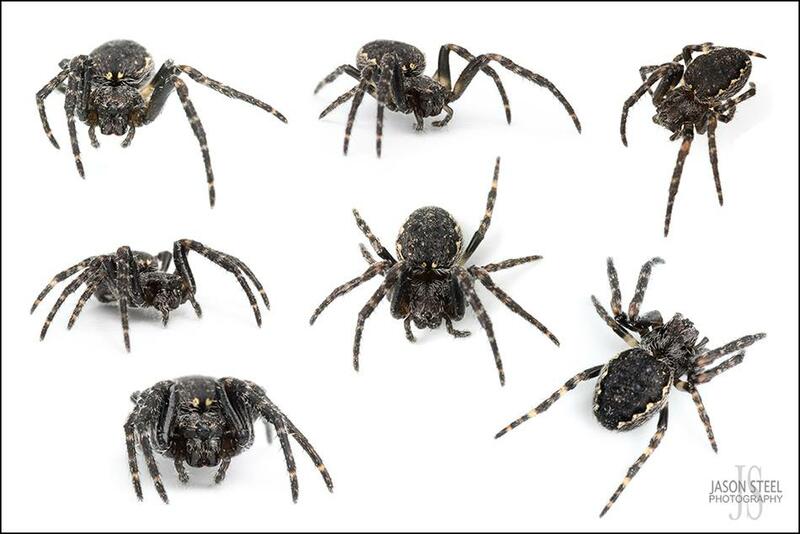 The female Black Lace Weaver Spiders practice a behaviour called matriphagy.The word matriphagy can be broken into two parts to understand its meaning. 'Matri', meaning mother, and the suffix 'phagy', meaning to feed on. 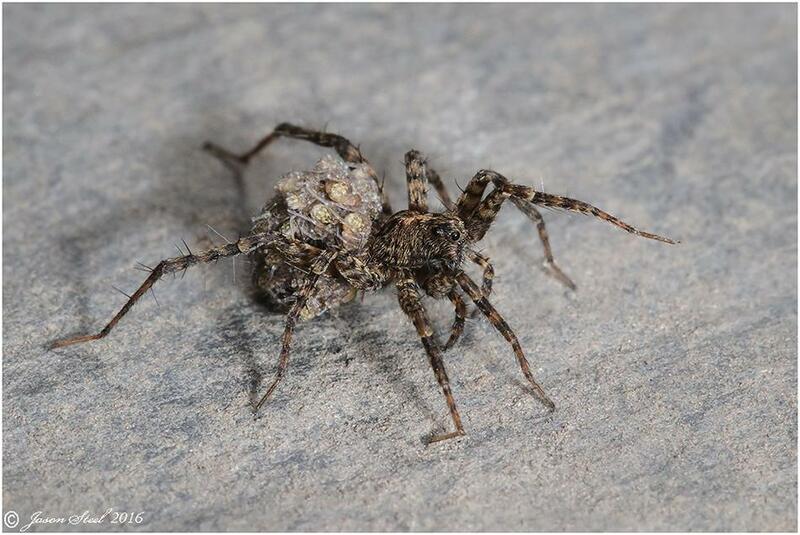 Once the tiny spiderlings emerge from the egg sac, the female often produces a second clutch of eggs for the young to feed on. When this food source runs out the adult female then begins to pluck at her web. The vibrations on the web stimulate the young and they start to swarm all over their mother. They begin to bite and inject venom for the first time, whilst the adult female makes no attempt to resist or escape. She sacrifices herself to prepare her young to hunt for themselves in the outside world. This has been photographed and documented brilliantly by Tone Killick. 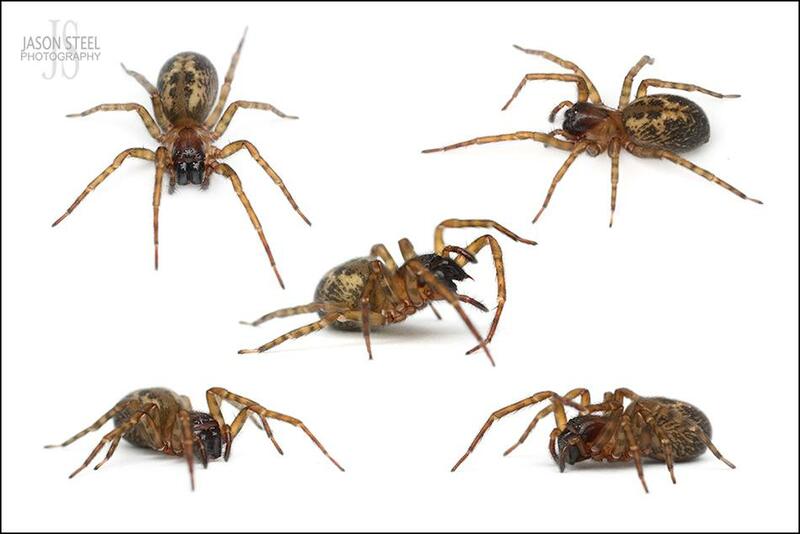 There are three lace weaver species in the UK, Amaurobius similis, Amaurobius fenestralis and the larger Amaurobius ferox pictured above. All three species are similar in appearance but Amaurobius ferox & Amaurobius similis tend to be darker and larger as adults. Similar in appearance to Amaurobius ferox, but not quite as large or as dark in colour. 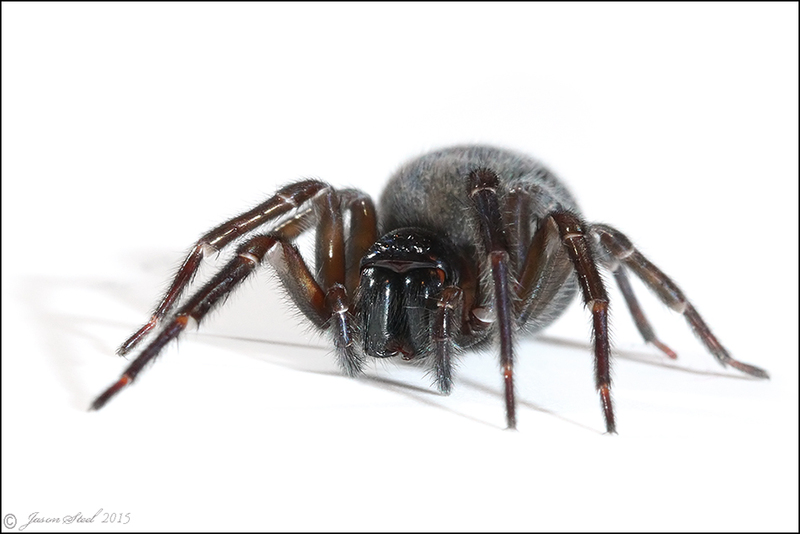 In urban gardens Amaurobius ferox are usually found under rocks, logs and stones., but Amaurobius similis are more often be found in holes in walls and fences, and around the window and door-frames of the house. Females can be found all year, but males are usually only seen from June - November. The Cellar Spider is very common and frequently found in homes across the country. 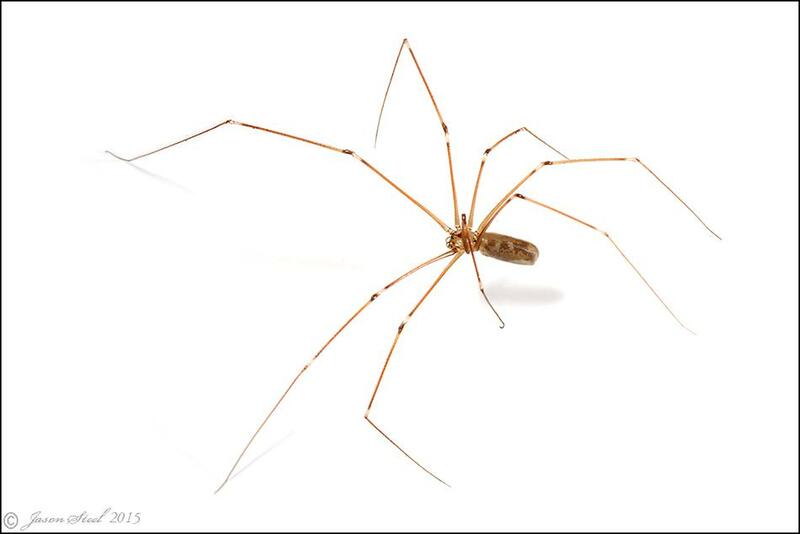 This spider has many names but they are most commonly referred to by the term 'Daddy-long-legs'. This term is unfortunately also used when referring to Crane Flies and Harvestmen, so adds to confusion when identifying a species and is best avoided. - Crane flies (Tipulidae) are large, slender flies known for their erratic flight. - Harvestmen (Opiliones) are arachnids but not spiders because they only have a single pair of eyes and a fused body shape. 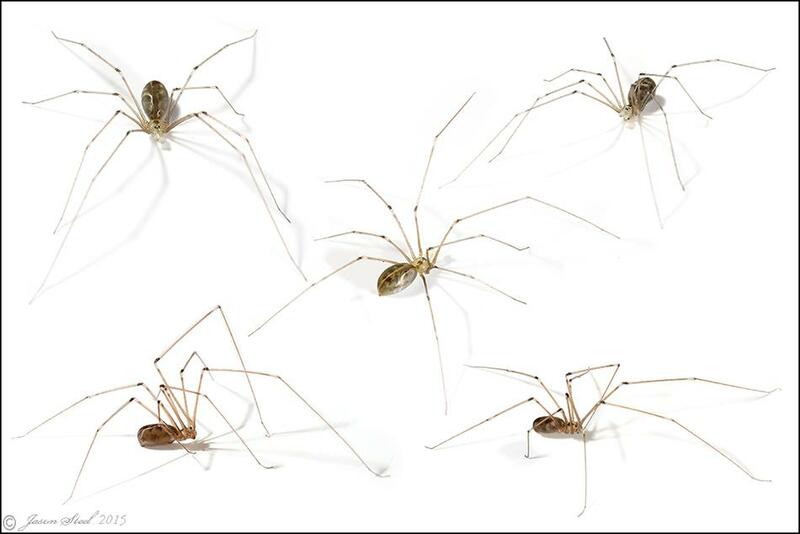 Cellar Spiders build messy dangling webs that hang from the ceiling in houses, garages and cellars. They have a small body 6-10mm and extremely long thin legs and can have a leg-span of up to 70mm or more. These legs are very delicate and it's not uncommon to find specimens with missing legs. They are also known as the Skull Spider due to their head often resembling that of a human skull. 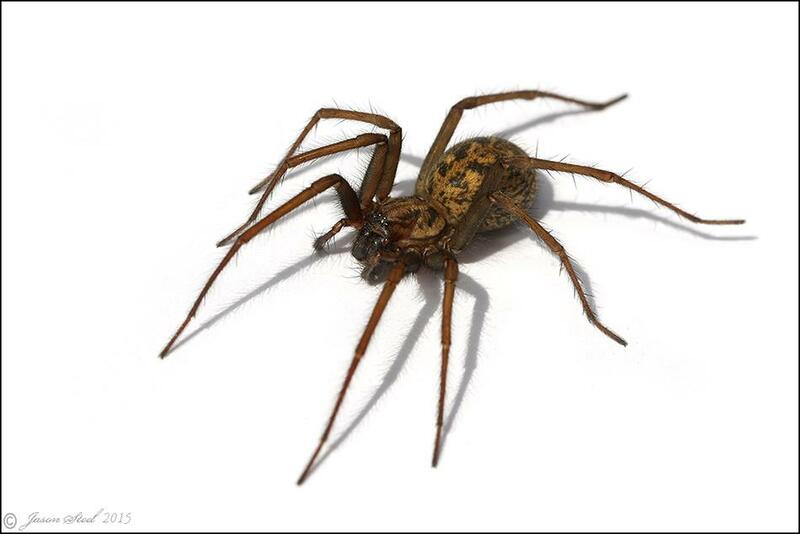 Another name sometimes used is the Architrave Spider which obviously comes from their webs usually being found in houses where ceilings and walls meet. When approached these spiders will vibrate their webs rapidly and has given rise to yet another name for the species, the Vibrating Spider. This is a practice adopted by many other spider species as well though. 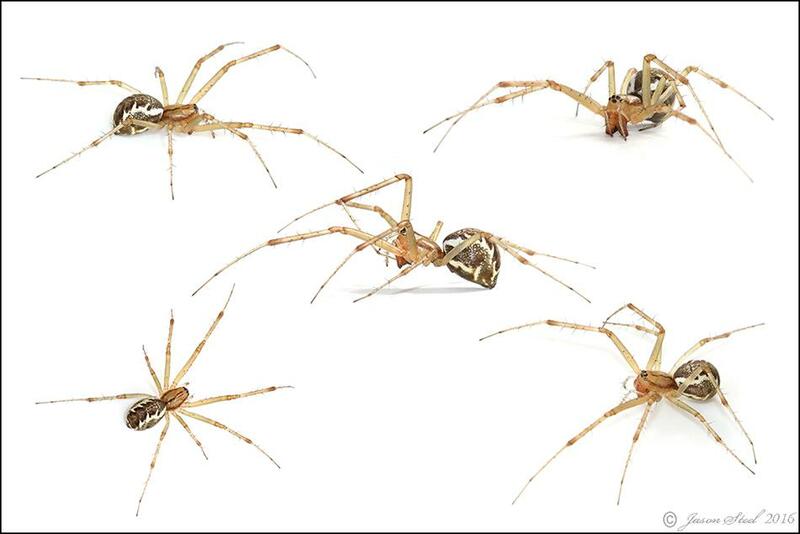 Despite their delicate appearance the Cellar Spider is a "spider hunter" and can prey on other far larger or more dangerous spiders such as Giant House Spiders or False Widow Spiders. They achieve this by throwing silky strands of web at their opponent to entangle them before moving in and biting. 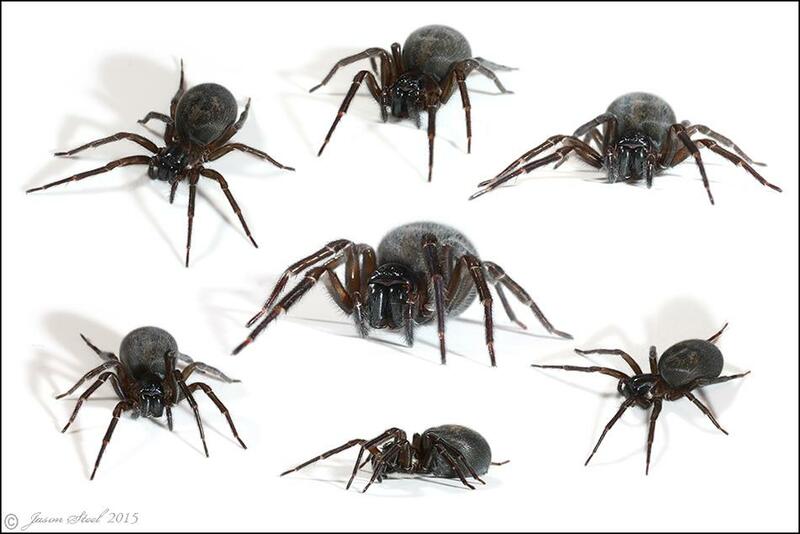 They are therefore considered a species that might be beneficial to have in your home if you don't like spiders! They are also cannibalistic and even the young spiderlings will prey on their siblings. These spiderlings are almost completely transparent and hang around the mother's web for some time after hatching. 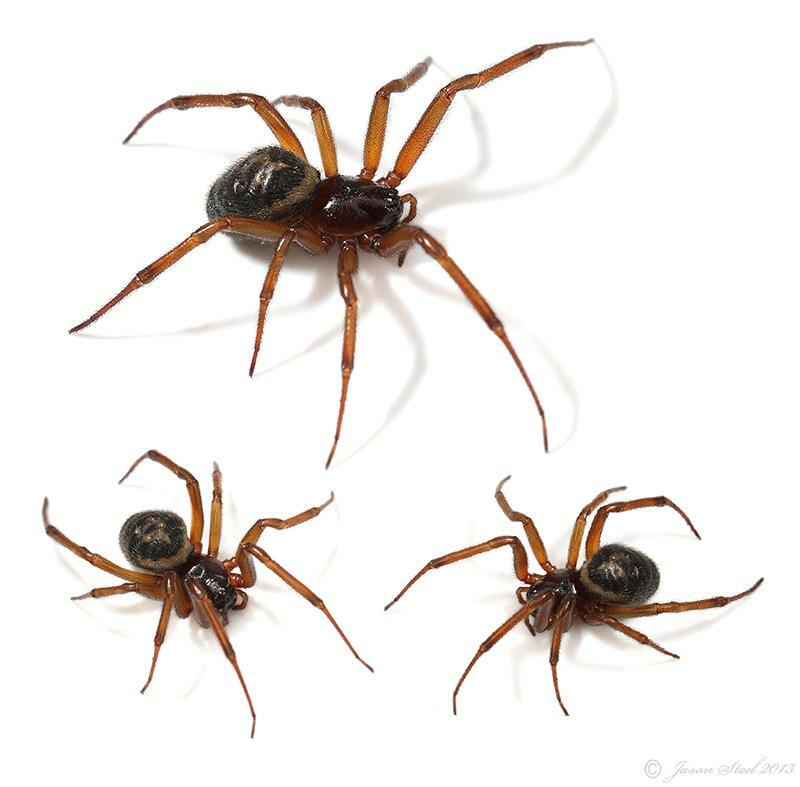 Common names came be confusing as the name “cellar spider” is sometimes also used for both the False Widow Spider (Steatoda grossa) and the Tube Web Spider (Segestria florentina). 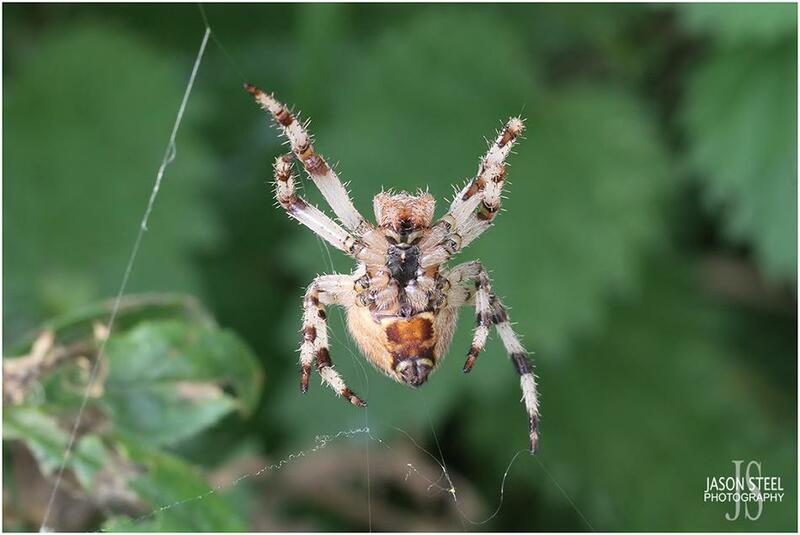 The Labyrinth Spider is usually found in long grass, on hedgerows and low down on trees across England and Wales especially in July and August. 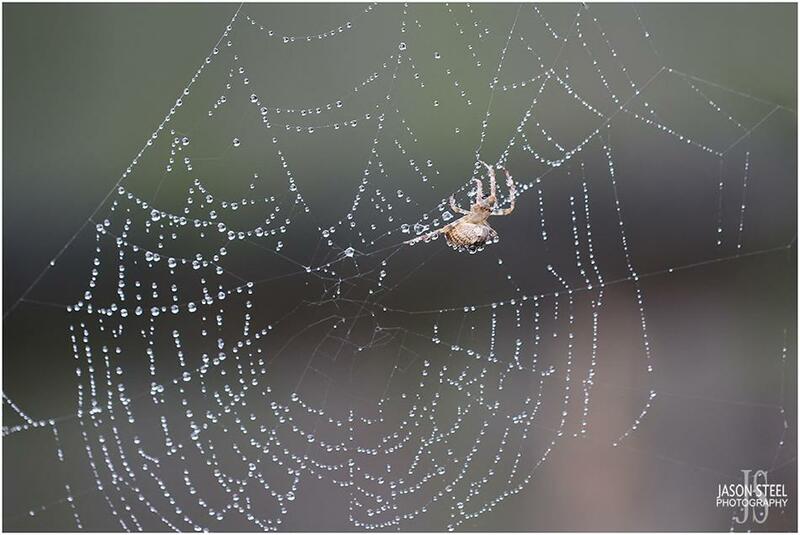 Their webs are large horizontal dense sheets of white silky threads with a funnel retreat in the centre. This deep funnel usually leads to a series of chambers where the female keeps her egg-sac. These webs are often found in abundance on a hedgerow where this species is present and they range from being located on the ground to being 1.5 metres above ground level. 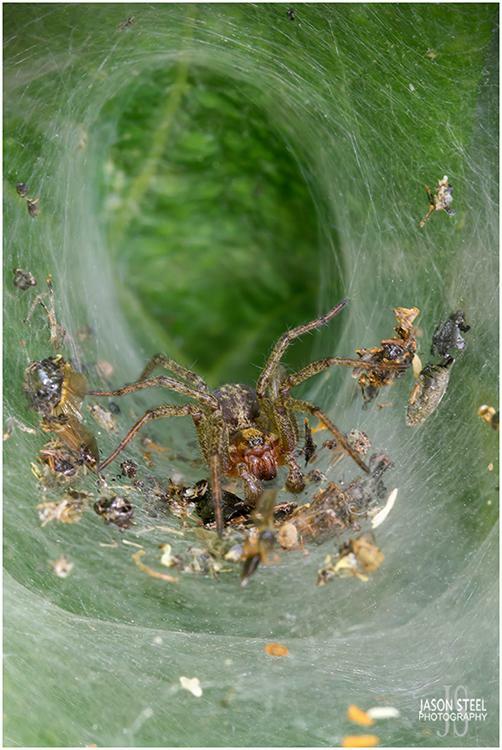 The Labyrinth Spider is the largest of 180 species of funnel spider found in Europe and Agelena labyrinthica can grow to a maximum body length of 18mm. These spiders are fast and agile. They have good spatial awareness and will often quickly retreat into their labyrinth of tunnels if approached. They are also cannibalistic and this male specimen photographed above was found eating an identical spider of the same size and species. This is not a species usually found in houses and its bite is not considered to be painful or of any concern. This Labyrinth Spider was ready to defend itself after being captured and photographed, as you can see by the venom dripping from its fangs! 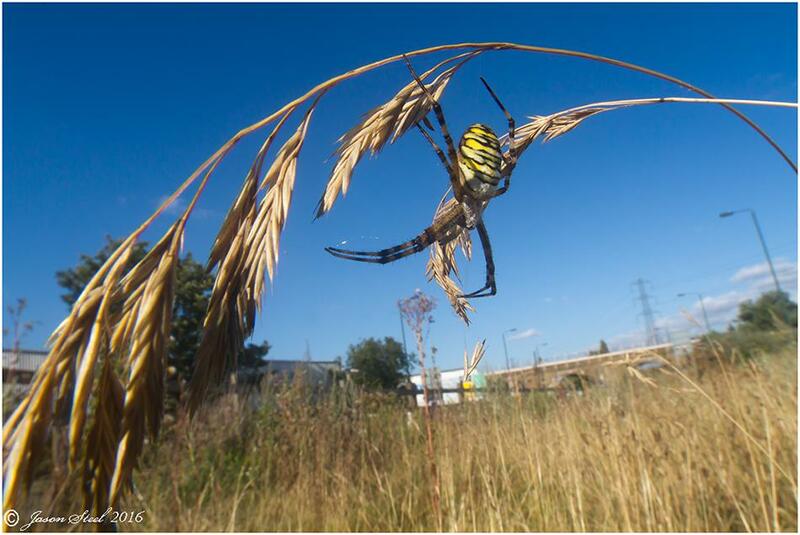 The Garden Spider is one of the largest bodied spiders in the UK, especially in Autumn when the females are gravid. 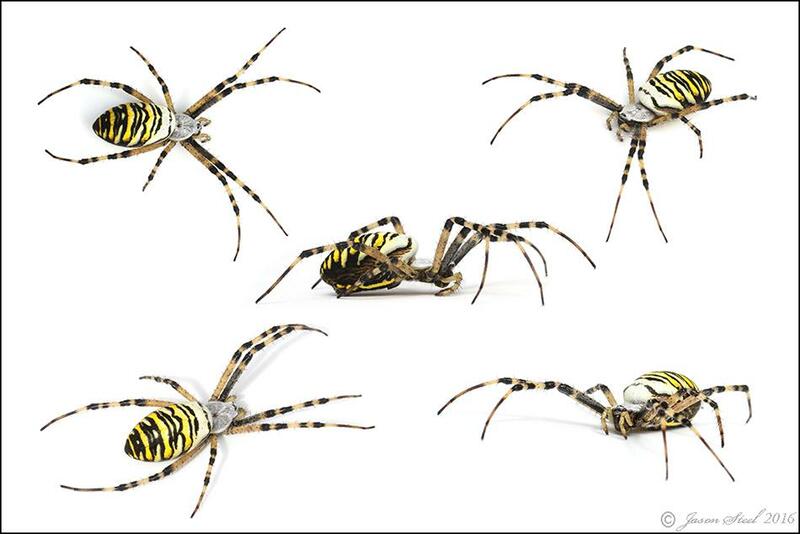 Garden Spiders are common across Europe as well as in parts of North America. Most specimens have a white cross on their abdomen. The adults can come in a huge range of colours from yellow - brown - red - dark grey but the spiderlings are always bright yellow with a black triangle on the abdomen. Adult females can grow to a large body length of 20mm whilst males are slimmer and only reach 13mm. Their highly geometrical orb-webs are often around 200 - 400mm in diameter and the adult spider can be found either in the centre of the web or hidden close by on the other end of a trigger line from the web. Webs are built and repaired after dusk. 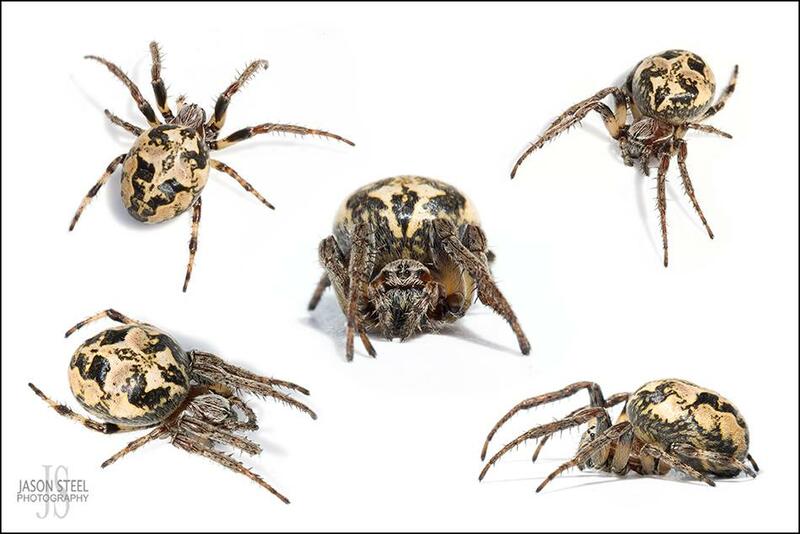 In some specimens of Garden Spider the identifiable cross markings are almost absent as in the photo above. With a body length of 20mm this example is one of the largest I have seen and looked ready to burst it was so heavily gravid with eggs. 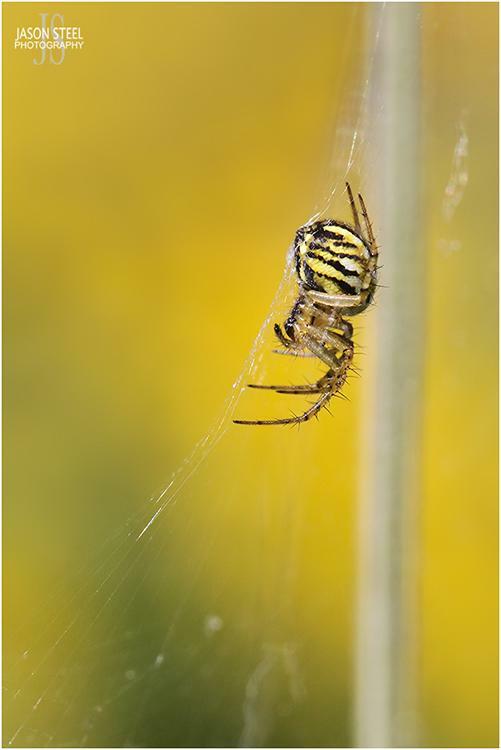 Garden Spiders are highly variable in both colour and shade and can be found in most habitats. Sightings are most common in late summer / autumn when the females are gravid and large in size. 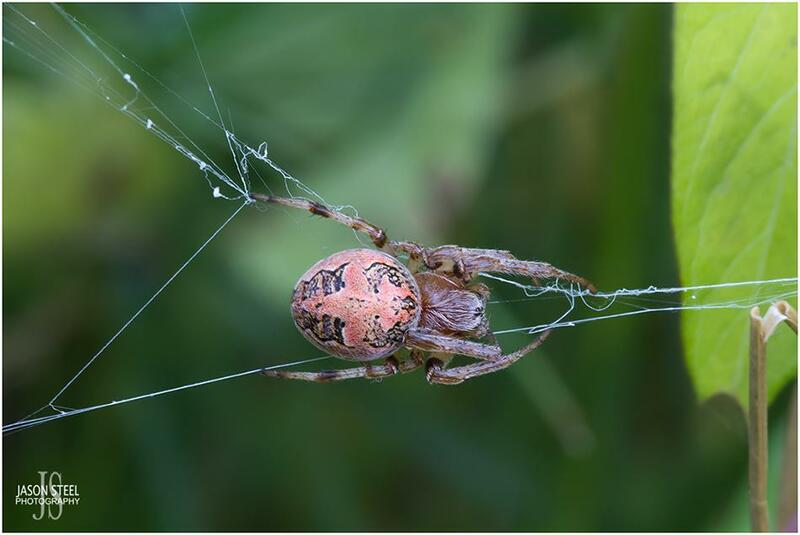 Adult female Garden Spiders weave a silky web-sac some distance from their web. Here they will deposit anywhere between 100 - 800 tiny yellow eggs, and shortly after this the females will die. When the tiny spiderlings hatch they will remain huddled together as a cluster ball for a day or two, after which they will disperse. As soon as they disperse the spiderlings will quickly begin building tiny orb-shaped webs. 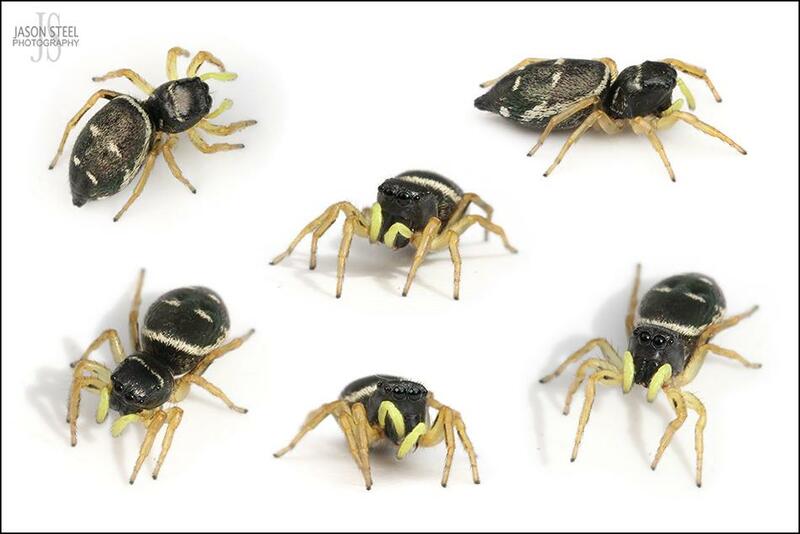 The spiderlings are bright yellow with pyramid markings on the rear of their abdomens. These markings are common amongst many different Orb-Weaver Spiders though so positive identification may not be possible at this stage. Adult female Garden Spider. This species is known to bite humans on occasion if handled roughly. Adult female Garden Spider in orb web. 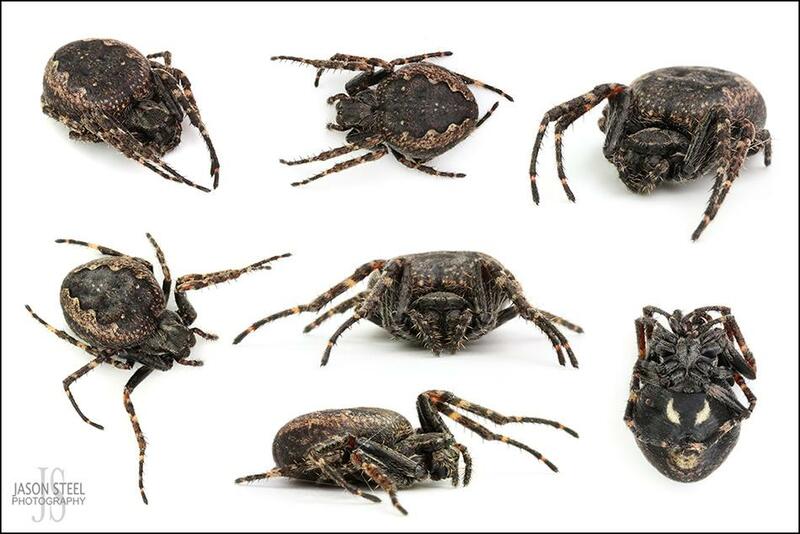 Also known as Toad Spider or Evening Spider, they are found across England, becoming more scarce further north. Females have a body length growing to 15mm and males just 11mm. The flat dark brown abdomen and zig-zag edges are identifying features of this nocturnal spider. Females are common from the spring onwards but they can be seen all year round and even endure temperatures as low as -19 degrees Celcius! Males are usually only found in the summer. During the day these spiders hide in out-buildings, fences, rock crevices or loose tree bark, only coming out in the day to secure prey caught in their web. During the evening they often sit in the middle of their web. 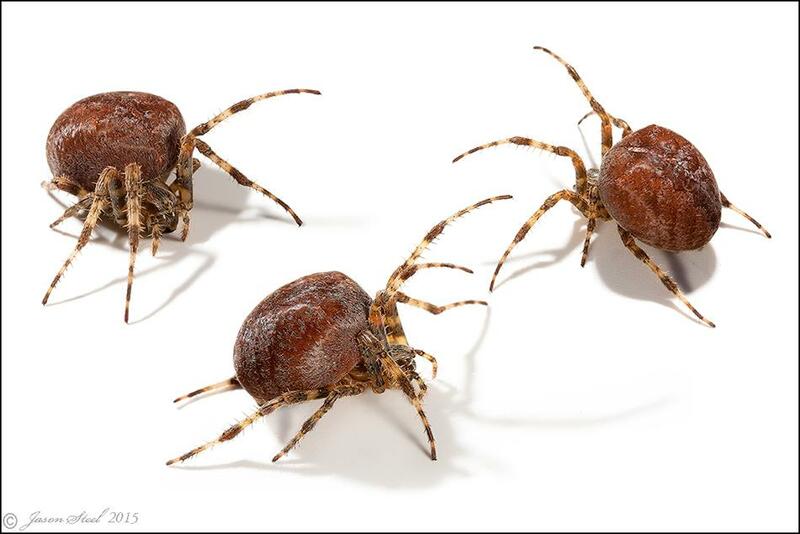 Walnut Orb-Weavers have been known to bite humans when disturbed, resulting in itchiness and a burning sensation on the skin, followed by a red patch with white lumps. Both male and female Walnut Orb-Weavers have a dark brown leaf-shaped mark on the upperside of their abdomen. On the underside they both have two cream coloured teardrop shaped markings. 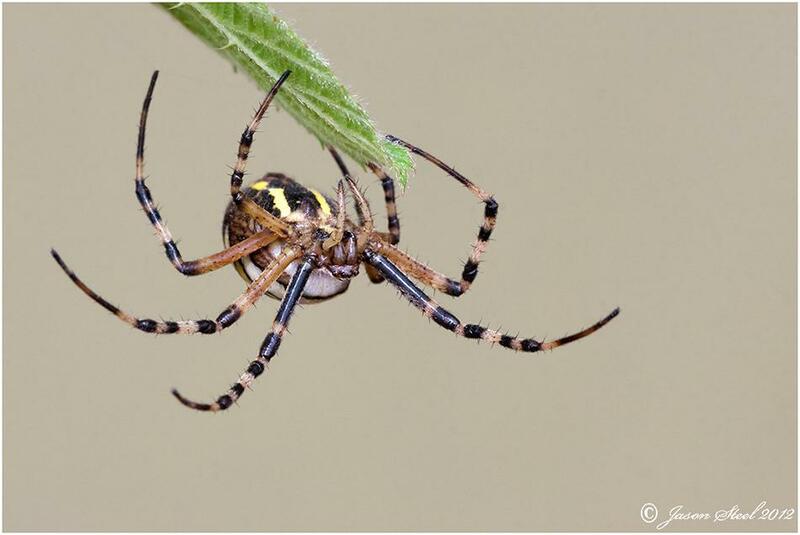 The Four Spotted Orb-Weaver is recorded as being Britain's heaviest spider. Females have a body length of around 17mm and a legspan in excess of 35mm. Males are around half that size. Adults can be found during late summer and autumn. These spiders build large orb webs between substantial vegetation and are usually found in undisturbed grassland, not gardens. The distingiushing four spots on the abdomen can be feint in males and difficult to see in heavily gravid females with stretched bodies. The colour of this species can vary enormously from red, brown, cream or green. The Bridge Orb Weaver gets its name from its tendency to dwell in / on man made structures near water, such as bridges, fences and bird hides. This species is also seen on tree trunks but is seldom found on vegetation. 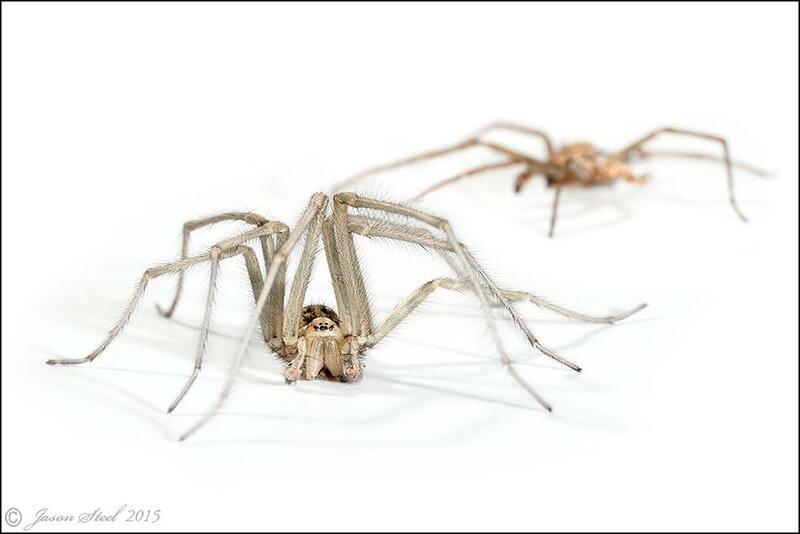 They are on occasion also referred to as the Gray Cross Spider. 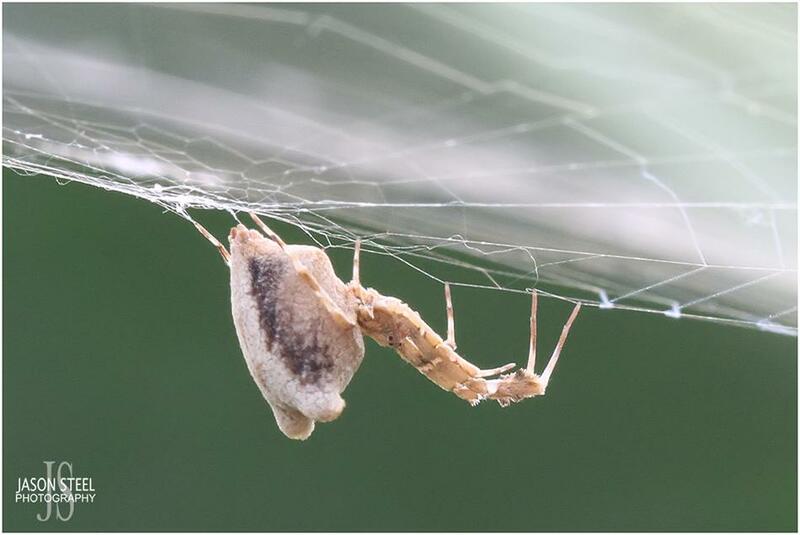 The Bridge Orb Weaver is the largest of the Larinioides with the females having a body length of up to 15mm, as with the specimen pictured above. Adults are usually seen between May - October and females are known to overwinter. Usually found in damp places such as reeds and other waterside vegetation., as well as on bridges and posts. Females have a maximum body-length of 14mm with a 35mm leg-span. Males have a maximum body-length of 9mm with a 18mm leg-span. During mating peiods in Autumn and Spring, the males and females can be found living together. The large orb webs are usually empty during the daytime whilst the spider hides in a silken retreat nearby. Damaged webs are repaired at night. 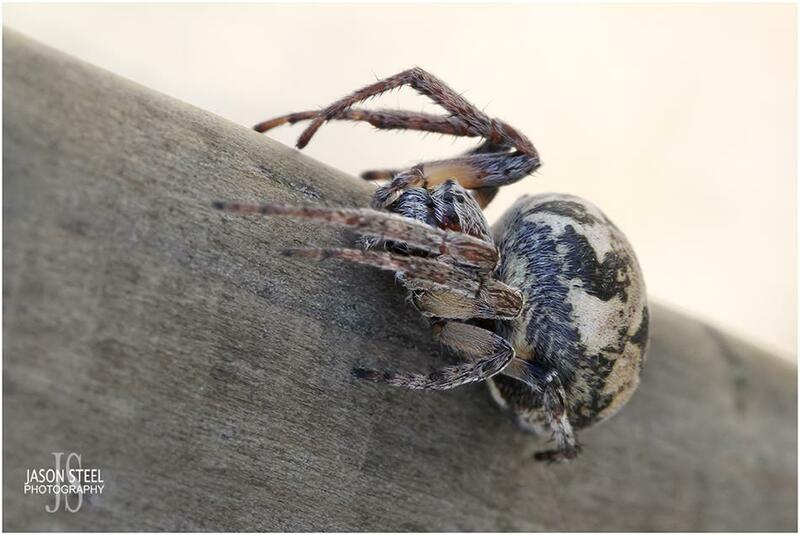 This adult female Furrow Orb-Weaver Spider was found climbing on a wooden bridge over marshland in Essex. This adult female Furrow Orb-Weaver Spider was repairing its web in reeds next to a river, and feeding on prey caught in its web as the sun was setting. The Lined Orb-Weaver Spider, from the family Araneidae (orb-weavers), produces small tightly woven orb-webs in low vegetation growing in dry sunny locations. This species is common throughout Europe but in the UK it is found mainly in the SE of England. They have a small body-length of 5-6mm for the female and 3-3.5mm for the male. 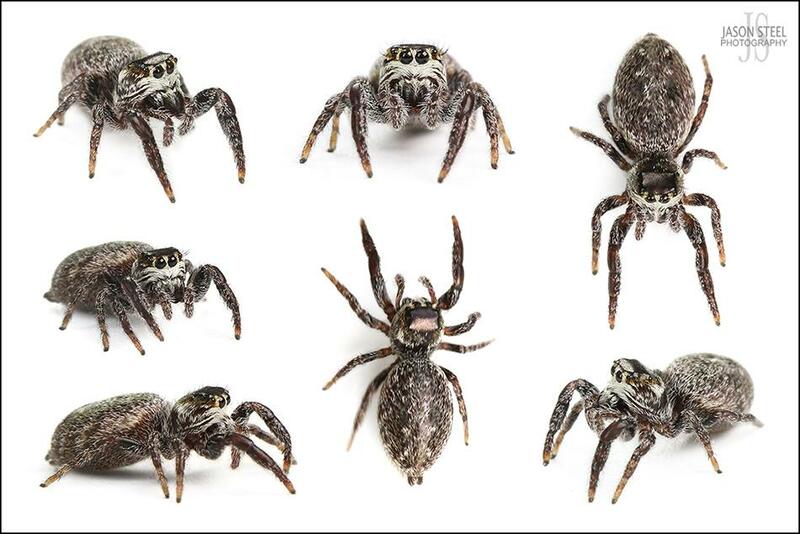 Adults are highly variable in colour but they have black stripes along the sides of the abdomen and a distinctive black rectangle marking with light spots on the top of the abdomen. 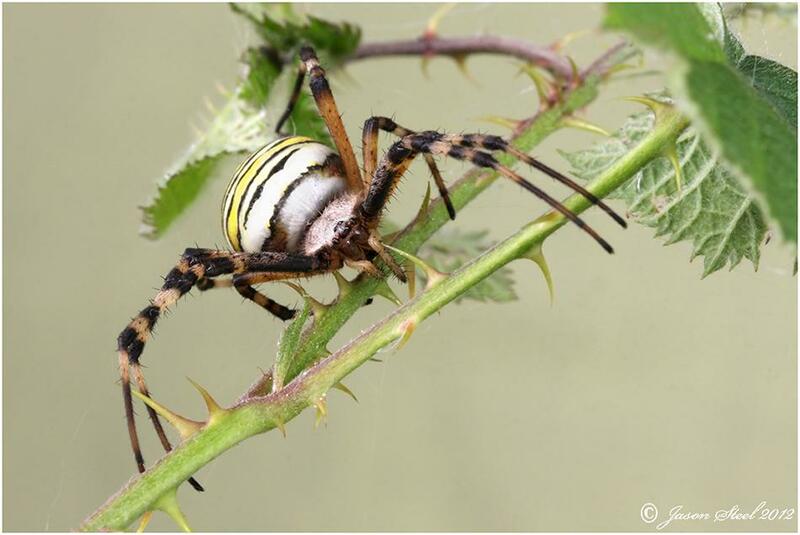 The female wasp spider has these striking yellow and black markings and is capable of delivering a painful bite. 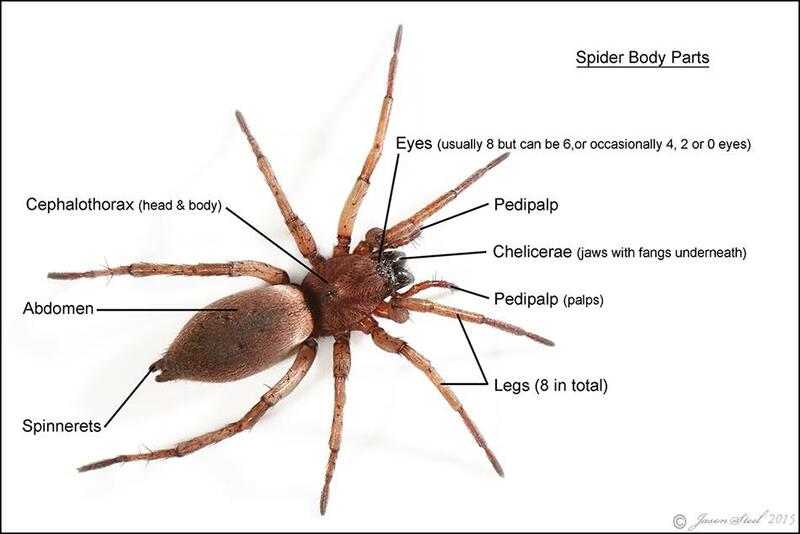 The females can have a body size of up to 17mm (30 - 40mm leg-span) making it an impressive looking spider for the UK. These were first recorded in 1922 in Rye and other parts of the south coast and are thought to have come form Continental Europe but are now seen across the UK with new sightings being reported further north every year. 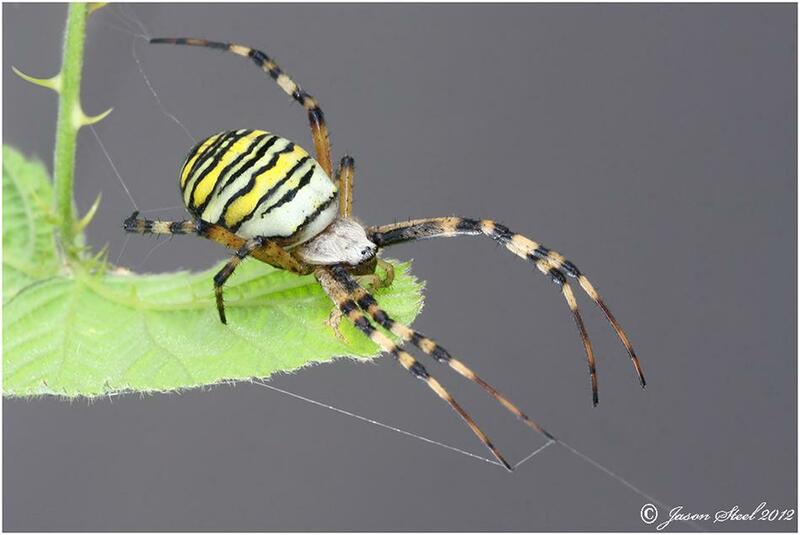 This photo shows the underside of the Wasp Spider as she hangs from a leaf. Her powerful fangs are clearly visible. 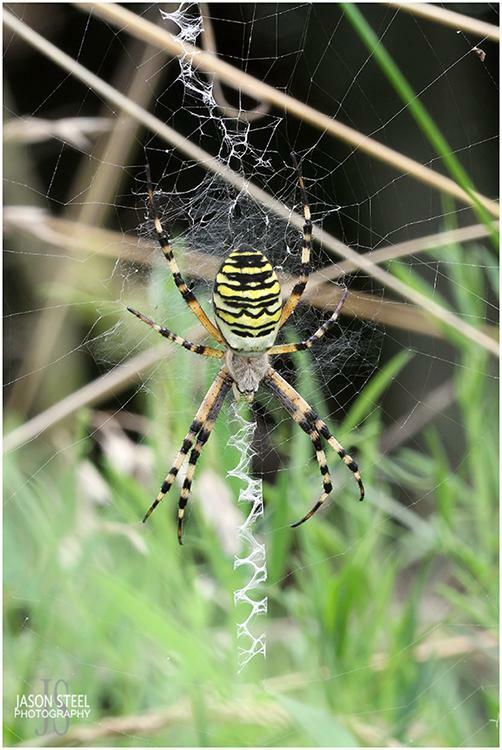 The male Wasp Spider is much smaller than the female as is often the case with spiders. Mating with the female can be a risky business for the male so it often hides by a female's web and waits until she periodically sheds her skin. The new skin underneath is very soft when first exposed and the female is vulnerable as her fangs are not as strong as usual until the skin hardens up. The male quickly seizes this opportunity to make his move and mate with the female while she is in this vulnerable state. Many males still suffer injury or death during the process though and the female will often eat the male given the chance. 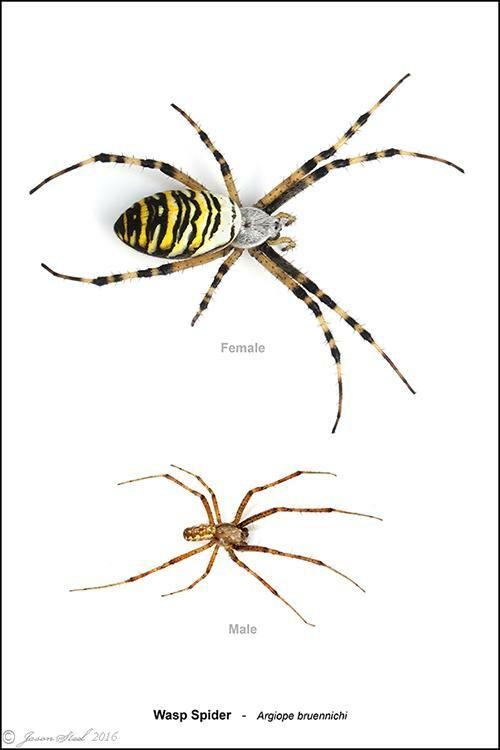 As demonstrated by this image, the male Wasp Spider is far small than the female. Female Wasp Spider with Leap Hopper prey. 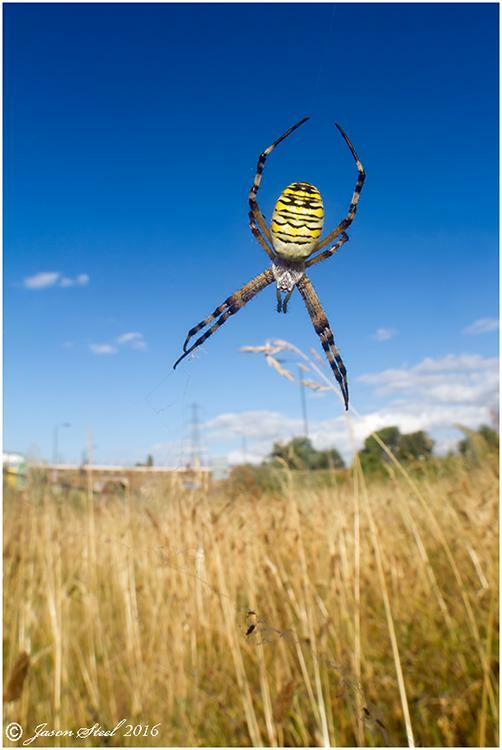 Wasp Spiders often display the same defensive strategy when approached. They are often witnessed dropping from their web completely and remaining completely motionless on the ground beneath the web in the hope that any would-be predator will not be able to find them. 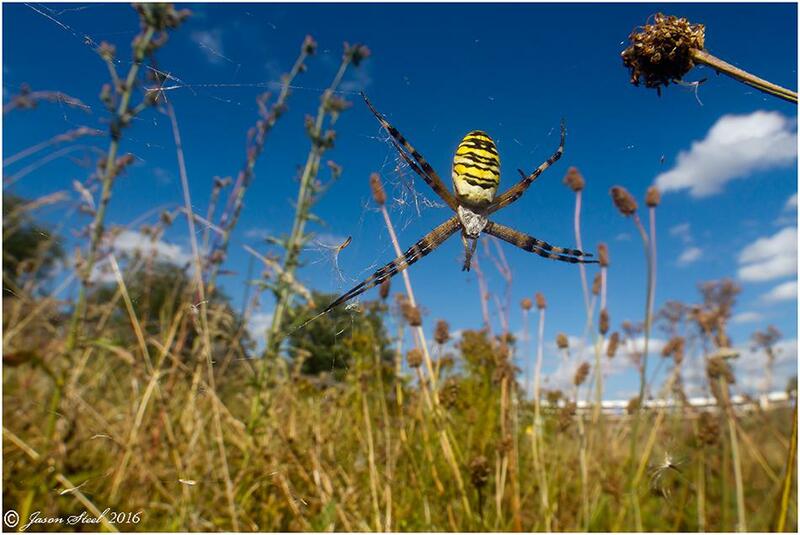 Argiope species of spider including the Wasp Spider display zig-zag patterns in the middle of their webs. These markings are known as stabilimente and may help to attract some insect prey to the web. 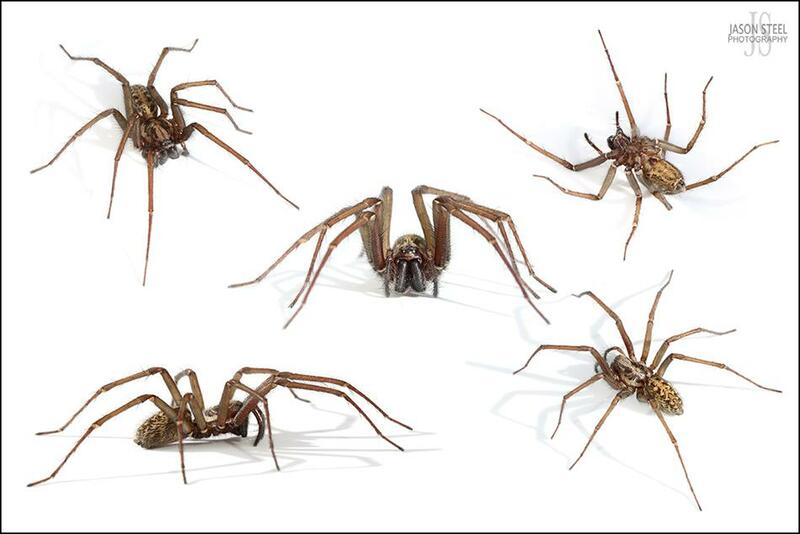 The Giant House Spider is one of the UK's largest spiders and they have also been recorded as the fastest running spider in the world. Females have a body-length of 11-16mm, males 10-14mm. They are common visitors to UK garden sheds and garages and also often make their way into houses in the autumn months. The female pictured above has a larger and stockier body when compared to the male. The male does have longer legs though and usually grow up to an impressive maximum leg-span of about 7.5cm with some reaching close to 10cm. 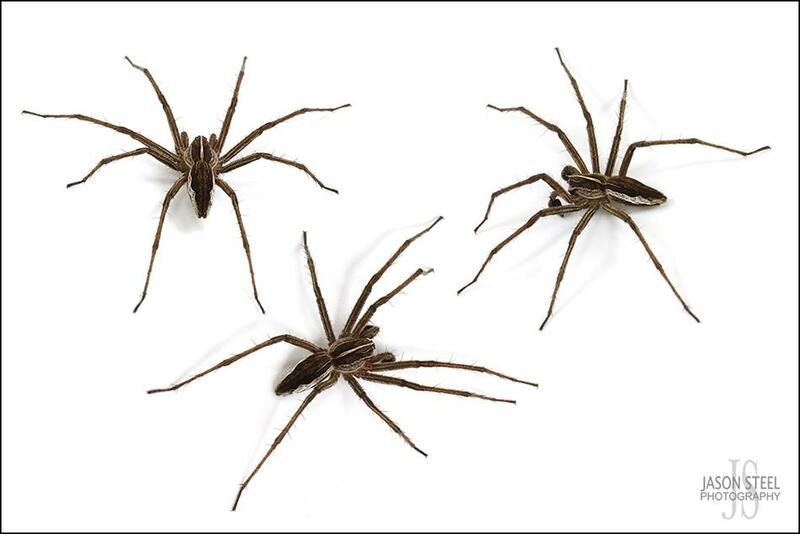 The Giant House Spider has been reclassified recently and is no longer in the House Spider genus. Once thought to be several different species including Tegenaria duellica, Tegenaria atrica, Tegenaria gigantea and Tegenaria saeva, but have now all been combined as one species - Eratigena atrica. Webs can be found both indoors and outdoors. They are messy and made with multiple layers of silken thread, with a funnel retreat in one of the corners. The threads are not sticky and prey wandering into the web simply gets tangled rather than stuck to the web. 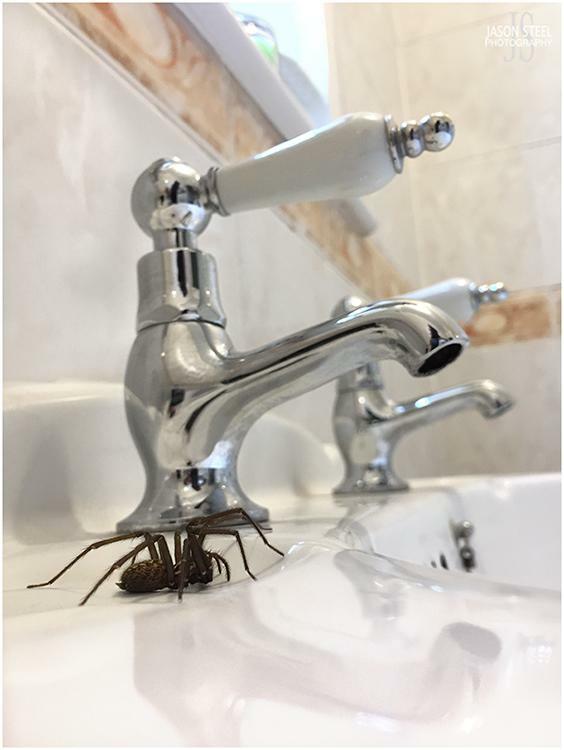 The Giant House Spider is quick to take advantage of the tangled prey and rushes out to inflict a subduing bite whilst dragging the prey back to its retreat. Webs are very durable and can last for many years.They are often reused by the next generation after the original web builder dies. This adult male Eratigena atrica had a measured leg-span of around 70mm. 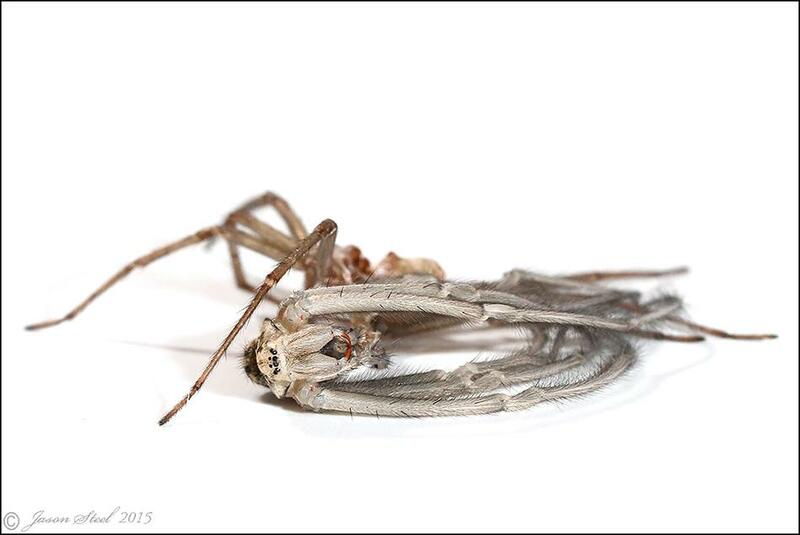 Shortly after these photos were taken the spider began the process of sloughing (shedding its old skin). The entire process took two hours to complete and when the spider was able to stand and stretch its new legs it now had a leg-span of 85mm! The cephalothorax splits across the back and the spider begins the arduous task of forcing itself out of the old skin. This is done in several stages with the spider taking time to rest regularly while it regains its strength before continuing. The only part of the spider that is attached to the old skin is at the base of the abdomen. Eventually the spider breaks free and lays motionless for several minutes, completely exhausted. In this exhausted state the spider is highly vulnerable. When the spider has regained enough energy it prepares itself to stand on its new legs. Spiders are exo-skeletal so at this stage the limbs are still very soft and flexible and are unable to support the weight of the spider. The spider finally manages to get itself upright. It quickly stretches out its new legs. Here it must remain and wait patiently while the new skin hardens sufficiently to fully support the spider. The soft new skin is quite translucent and the spider looks very different than before. After waiting for over an hour the spider's skin is now able to provide the skeletal support enabling the spider to walk once again. The spider is still exhausted and the new skin has still not fully hardened so once able to walk the spider abandons the old slough and heads off seeking cover where it can hide until fully recovered. The old abandoned slough is 20% smaller than the newly emerged spider. 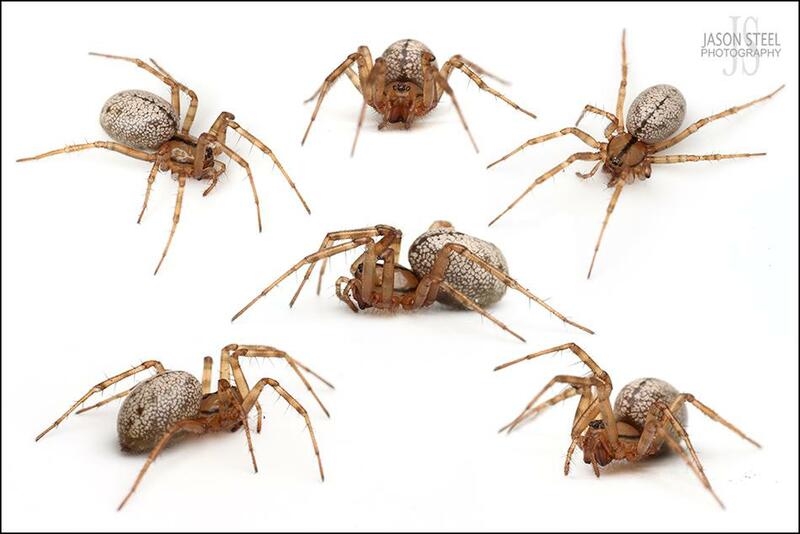 Male spiders often go in search of females to mate with during the Autumn months. This search often takes them into people's houses. 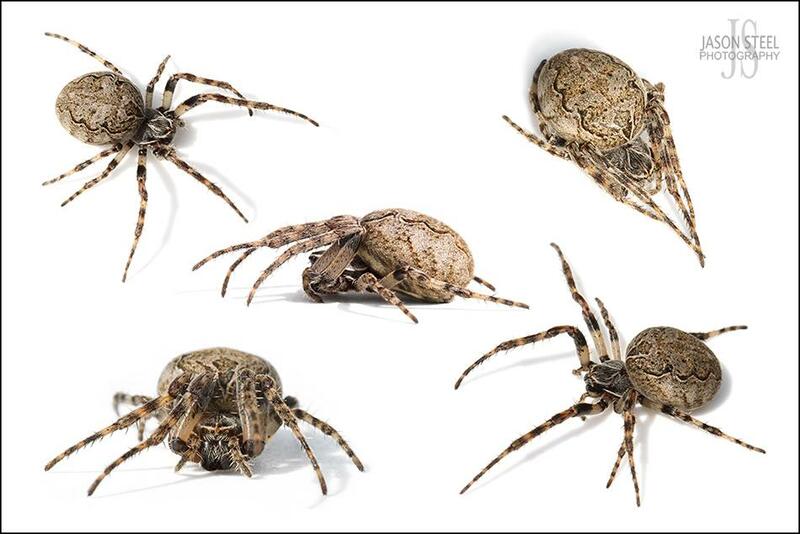 The sheer size of species such as Eratigena atrica can be quite alarming to anyone who suffers with a fear of spiders, but these are not an aggressive species at all and they very rarely bite humans. If found in the home just capture them in a glass and pop them back outside where they belong. 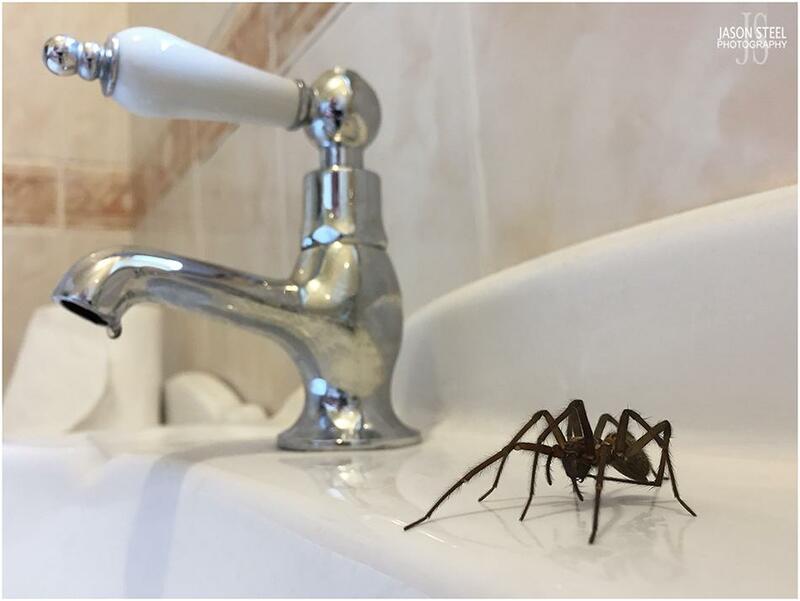 Spiders are often found in bath tubs and sinks. Despite common believes, spiders do not climb up through plugholes. They enter your home through open doors, windows, gaps in flooring and air-vents. Once on the slippery edge of a clean bath or sink they can easily slip and fall into the basin and are unable to climb out again without assistance. The Common House Spider has a body length of up to 10mm. The webs are sheet-like and often have a tubular retreat at one point. 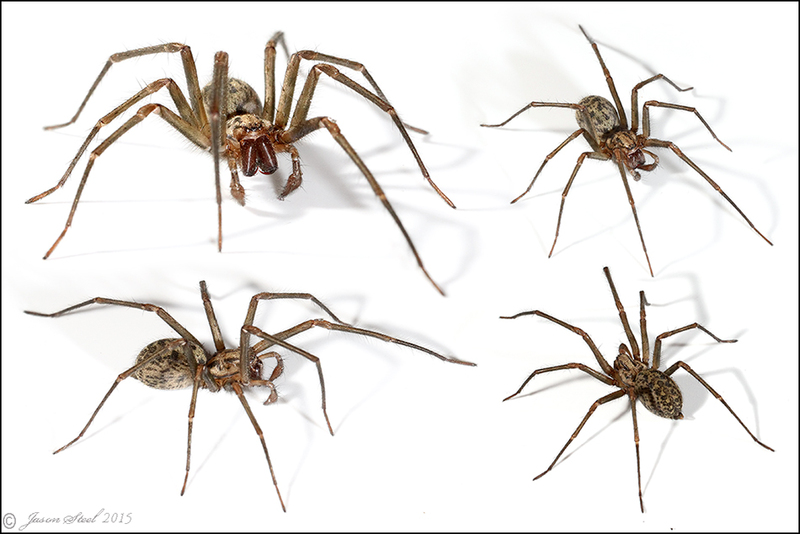 There are several species of House Spider in the UK belonging to the Tegenaria family. 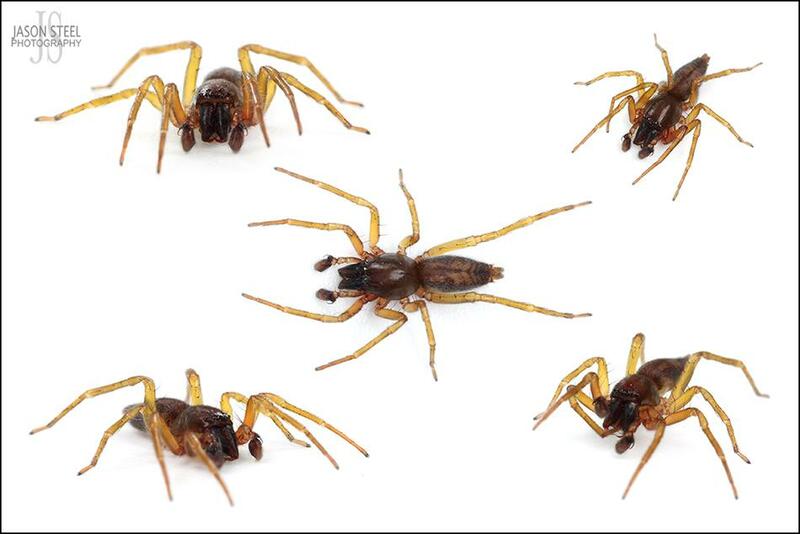 These spiders are often referred to as "Tegs". The Tube Web Spider is a large heavily built spider (by UK standards) that originated from the Mediterranean and first recorded in the UK around 1900. 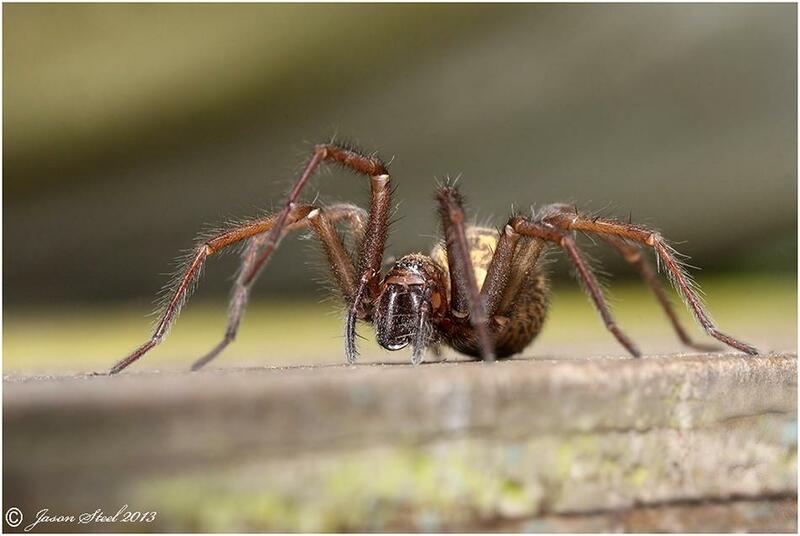 This spider is only found in the south of Britain but its range is increasing. They are more abundant around ports. It usually has a body-size of around 22mm but they can grow to around 30mm with a leg-span of over 45mm. The Tube Web Spider is generally nocturnal. They are often found in holes and cracks in walls where they retreat into a tube shaped web with trip-lines extending outside of the crevice where they are hiding. If the trip lines are triggered then the spider springs out of the hole biting the prey, usually by the head, and quickly dragging it back into its lair. 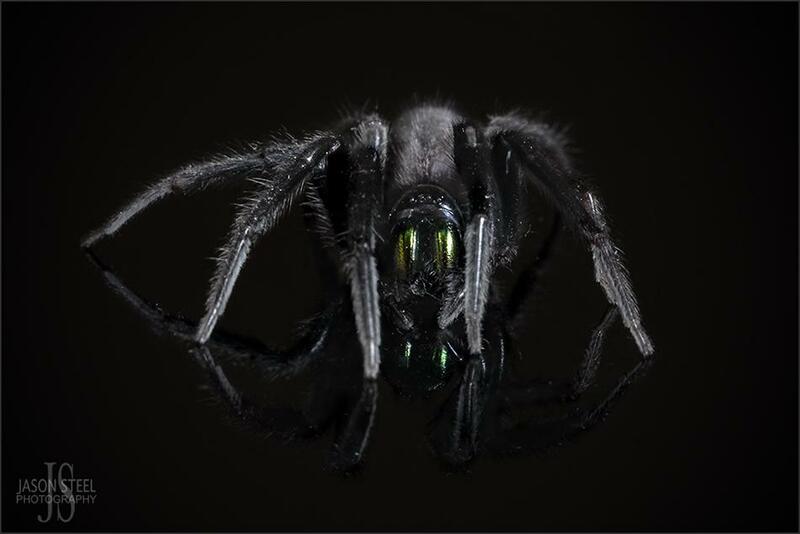 When hungry enough these spiders will also leave their lair and actively hunt their pry at night.The adults are dark black often with a distinctive green iridescent metallic shine to their fangs. Immature specimens are brown. One key identifying feature of the Tube Web Spider is its legs. 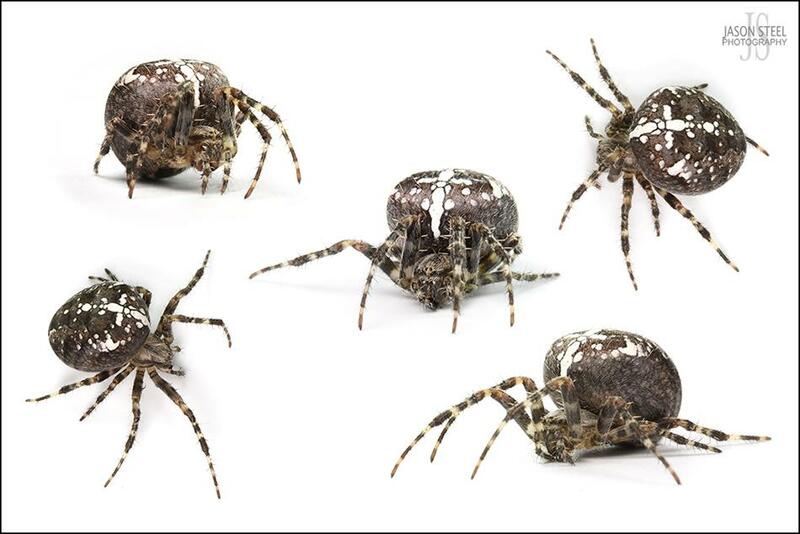 At rest the Tube Web Spider has three pairs of legs that face forward and one pair facing backwards, whereas most spiders will have two pairs facing forward and two facing backwards. 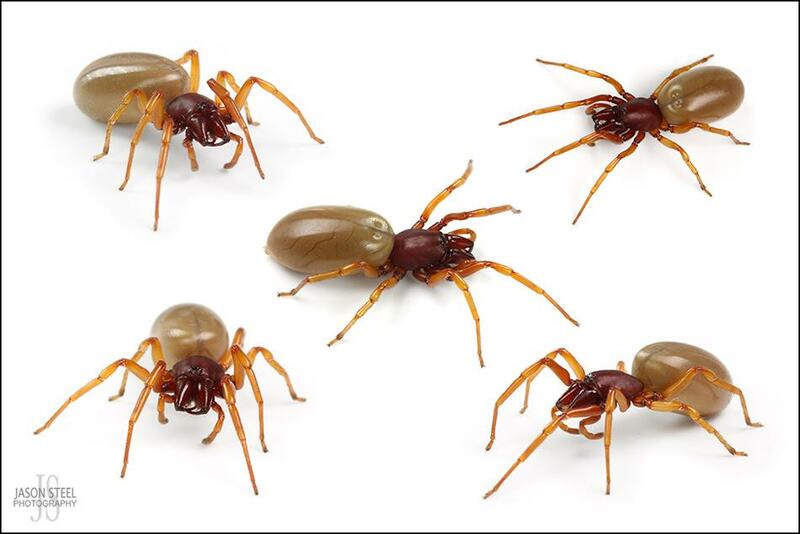 These spiders are well known for their aggression and the bite is reportedly very painful to humans causing swelling and tenderness to the bitten area with the pain lasting for several hours or days. 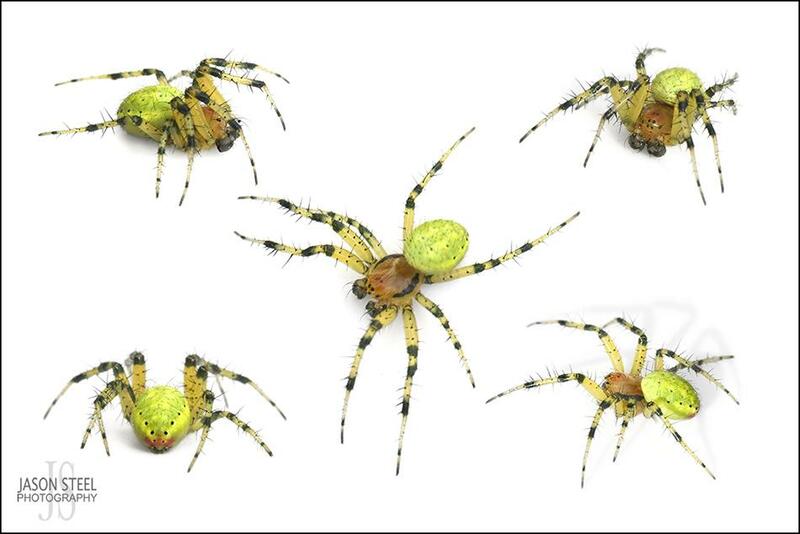 These spiders have also made headlines in the press with more ridiculous headlines such as "Giant green fanged spiders invade homes in UK!". 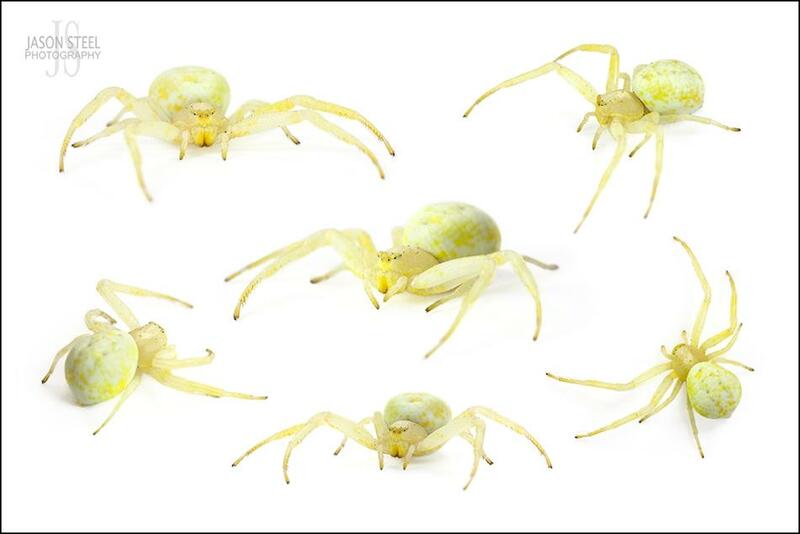 The Crab Spider is a group of free-roaming spiders that don't build webs. Instead they hides on plants and flowers and waits for an unsuspecting victim to land or stumble into its path before grabbing the prey with their powerful front legs and injecting a lethal dose of fast-acting venom. Their prey includes bees, wasps, flies and butterflies, and many of these can be considerably larger in size than the spider itself. 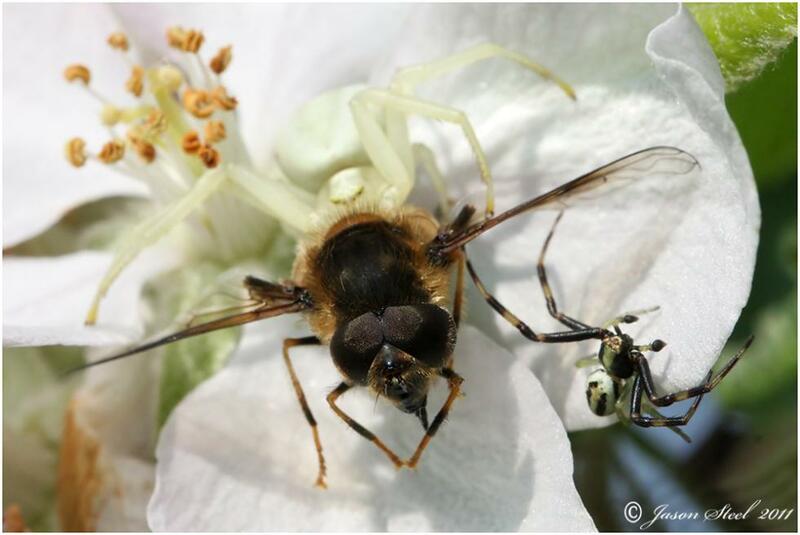 The Crab Spider pictured above is a Xysticus Sp. 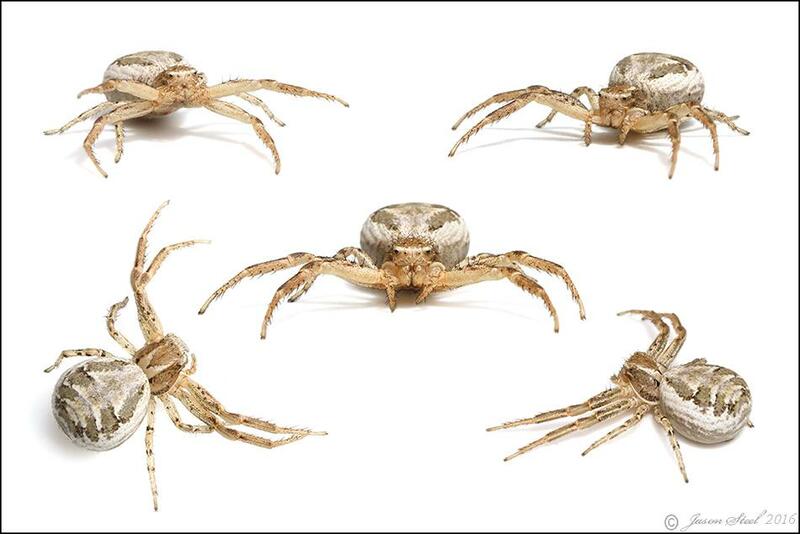 This group of Crab Spiders has 17 different species in Europe. This one is believed to be a Common Crab Spider (Xysticus cristatus) although identifying these species is very difficult without a microscope. 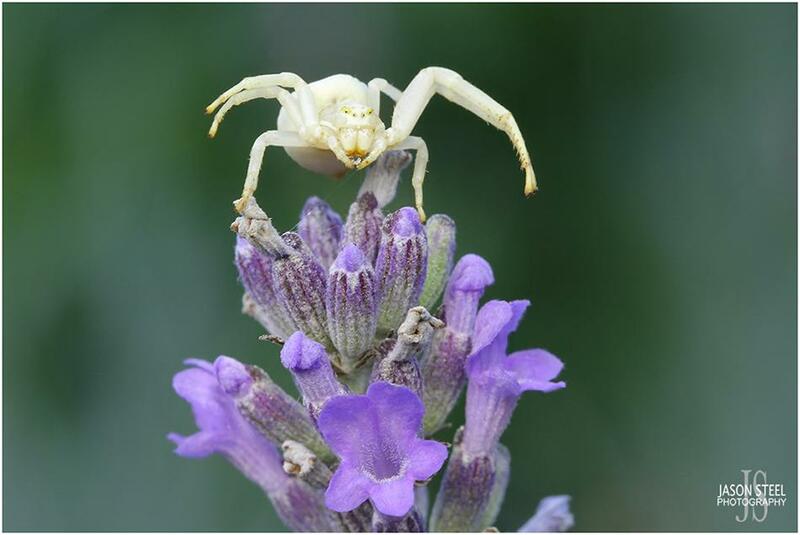 The Common Crab Spider is found in low vegetation and in leaf litter in a variety of habitats across the UK. Females reach a body-length of around 8mm whilst males are smaller at 5mm. May and June are the peak months for this species although they can be found from March to October. Some specimens have even been found in February and December. 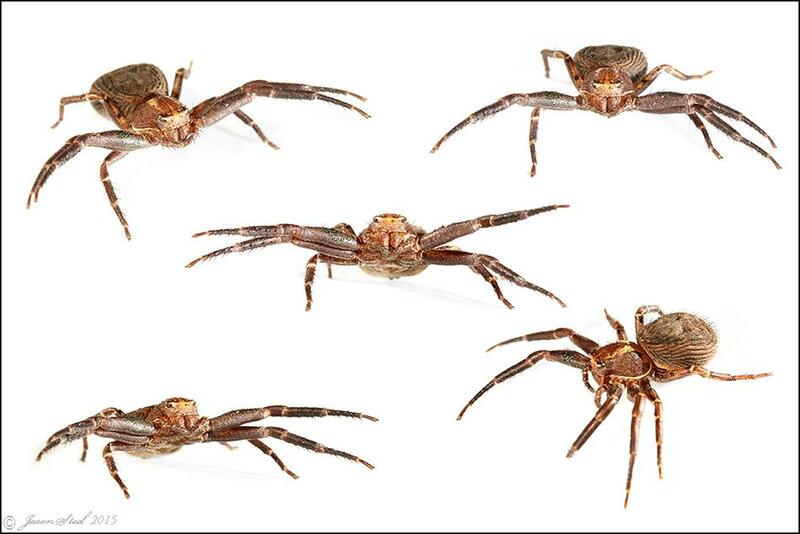 Technically spiders from the group "Philodromus" are Running Crab Spiders and not true Crab Spiders. They do have similar eye and leg arrangements though. 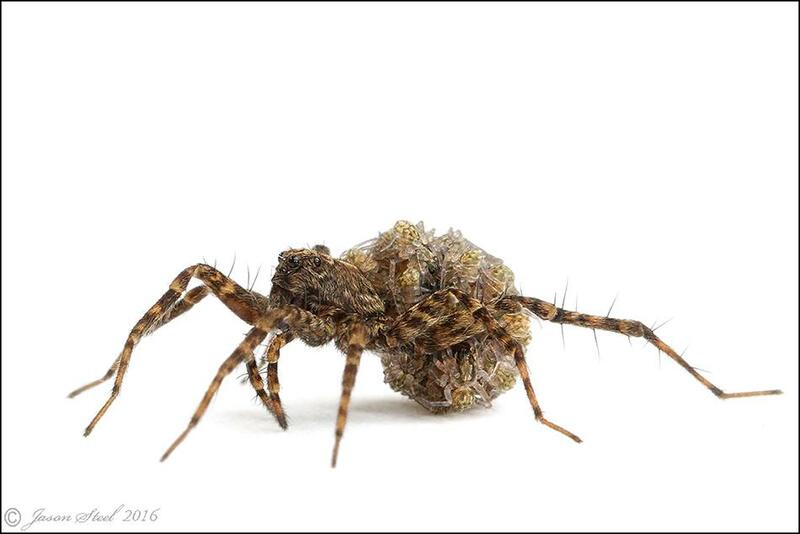 This image is of a small Crab Spider form the group Philodromus Species. It is extremely difficult to identify exactly what species this is but I have been informed that it is most likely to be Philodromus cespitum, the Turf Running Spider. 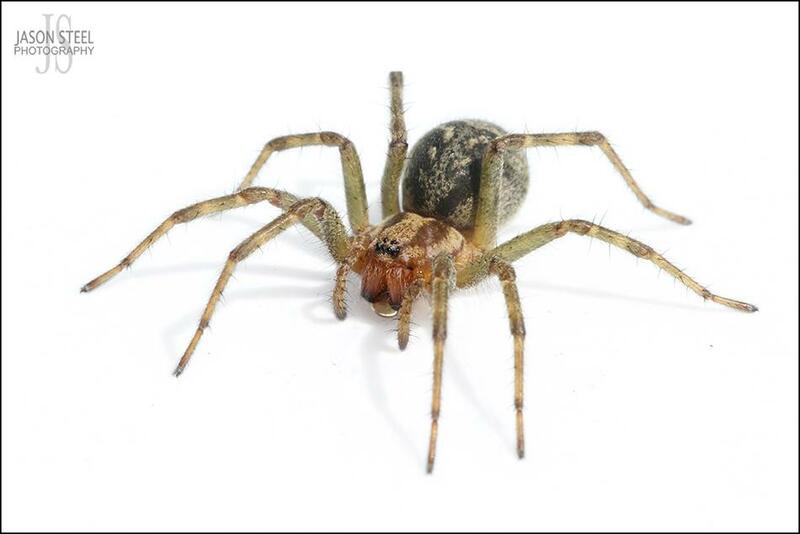 This Running Spider is common throughout Britain especially in the southern half, and is found in low vegetation. It has an average body-length of around 6mm. Philodromus albidus is another common and widespread small Running Crab Spider from the group Philodromus. This specimen had a body-length of just 4-5mm. When species cannot be 100% positively identified, it is common practice to add "cf" in the middle of the Latin name to indicate that whilst the name given is highly likely it cannot be guaranteed without microscopic examination. 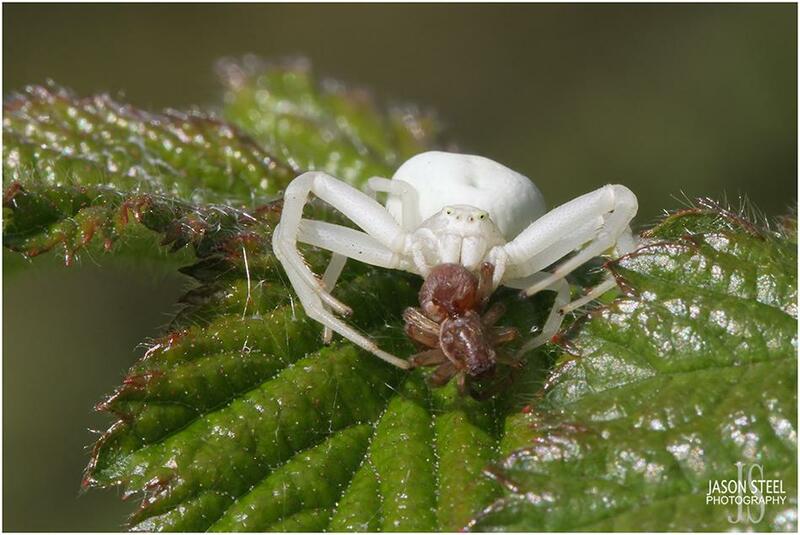 Another small and frequently encountered Running Crab Spider in England & Wales with a body length of 4-5mm for both sexes. Found in a variety of habitats especially low vegetation and bushes. They are also found in homes on occasion. The female is variable in colour but usually brown-yellow while the male has a dark upper body and head and white or light coloured legs and underside. 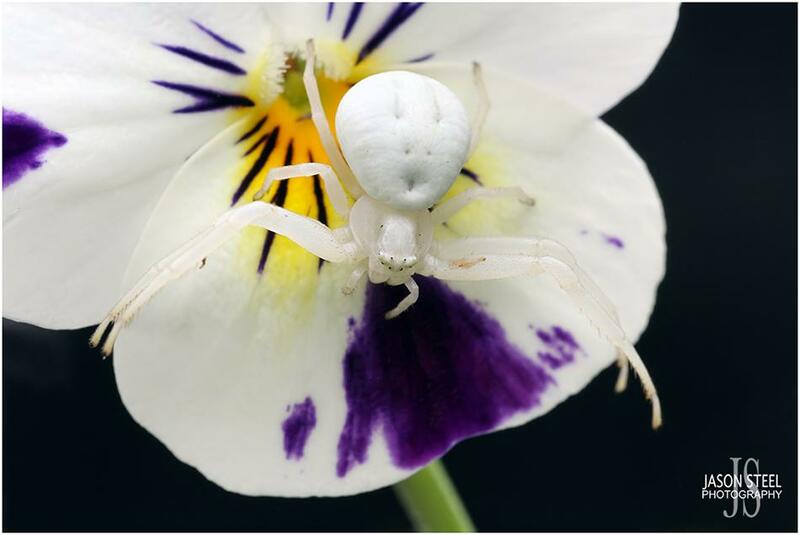 These true Crab Spiders are usually found hiding on white, yellow or pink flowers. 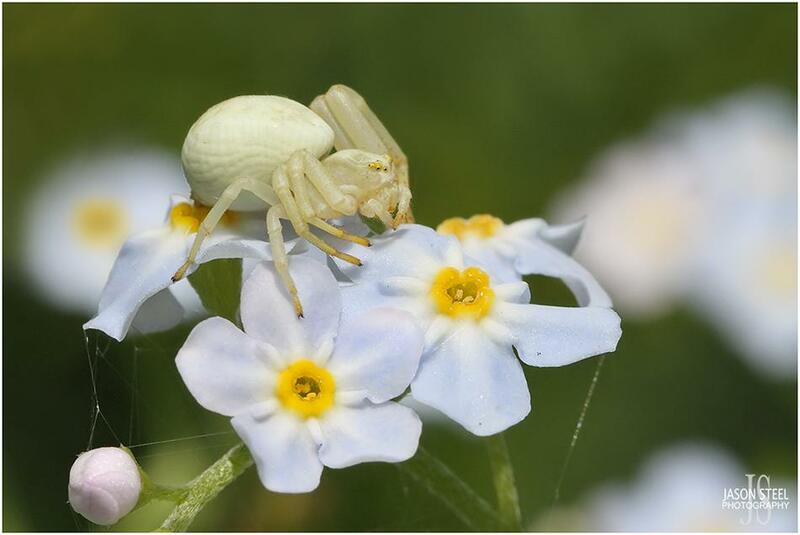 This Crab Spider is an excellent ambush predator with the ability to slowly change its body colour to match the flower that it is hiding on. This colour-changing process can take 6-25 days to complete. 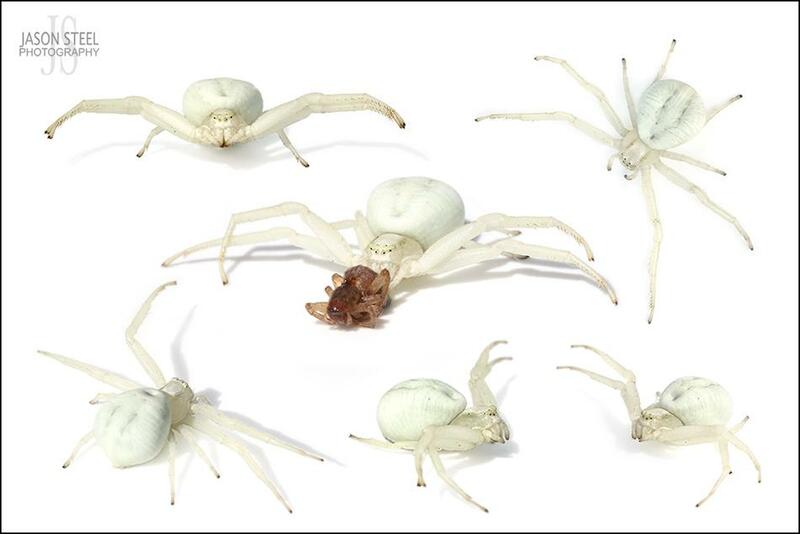 Changing from yellow to white can be done fairly quickly as the spider just has to secrete the yellow pigment. 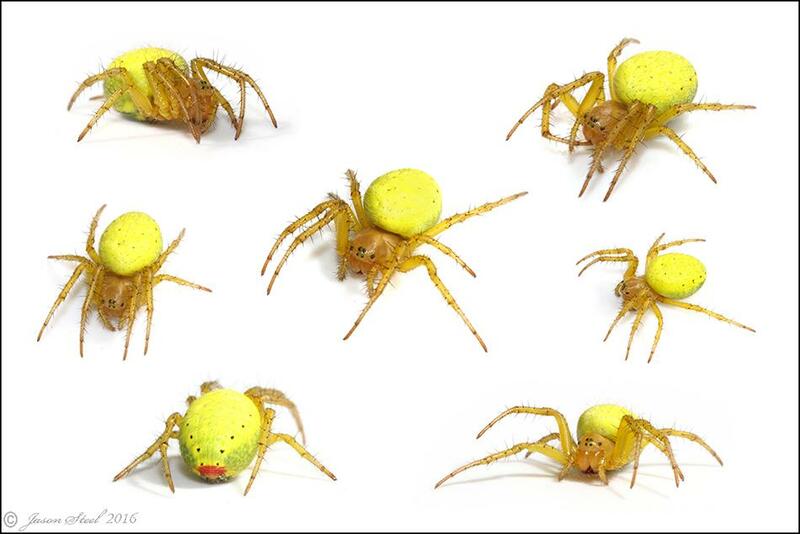 However changing from white to yellow takes far longer as the yellow pigment must be built up inside the spider. This species has a wide range across Europe and the USA. In the UK it is common across the southern half of Wales & England especially around London and the south-east. Usually active from May-August but can be seen from April-September. 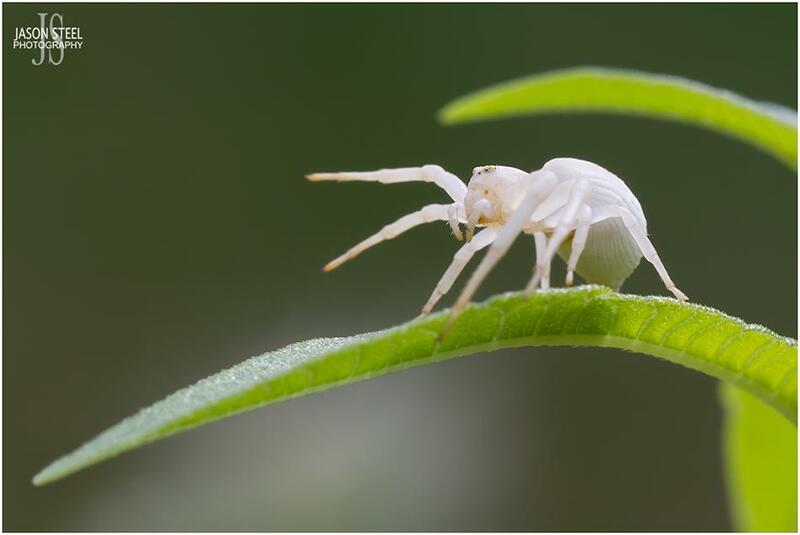 The male Crab Spider is much smaller than the aggressive and powerful female. Male spiders often risk injury or death during any attempt to mate with the female. This male waits until the female is pre-occupied with killing a large hoverfly before jumping up and seizing this opportunity to mate. 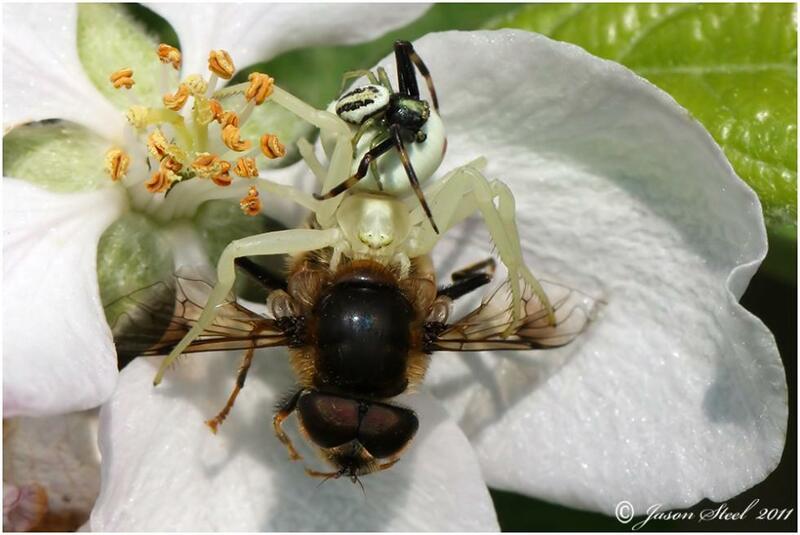 Some Crab Spiders are also known to tie up the female in silk-like web before attempting to mate. 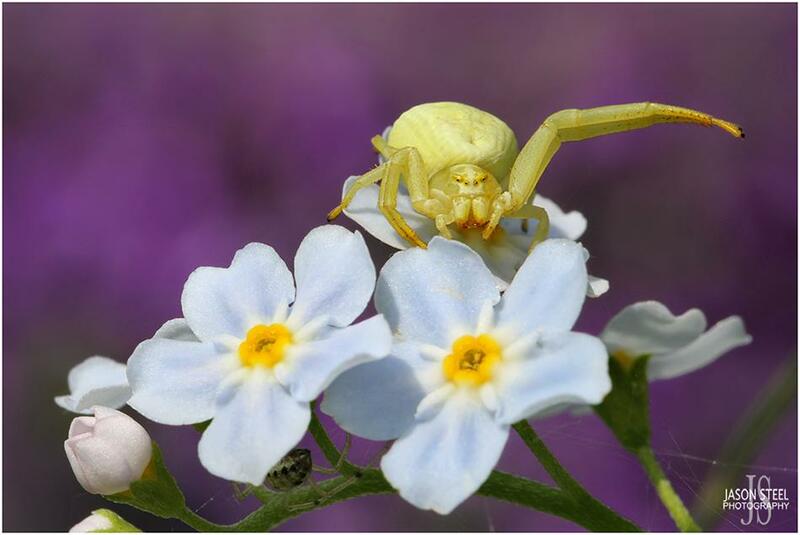 Female Flower Crab Spider morphing from white to yellow. Female Flower Crab Spider. Still holding on to her lunch in the centre photo. 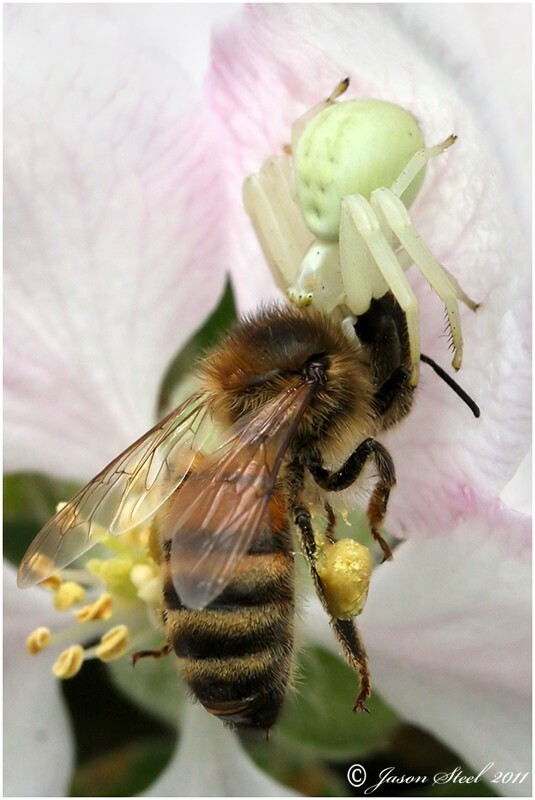 Female Flower Crab Spider (Misumena vatia) feeding on a smaller spider. Female Flower Crab Spider (Misumena vatia) waiting to ambush its prey by the side of my garden pond.. 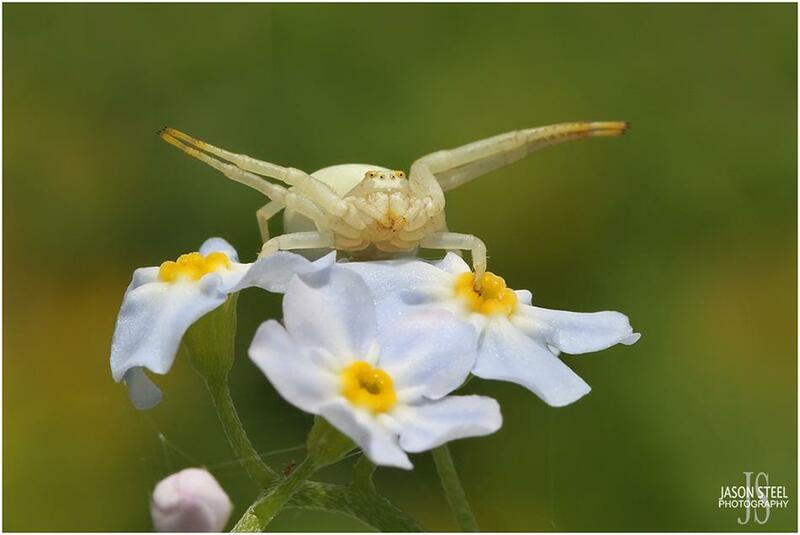 Flower Crab Spider (Misumena vatia) waiting to ambush its prey. Large 8mm female Spitting Spider found in my bathroom June 2008. 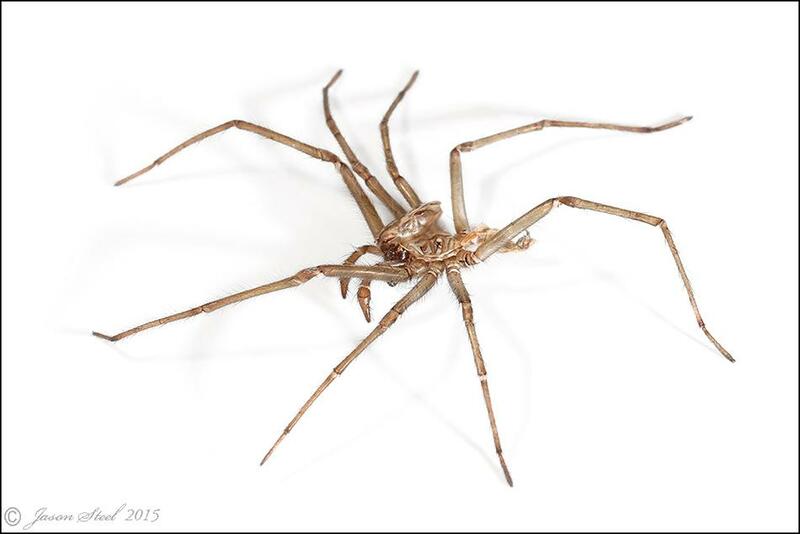 The Spitting Spider is a small but distinctive species with a body-length of around 3-6mm or occasionally larger. They are usually found in the southern half of England where they are described as "uncommon". The head and body are pale creamy-brown with dark brown or black spots and markings. 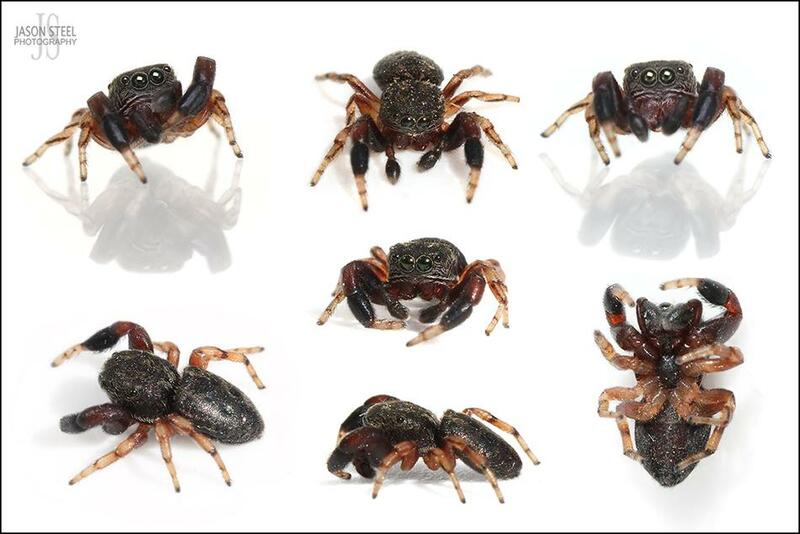 This spider gets its name from its unusual hunting method. As a slow moving spider that doesn't make a web to catch its prey, the Spitting Spider has developed another method of hunting. This spider has silk glands connected to its venom glands. When close enough to its prey the Spitting Spider can spray sticky silky strands soaked in venom at its prey or in self defence at an attacker. The victim is quickly stuck to the surface and unable to move. 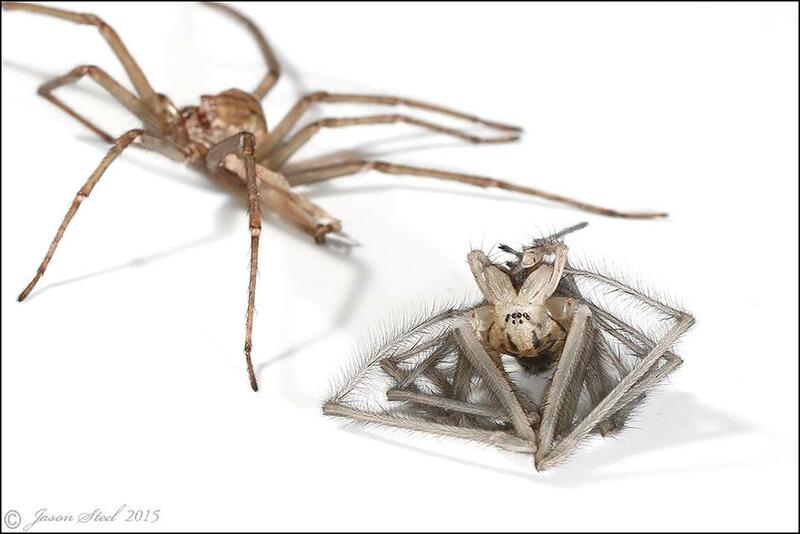 The Spitting Spider then moves in for the kill. Once dead the prey is removed from the sticky mess and eaten. Small 3mm Spitting Spider found in my bedroom August 2018. 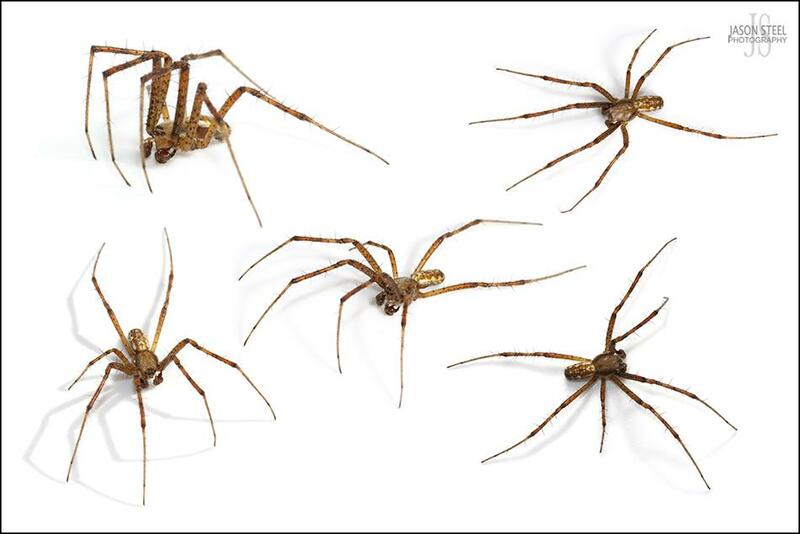 In the UK Spitting Spiders are usually only found in houses and other heated buildings rather than outdoors. 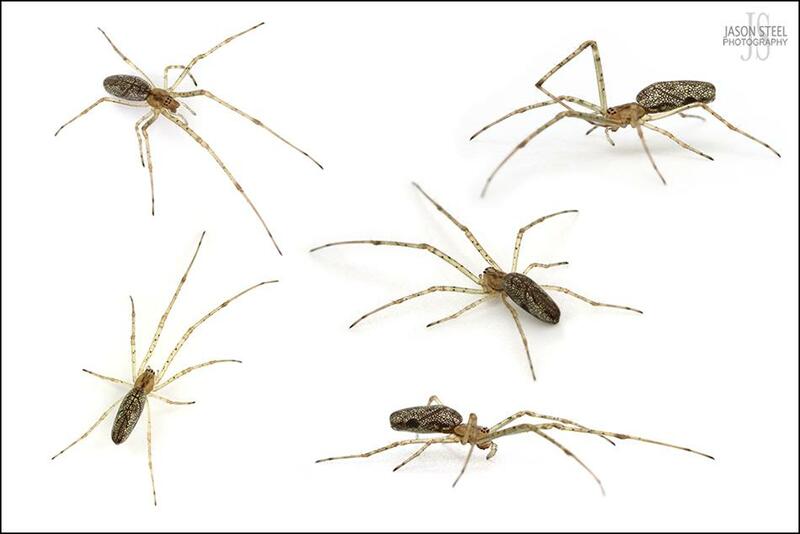 Female Spitting Spiders do not reach adult maturity until two or three years of age. 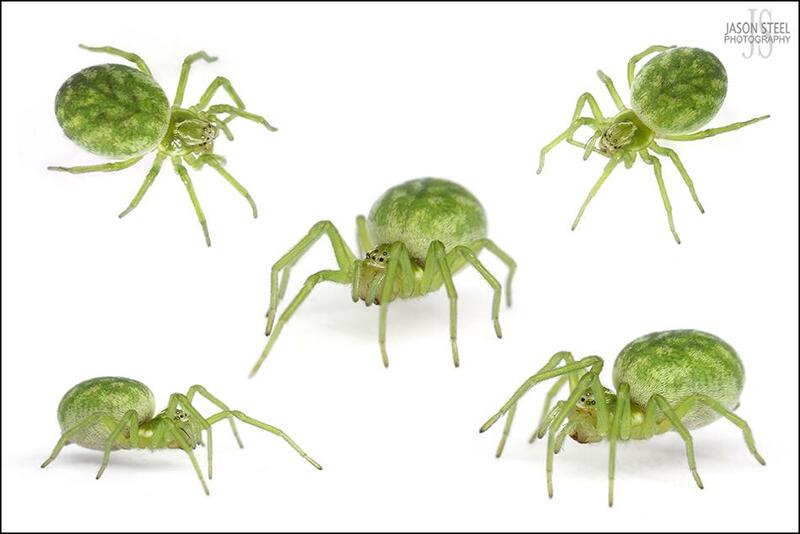 These small non-native spiders are often used in greenhouses and garden centres to control Greenfly and Whitefly. 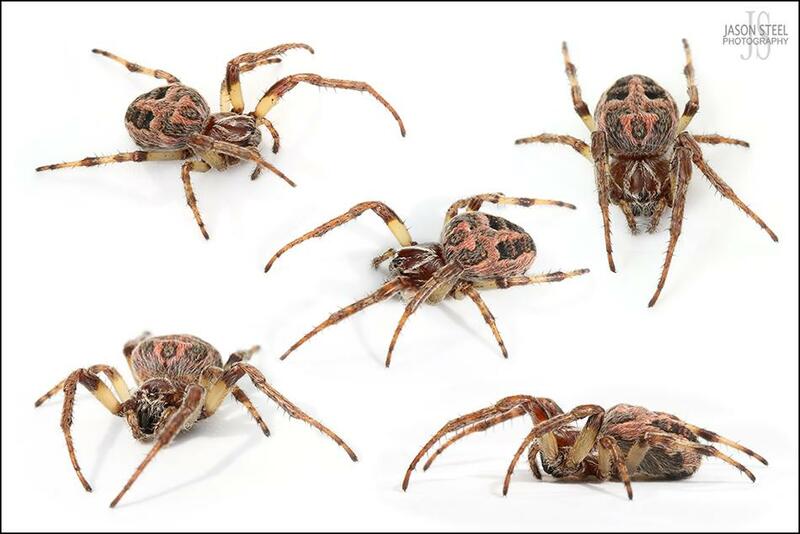 They are one of the few non-venomous spider species. Females can have a maximum body-length of 6mm. Feather-Legged Spider hanging upside down in its web. The Natural History Museum previously displayed on its website, 14 documented cases of bites from domestic spiders to humans in the UK. 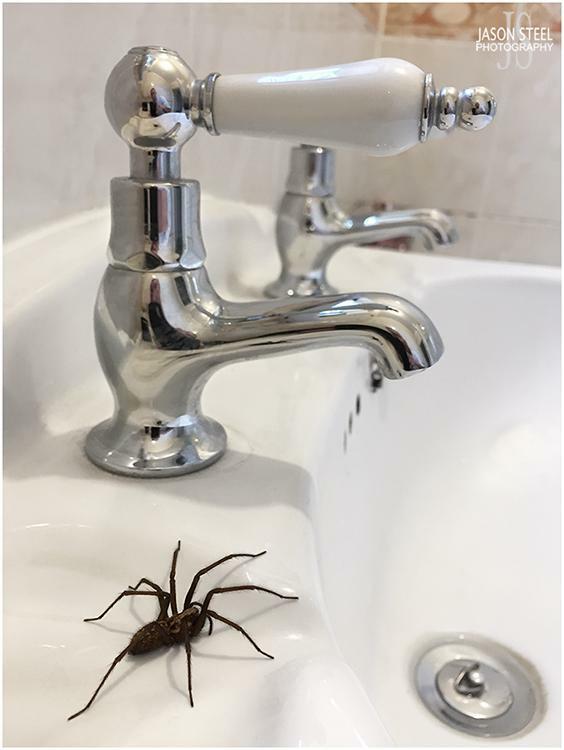 The NHS gives the following advice regarding spider bites: In most cases, spider bites do not require medical attention and symptoms can be treated at home, by washing the bite area with soap and water. Applying a cold, moistened flannel or cloth on the bite can help reduce any swelling. Infections are usually caused by scratching so don't scratch the bite. If necessary, take painkillers, such as paracetamol or ibuprofen for any pain. In rare cases though, wasp / bee stings can cause anaphylaxis, a serious allergic reaction. Anaphylaxis requires urgent medical treatment. As yet there have been no prooven cases of any spider bites in the UK that have resulted in anaphylaxis, although in theory it is possible. Seek medical advice if there is a considerable swelling, blistering or pus. Are there any effective spider repellents? As far as I'm aware there are no proven spider repellents. There are conflicting reports on whether any of the deterrents you can buy are effective or not. Horse-Chestnuts are one of the natural deterrents that some people swear by, claiming that a bowl of conkers left by doors and windows will deter spiders from entering the house. In order for this to have any effect the cases of the conkers would need to have holes drilled in them to release the odour of the saponin compound found in the conkers. This may or may not be effective on some species of spider such as the Giant House Spider. Spraying peppermint oil & vinegar around doors and windows, whilst others claim using WD40 has the same effect. Lavender, citronella, cinnamon, garlic, eucalyptus sprigs and tea tree oil all have their own supporters that claim to serve as spider repellents. 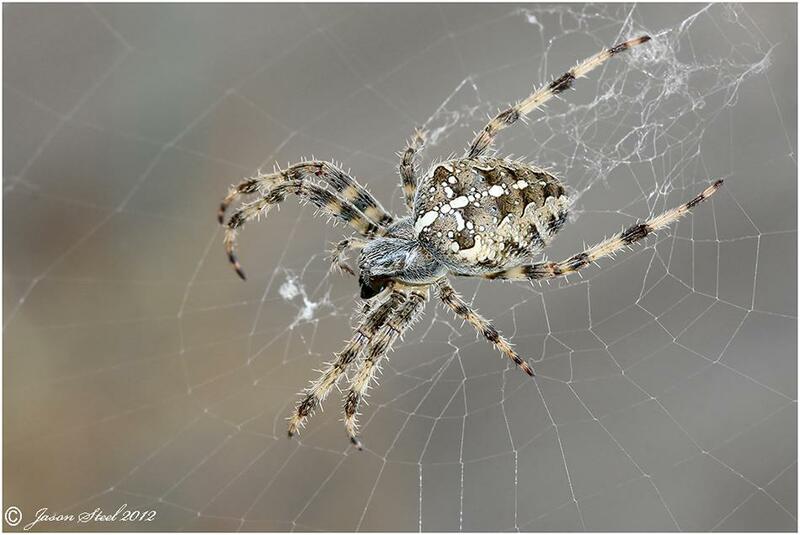 Although I have personally photographed spiders in my garden living on both peppermint and lavender plants. 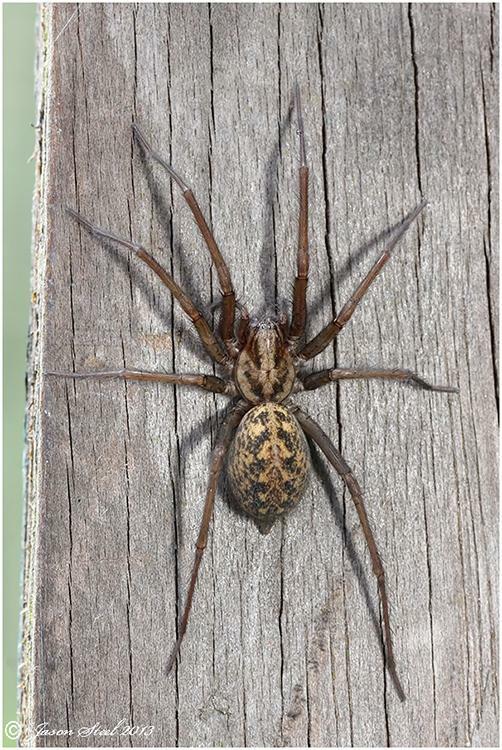 I have also seen spiders living on both Walnut and Horse-Chestnut trees so if spiders are not repelled by these plants and trees outside it is hard to believe that they would be repelled by them indoors either. Unfortunately spiders do not have scent glands that interpret smells in the same way that mammals do and they use touch to smell objects. So it is unlikely that the scent of any claimed repellent will be effective. 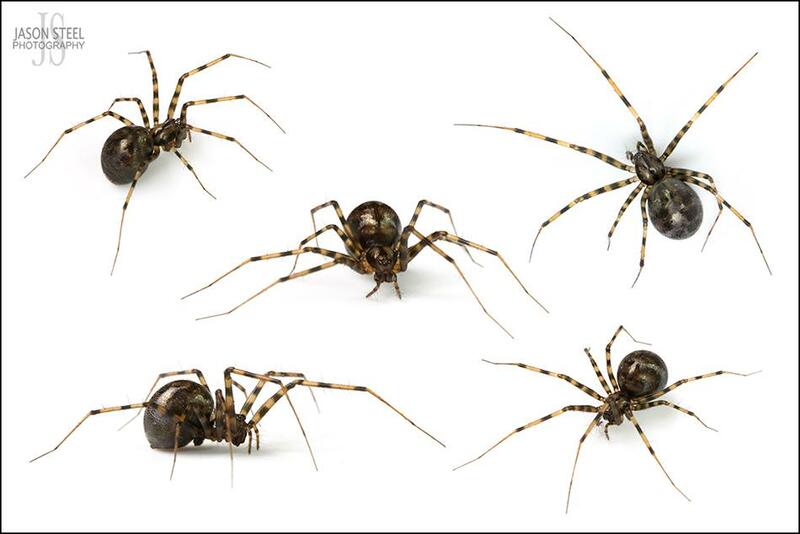 There are some things you can do that may help to reduce the number of spiders in your home. Keep your house clean! Regular dusting and vacuuming can collect dust particles which can provide a food source for insects that spiders feed on. 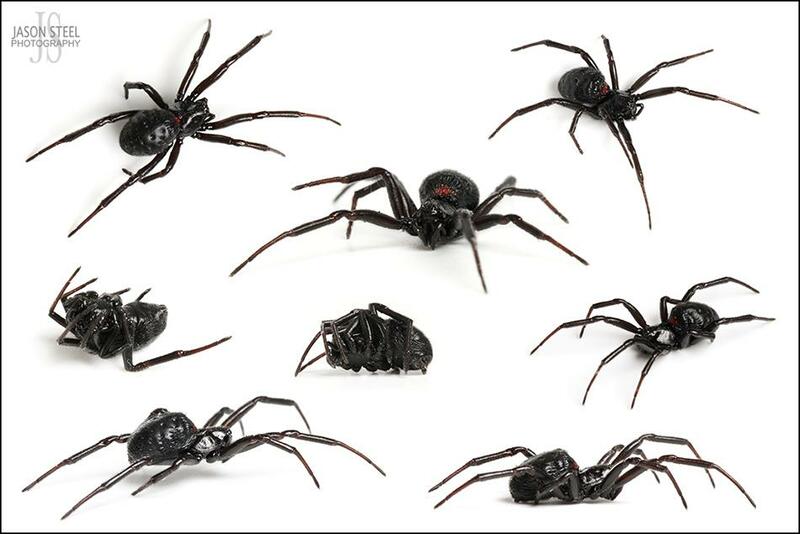 Vacuuming also collects any egg-sacs which spiders may have deposited around your home. Keep doors and windows closed as the summer comes to an end and temperatures start to drop, especially at night. Fill any holes and gaps that insects could use to enter your home. Keep the outside of your home free from hanging / climbing plants such as Ivy, and remove any collected leaves and debris from the bottom of your outside walls as these can provide excellent hiding places for spiders. Porch lights will attract moths and other flying insects at night, which will in turn also attract spiders to feed on the moths. 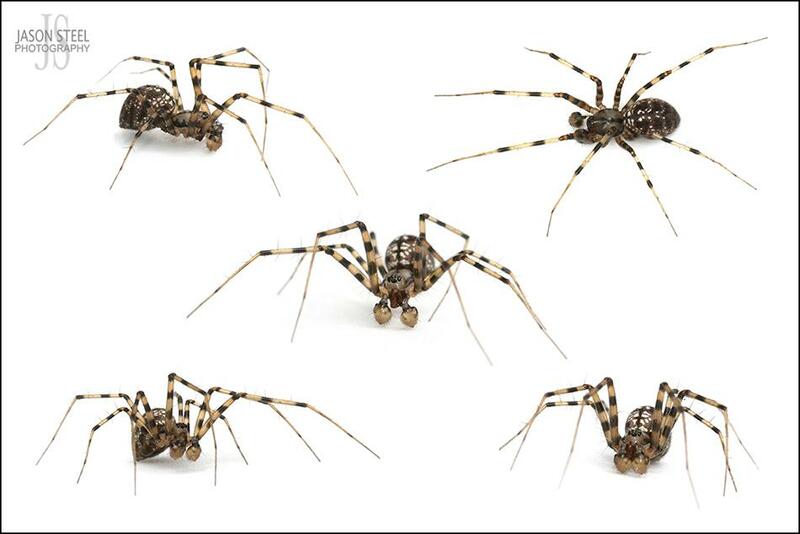 So you may want to leave these lights off if you're bothered by spiders.